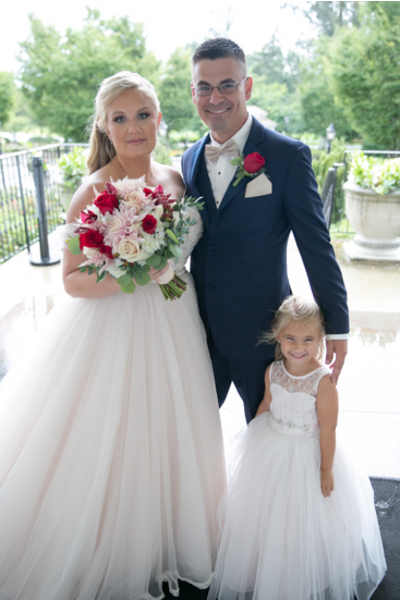 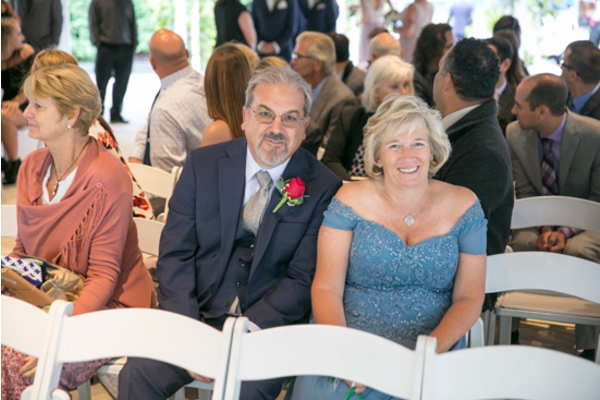 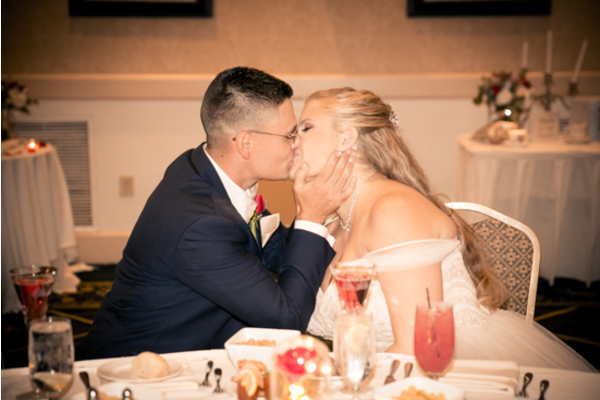 Congratulations to Nicole and Glenn on their recent marriage! 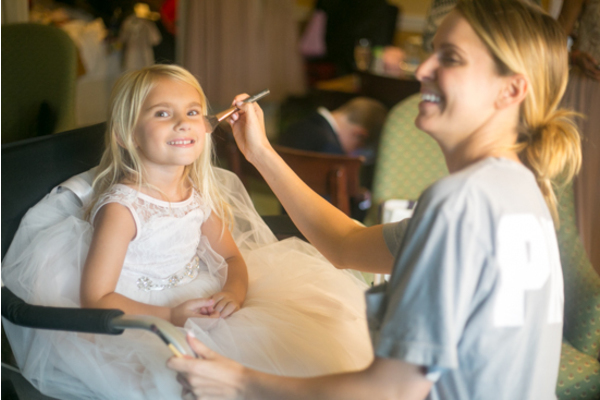 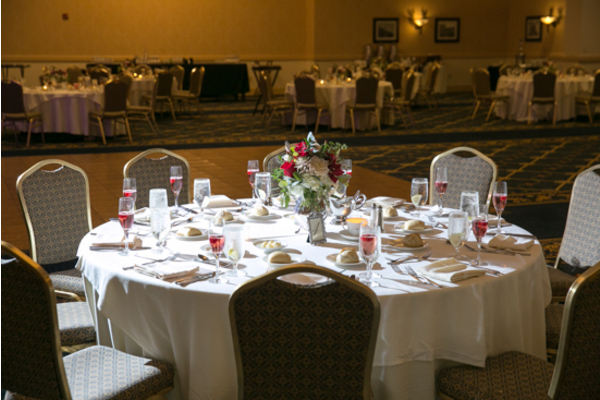 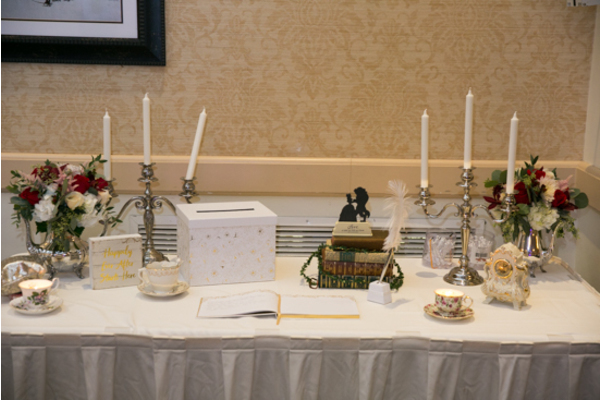 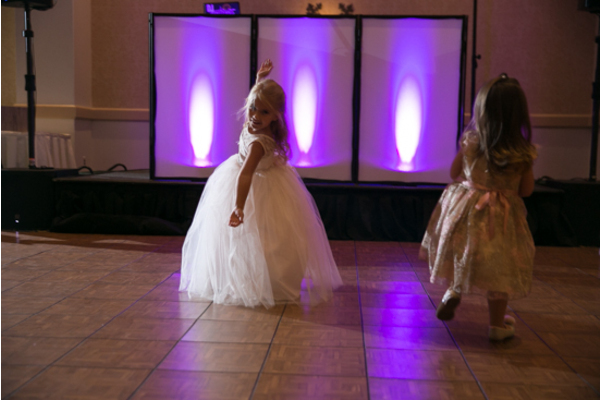 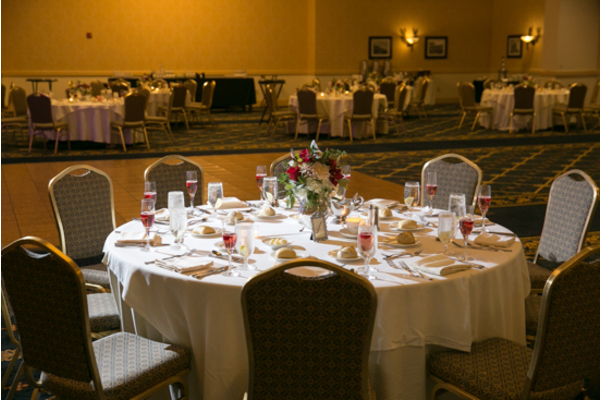 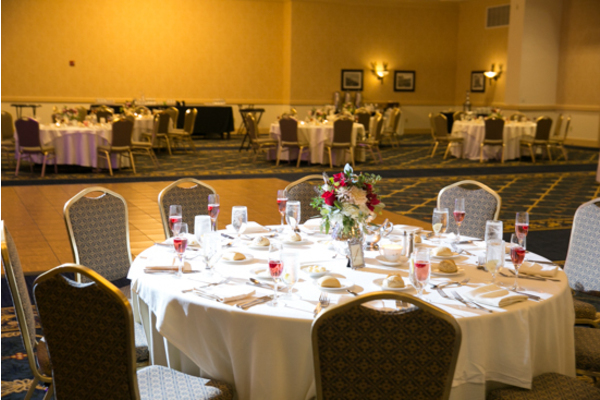 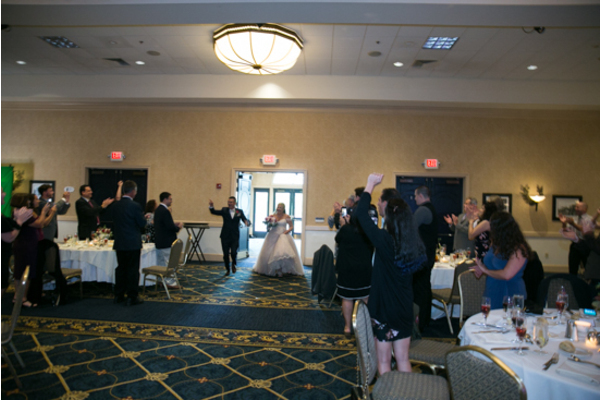 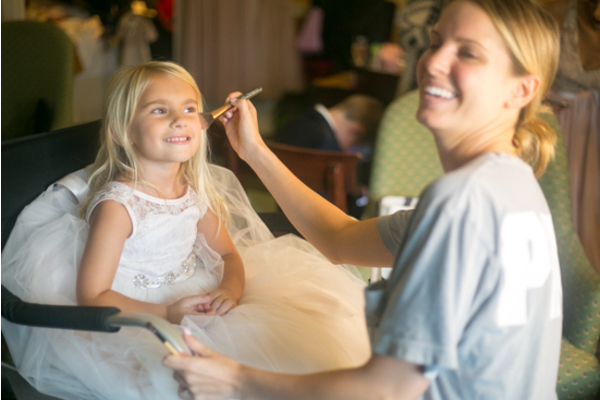 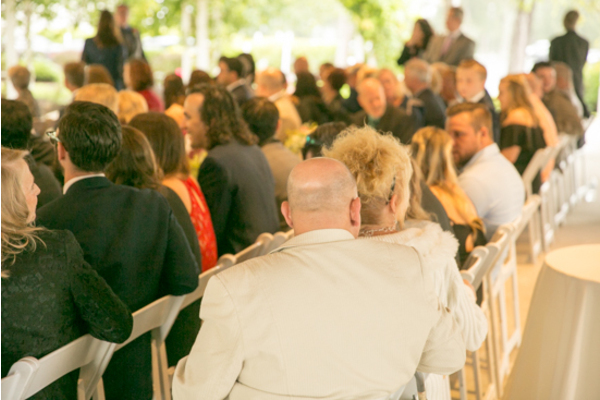 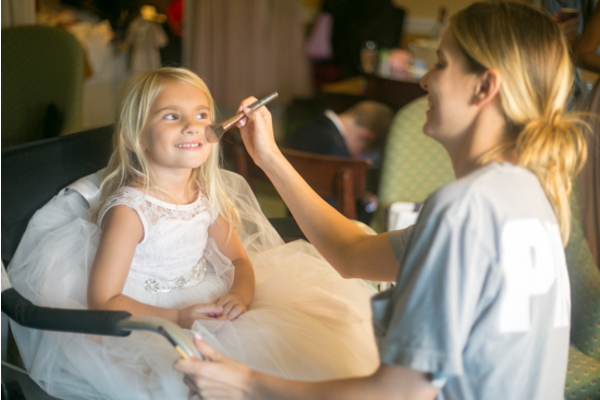 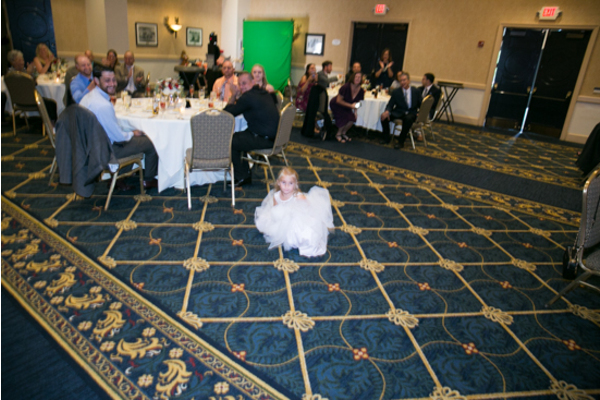 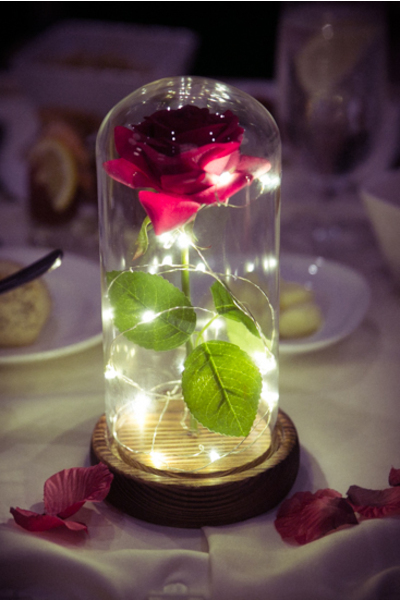 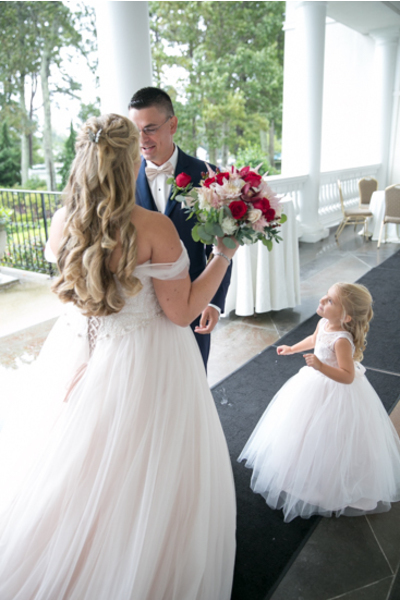 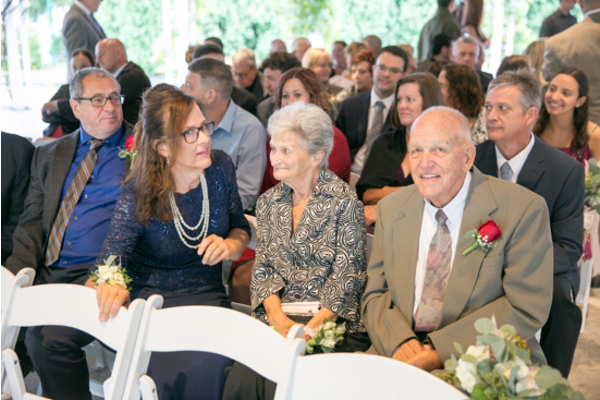 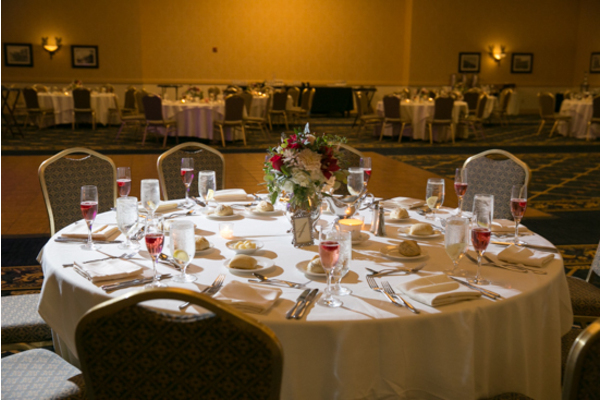 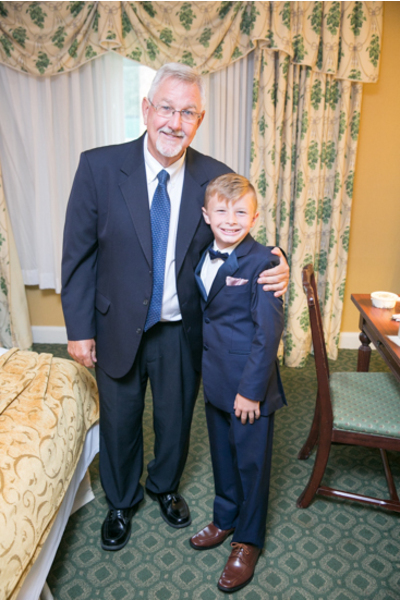 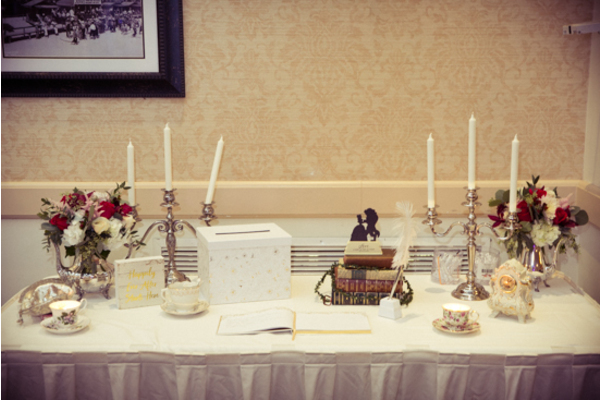 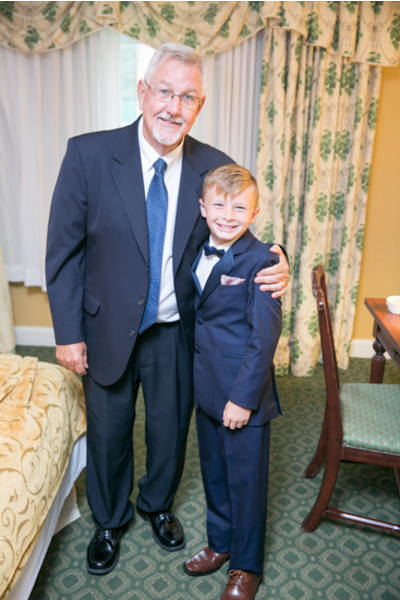 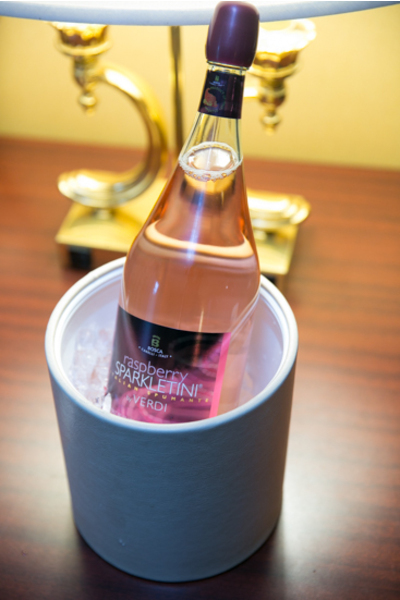 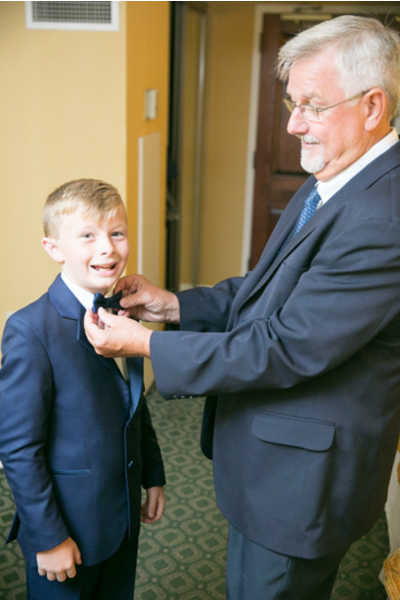 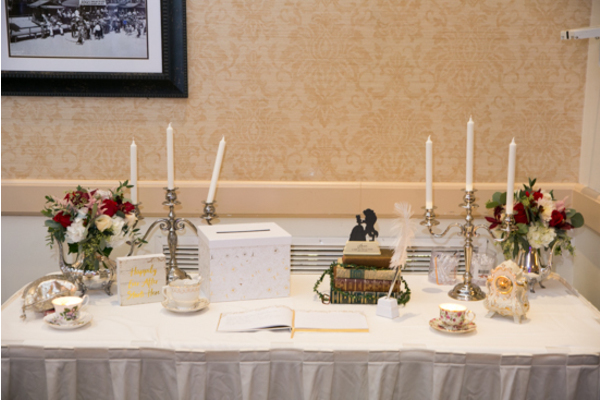 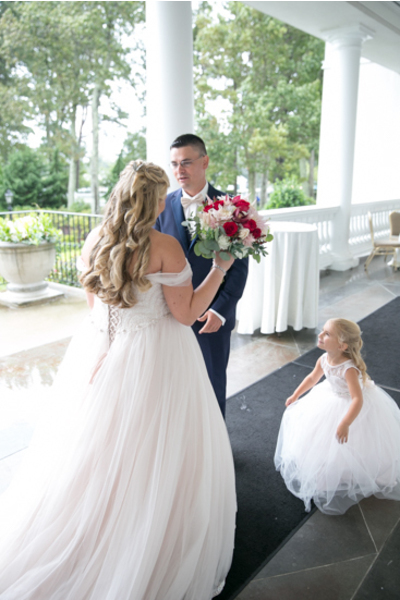 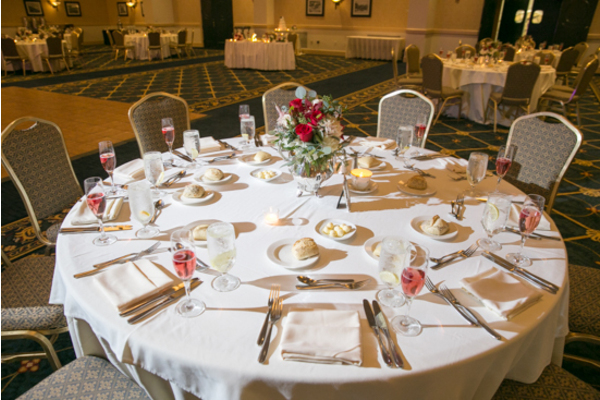 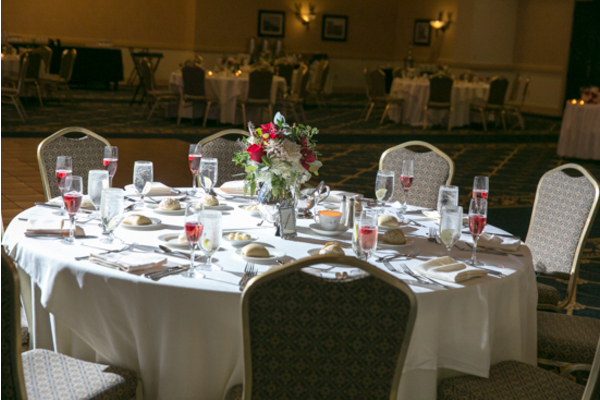 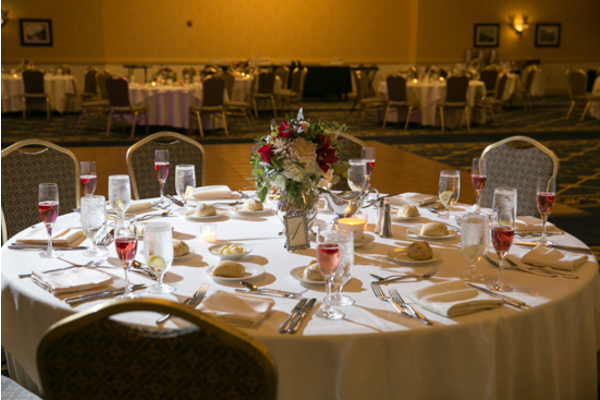 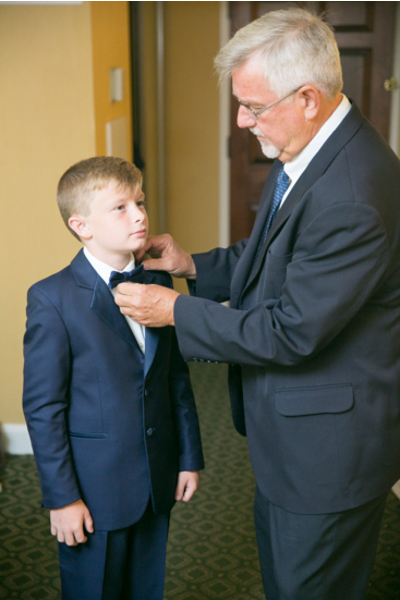 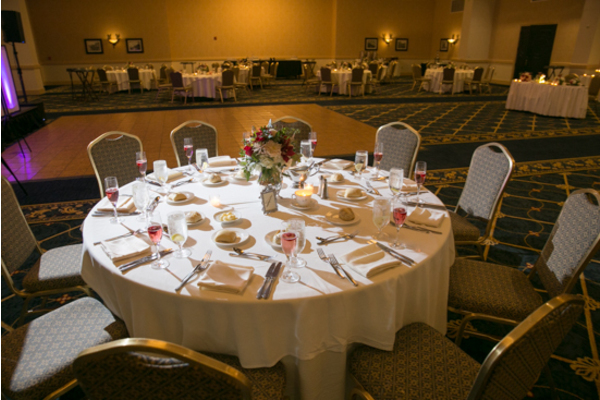 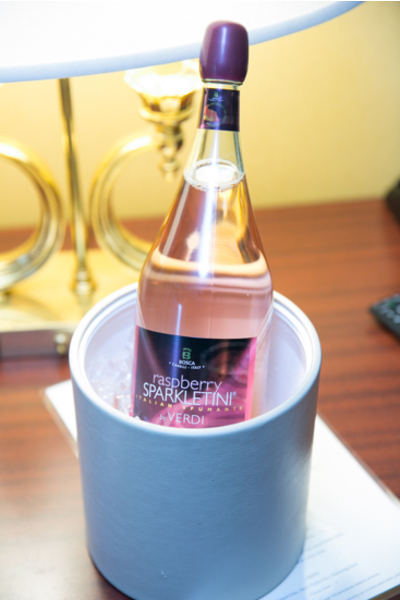 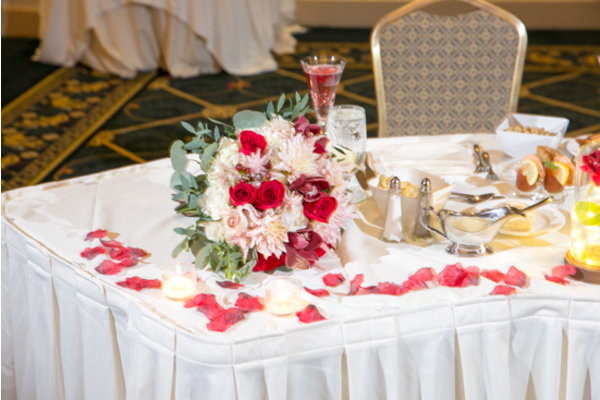 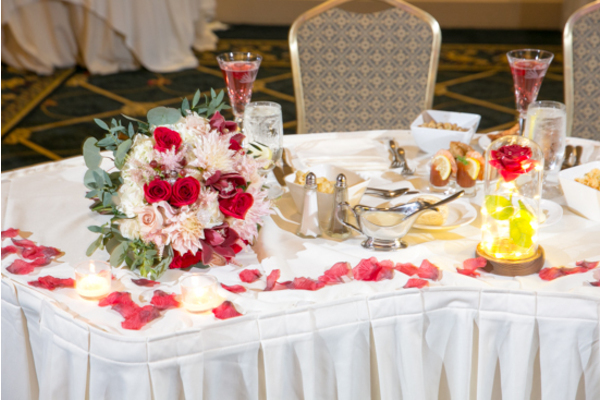 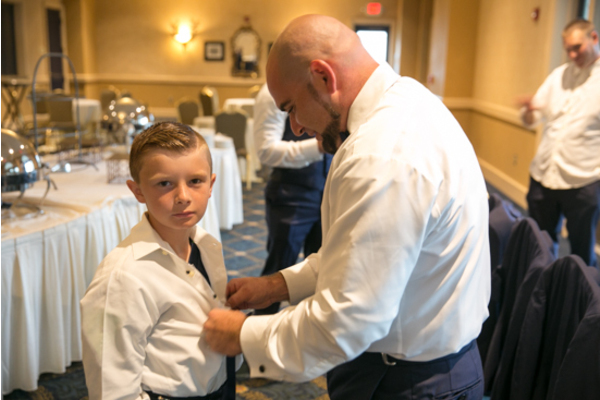 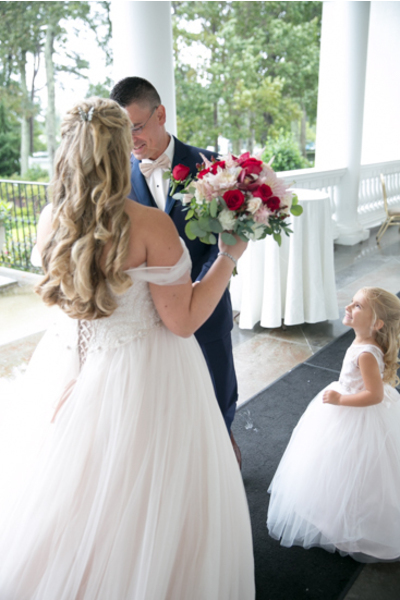 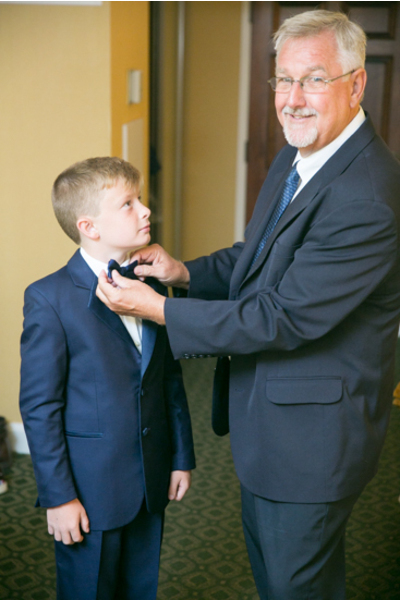 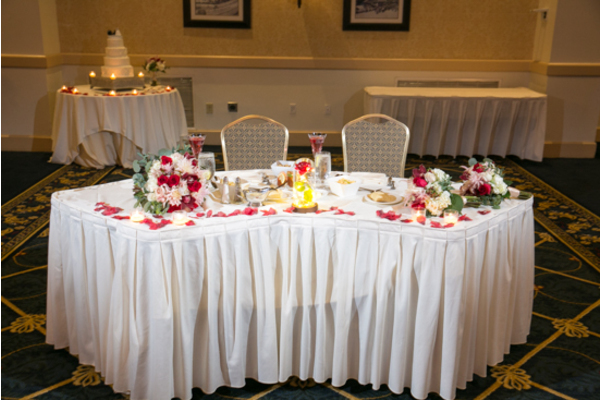 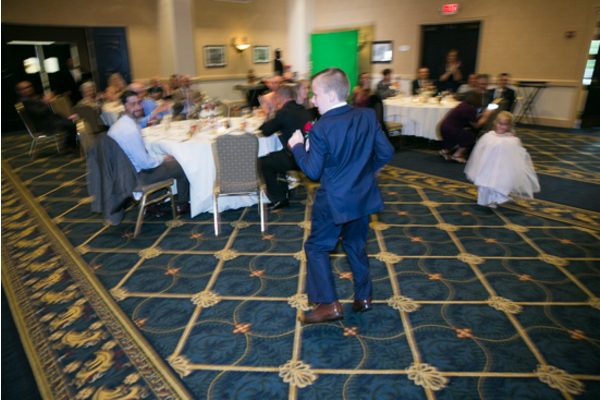 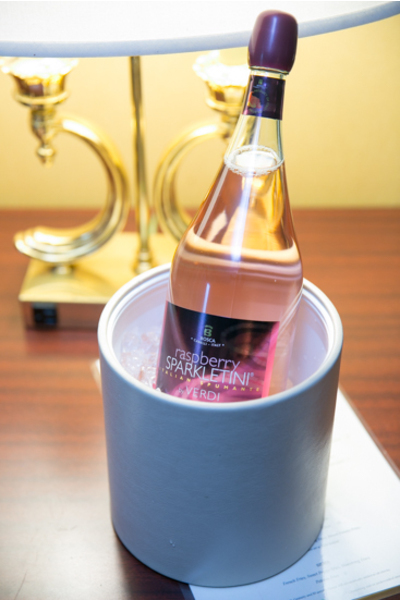 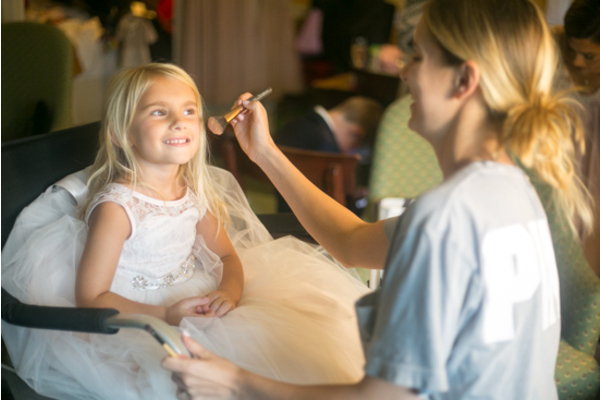 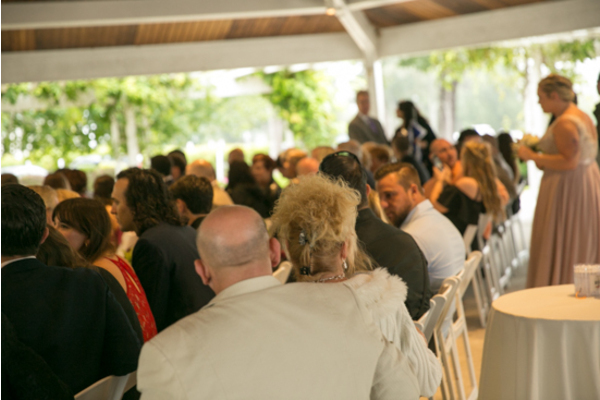 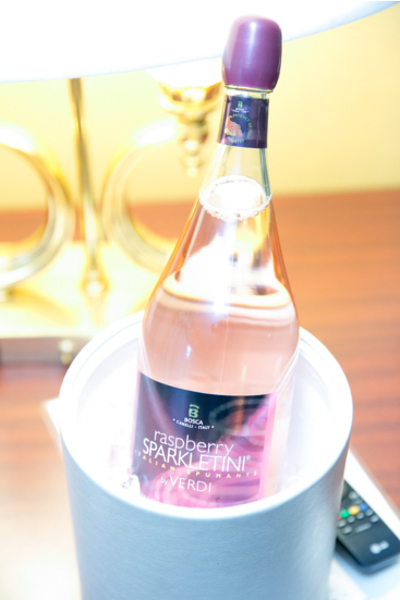 This September celebration was held at Stockton Seaview Hotel and Golf Club in Galloway, NJ. 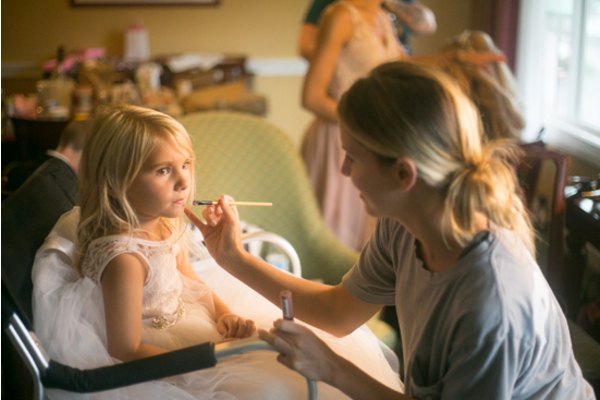 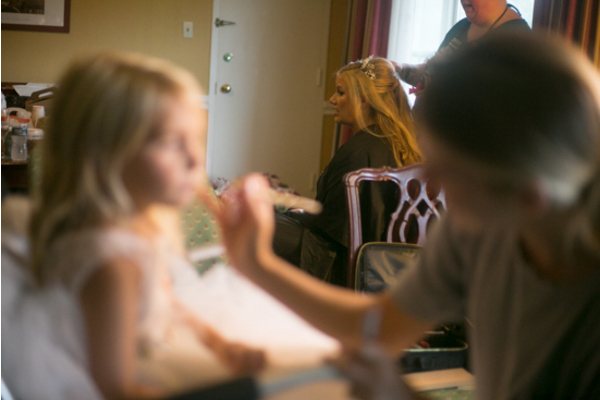 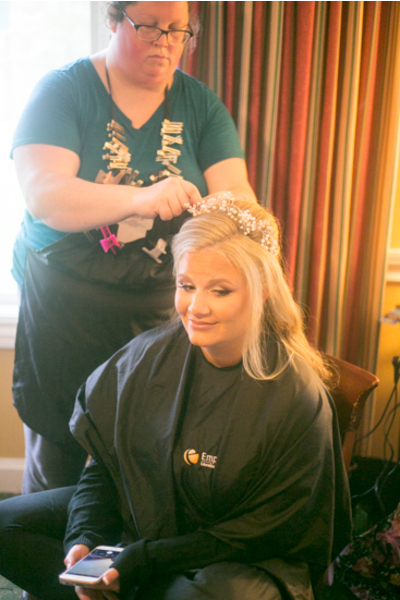 To start the big day, Nicole and her bridesmaids spent quality time together getting ready and sharing champagne. 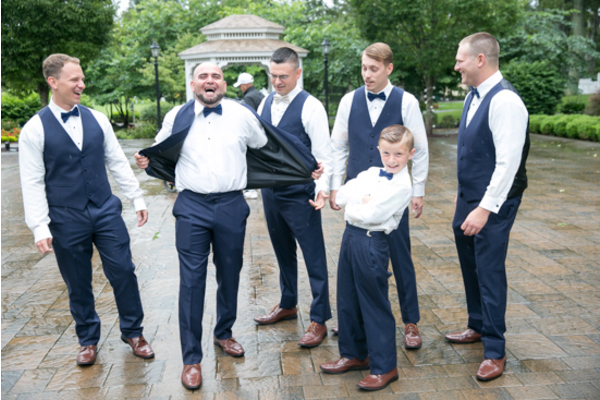 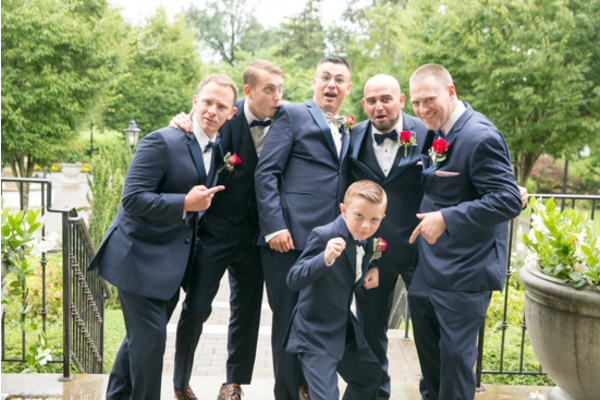 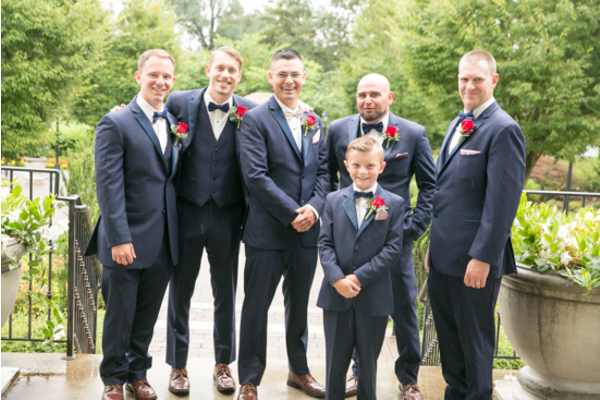 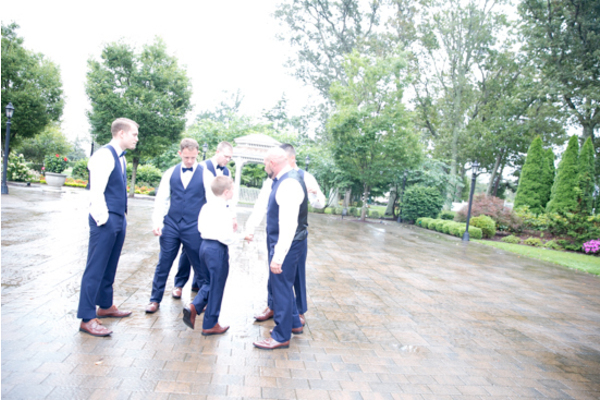 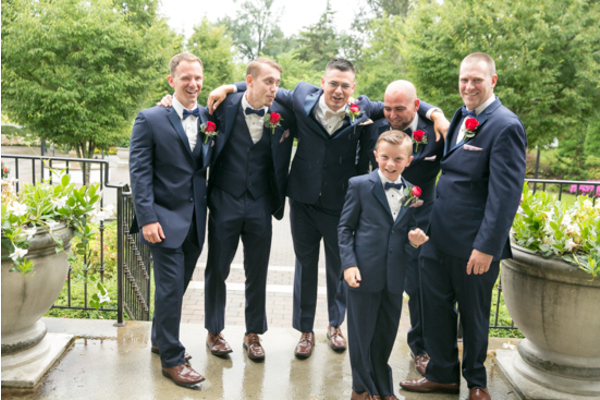 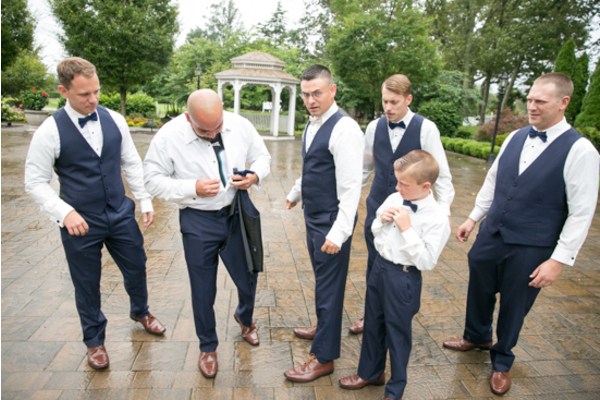 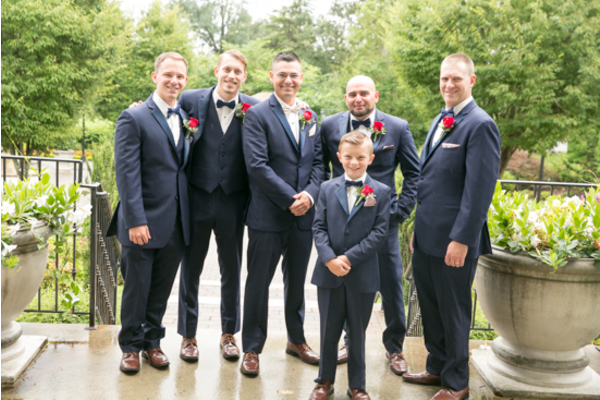 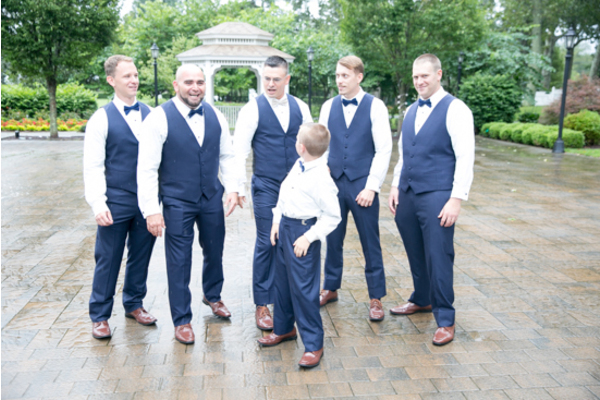 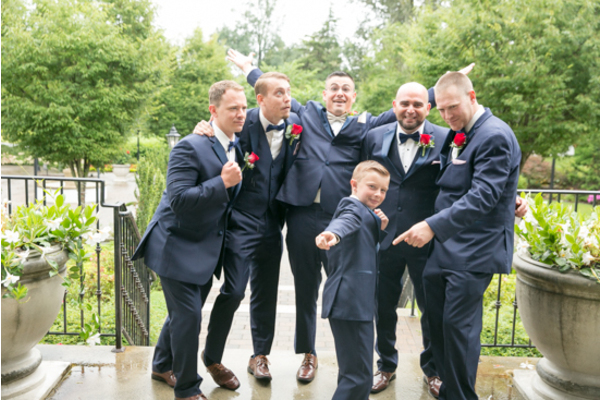 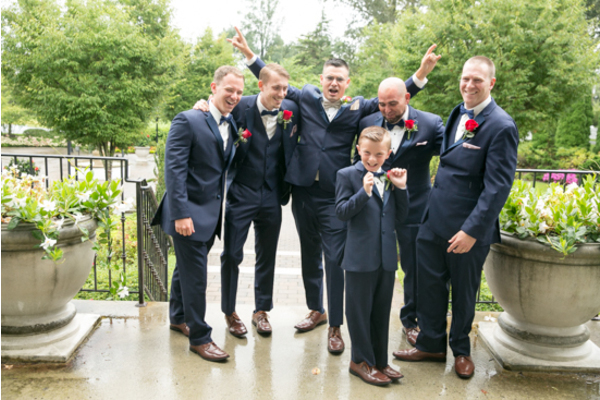 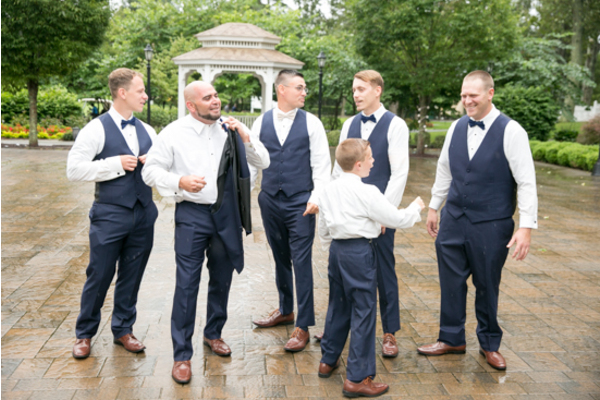 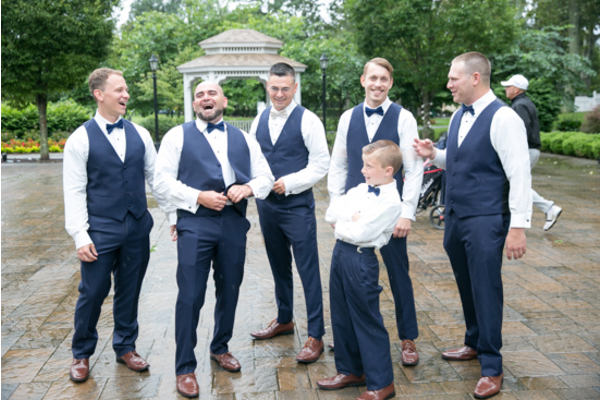 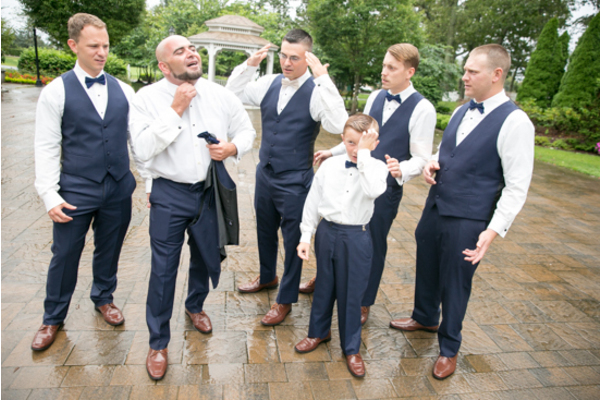 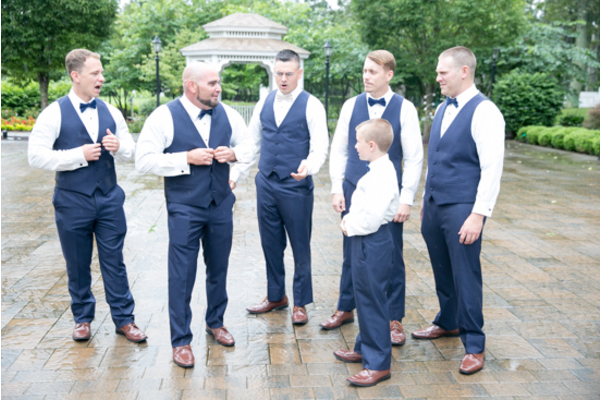 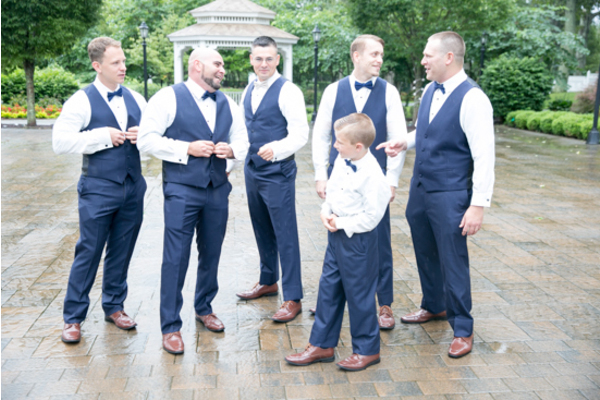 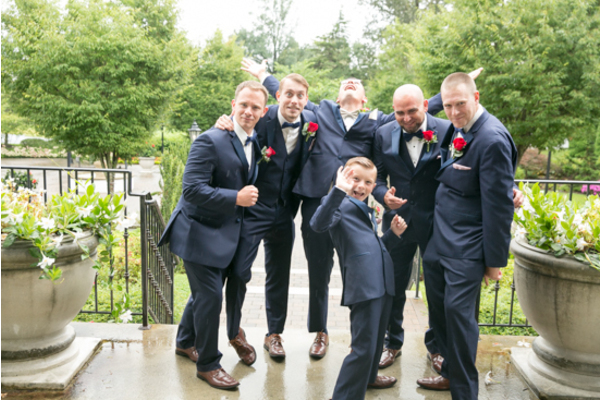 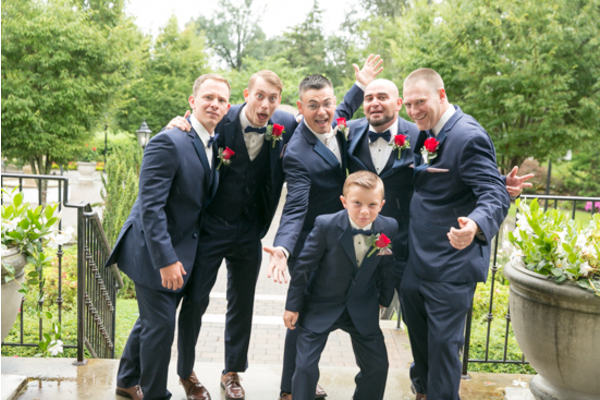 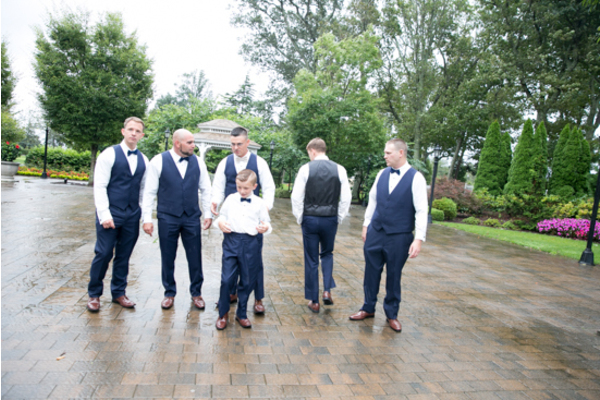 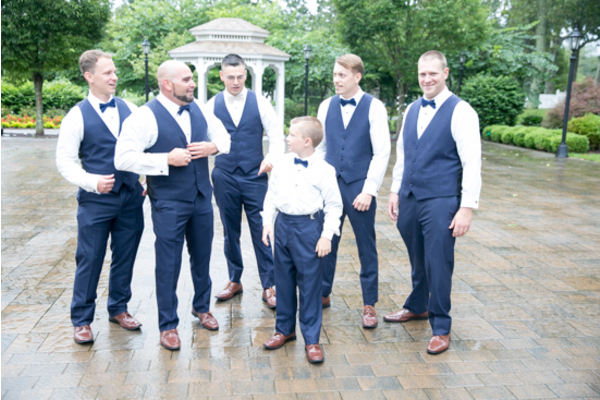 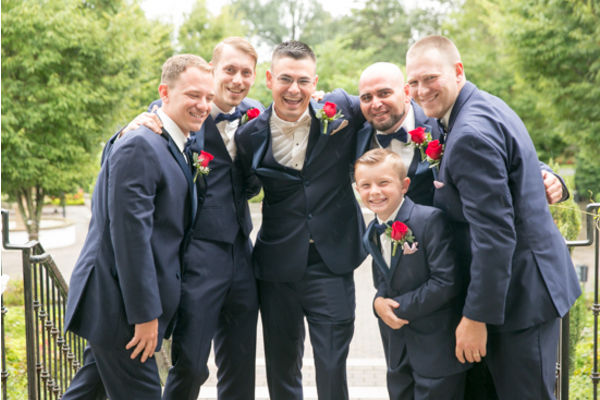 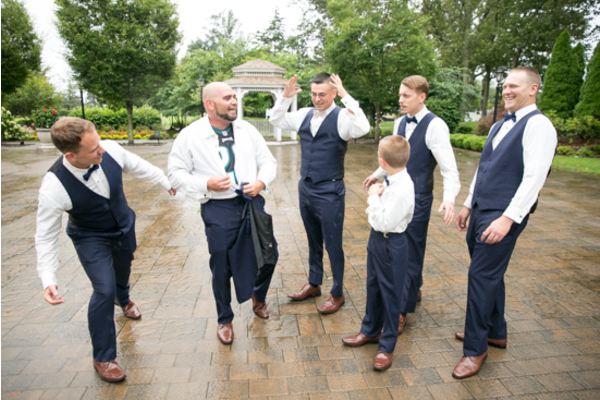 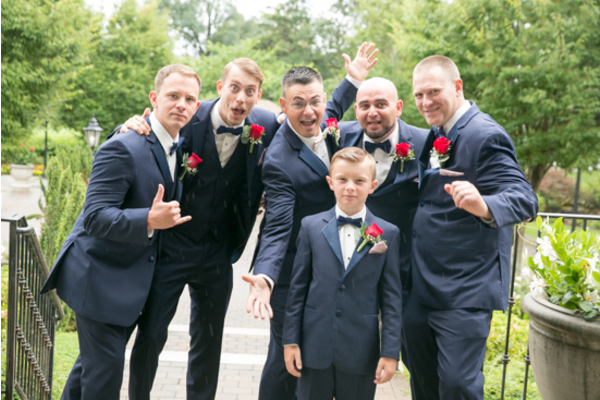 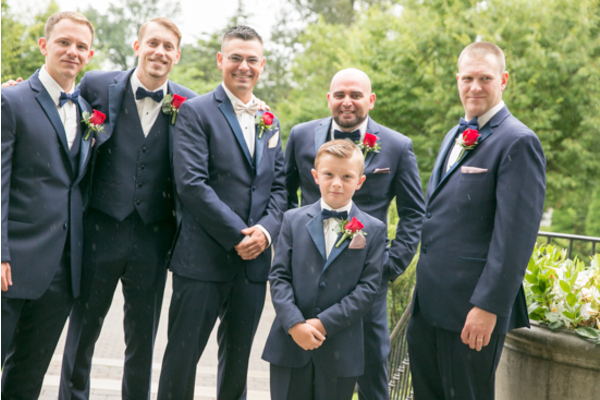 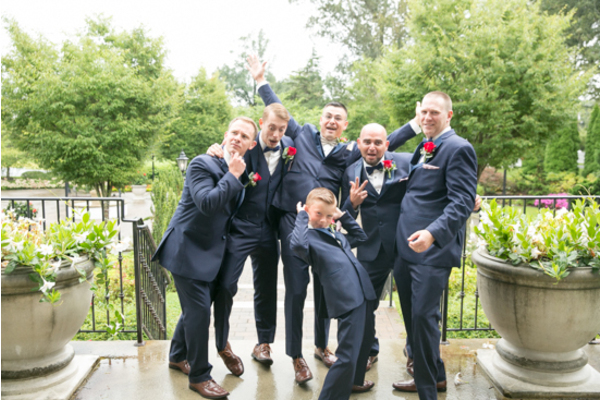 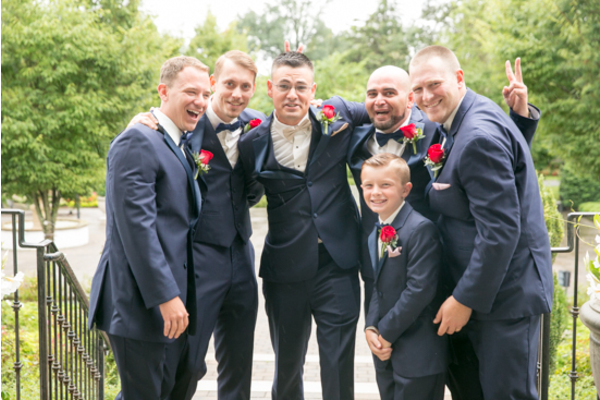 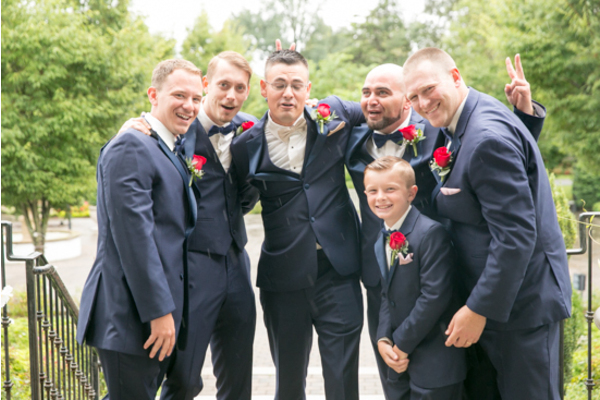 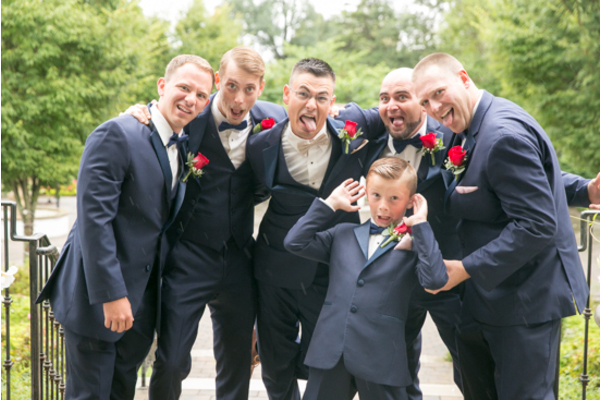 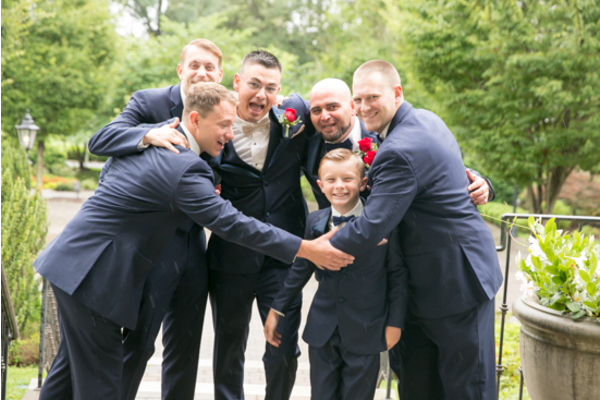 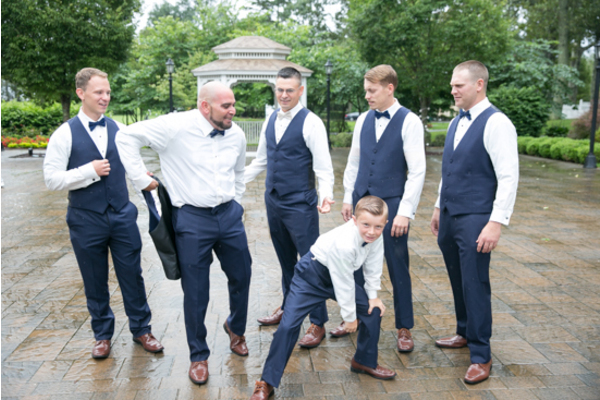 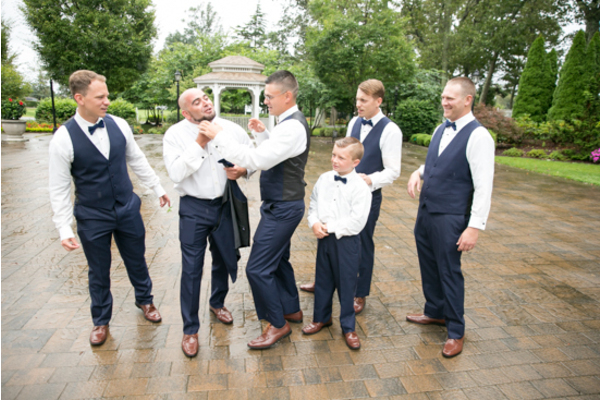 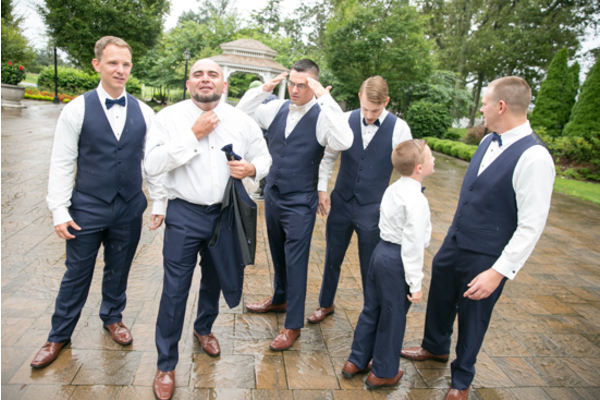 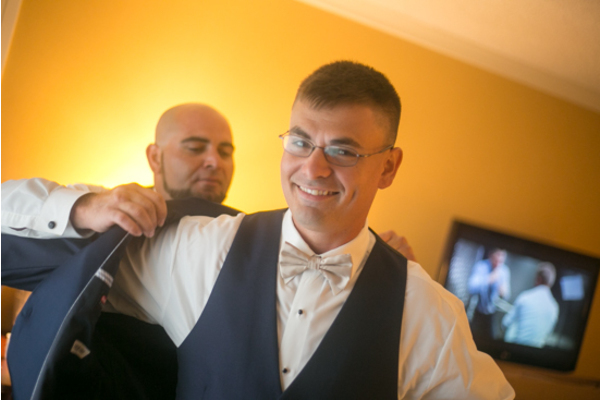 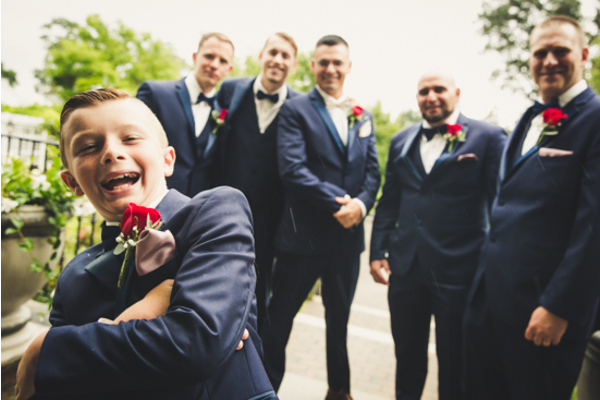 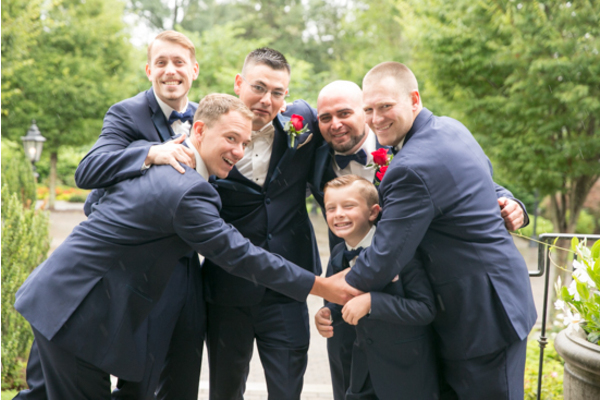 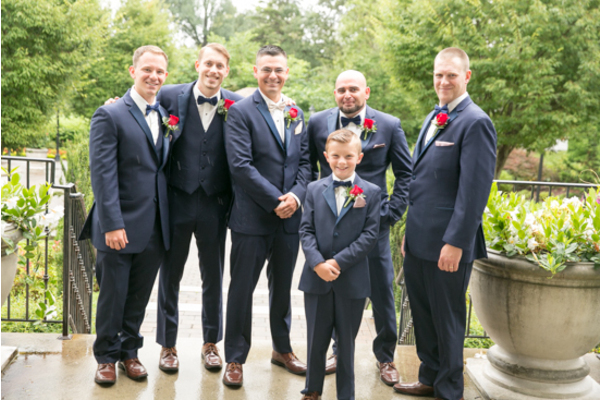 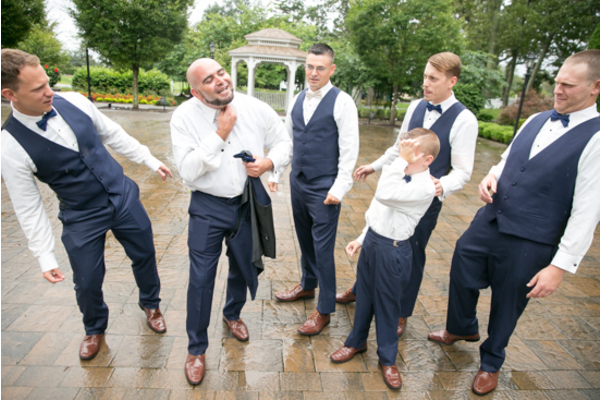 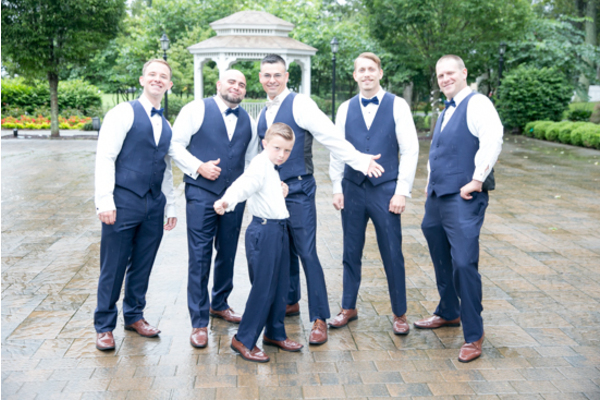 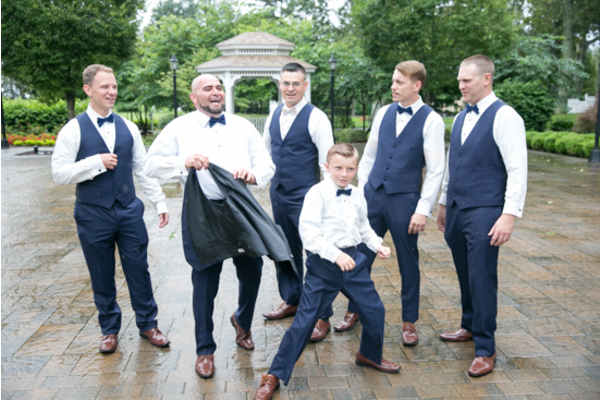 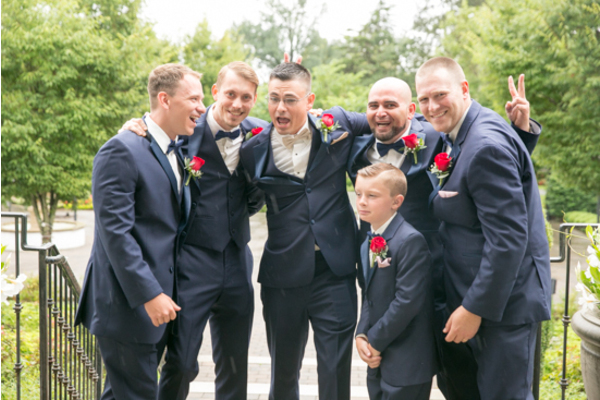 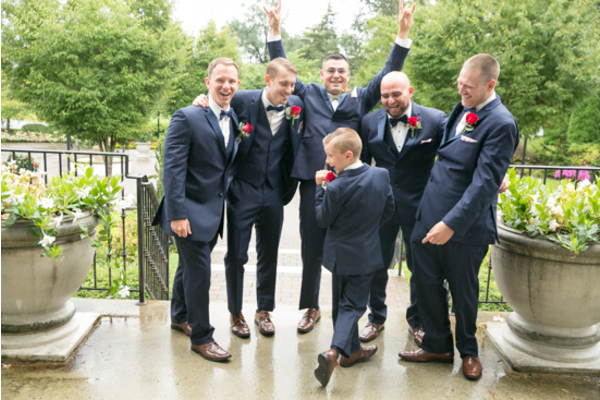 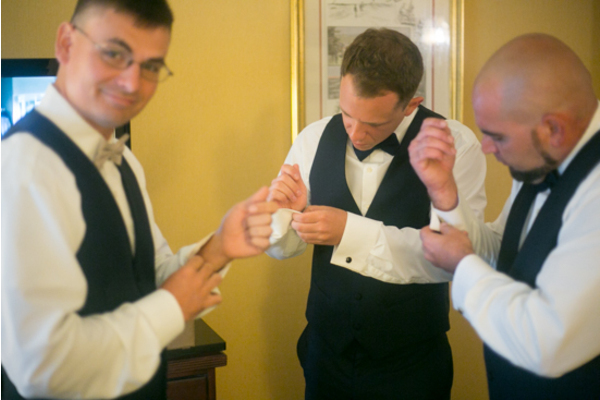 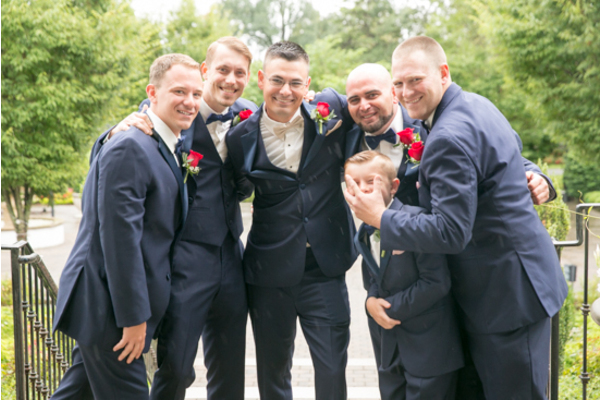 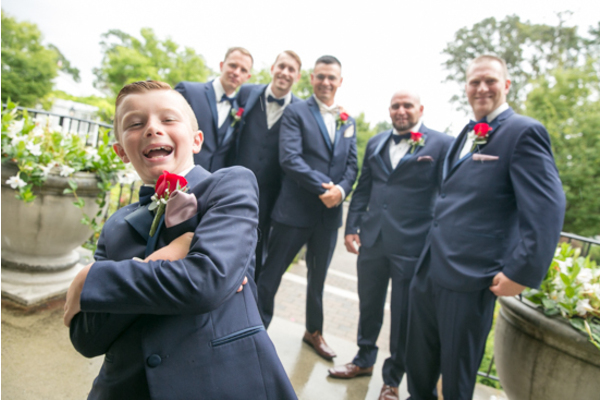 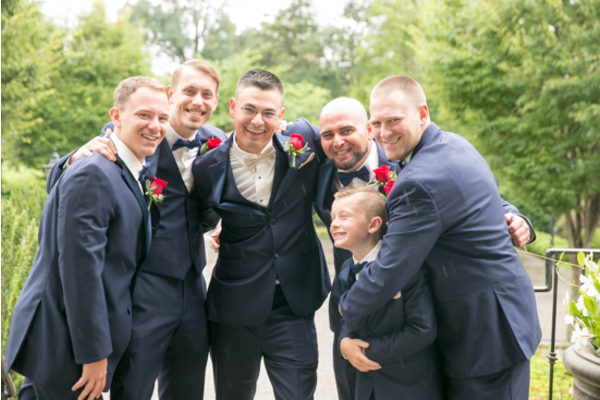 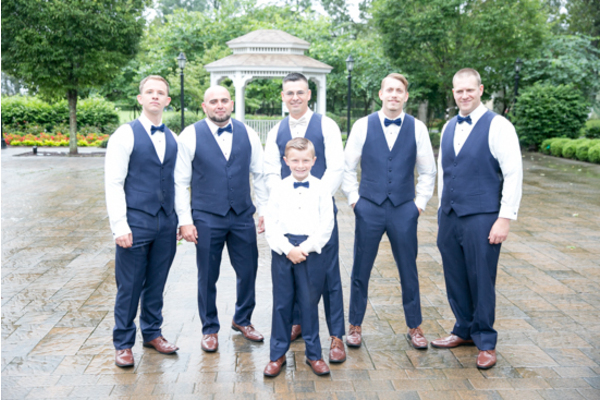 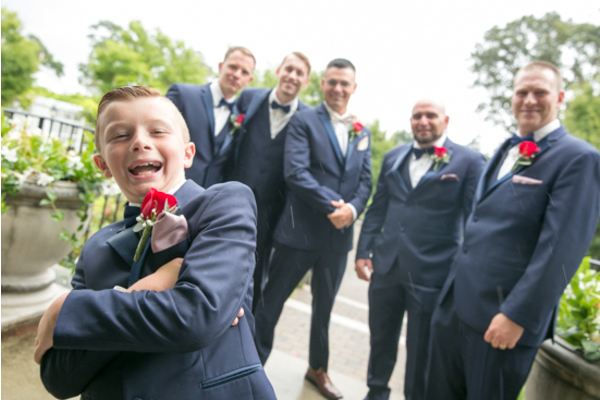 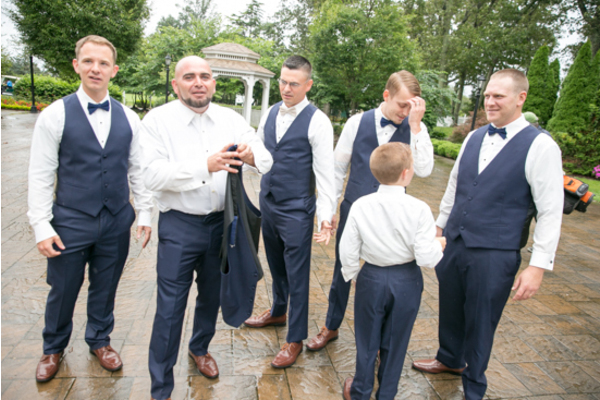 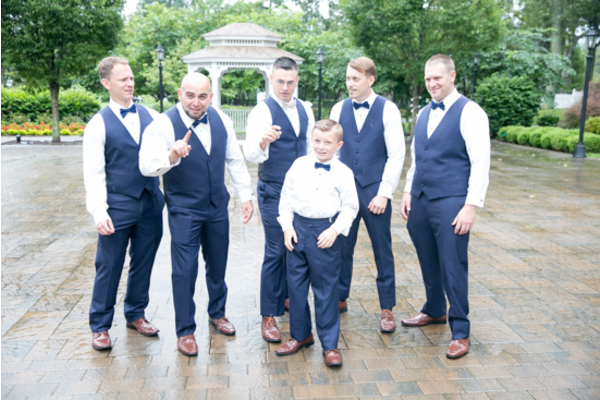 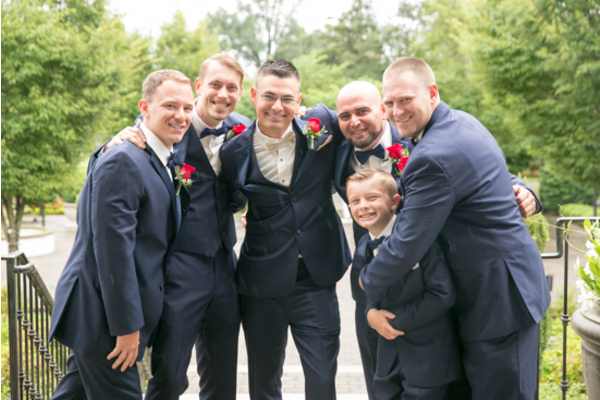 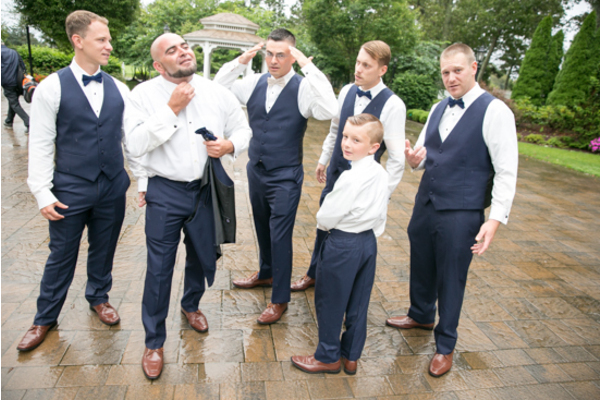 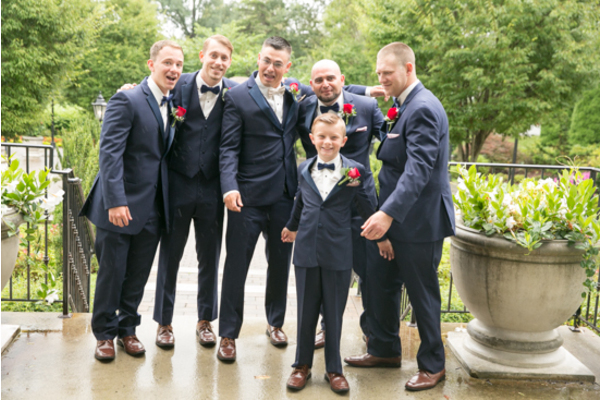 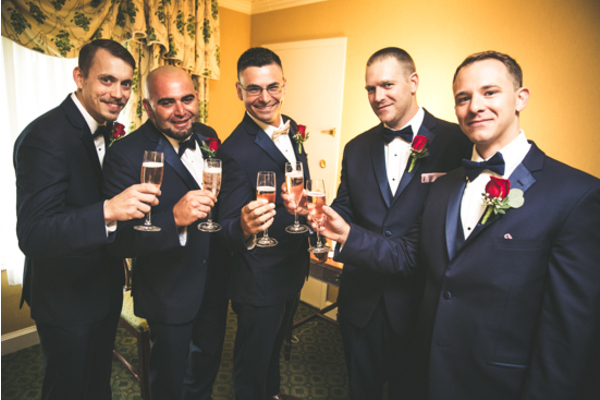 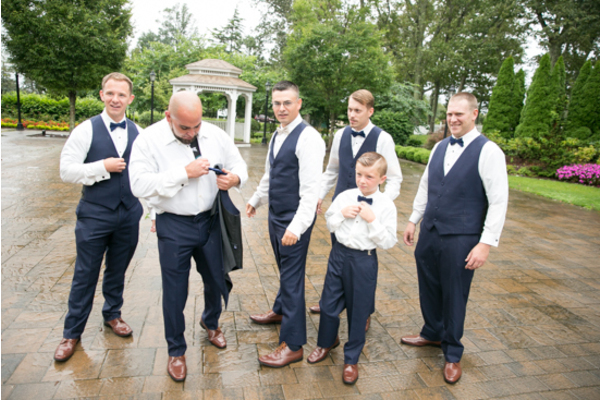 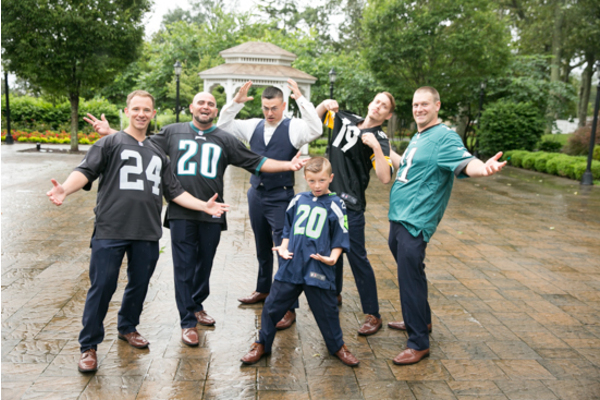 Meanwhile, Glenn and his groomsmen got together to pose for some pictures with our NJ Wedding Photographer. 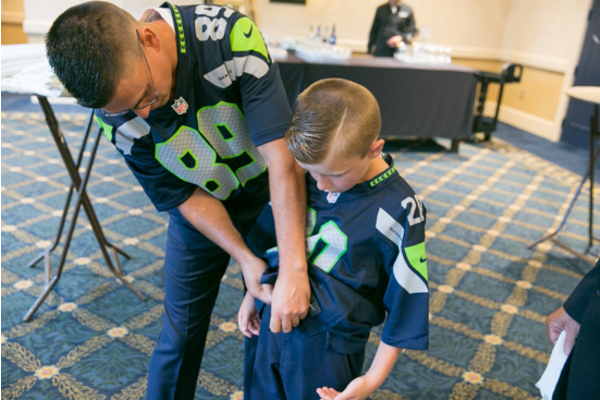 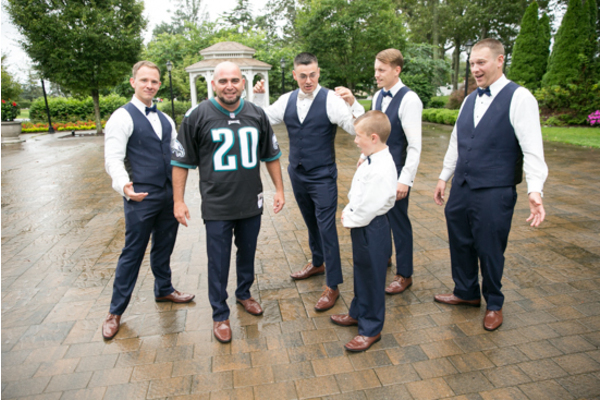 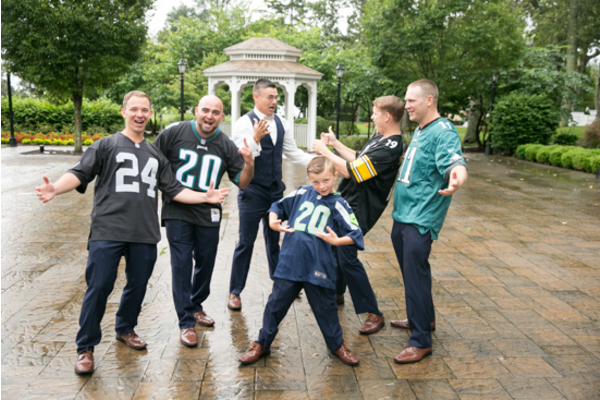 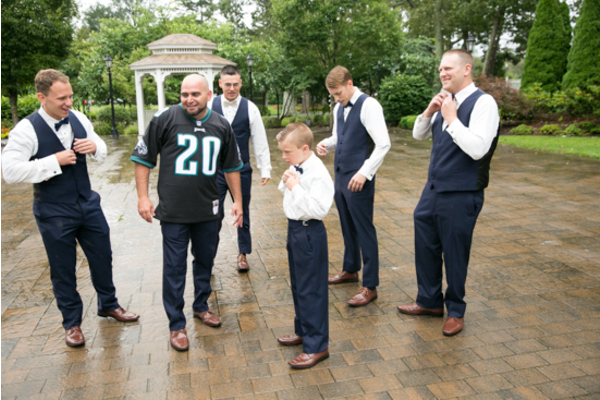 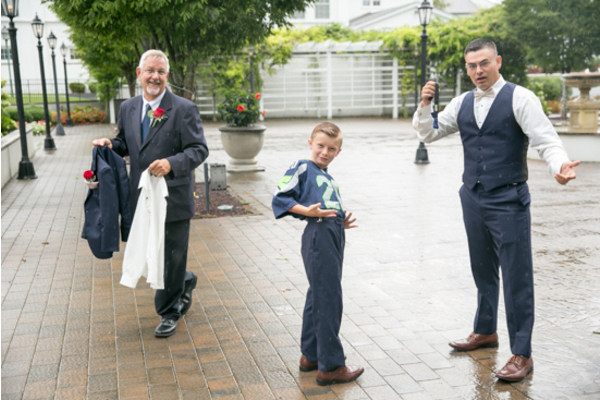 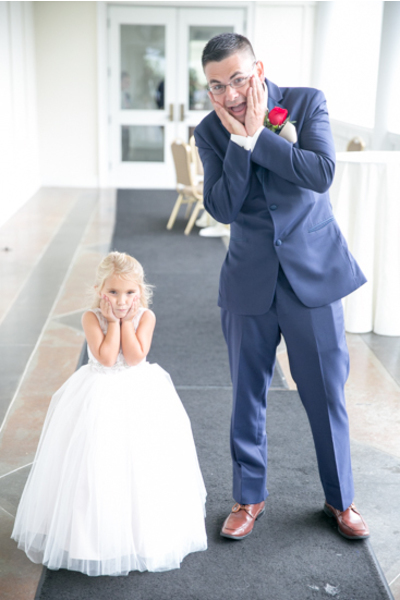 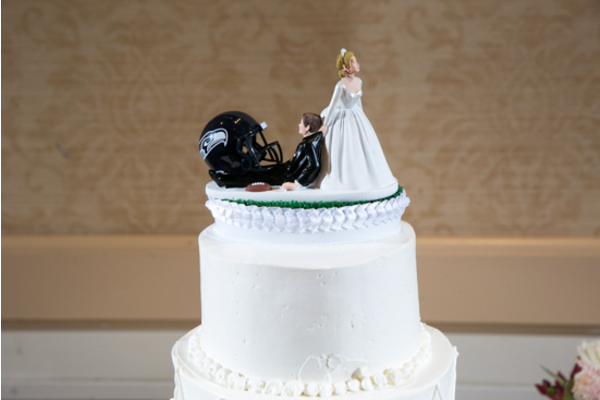 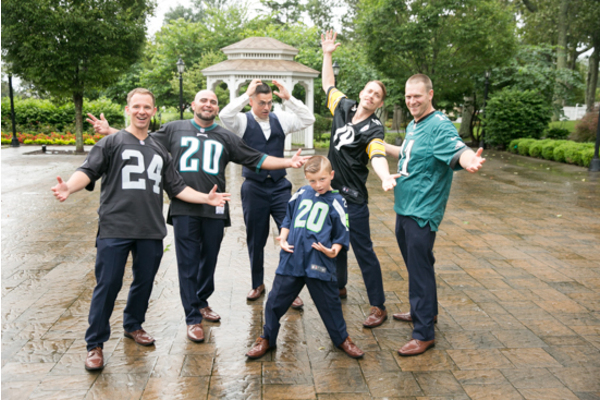 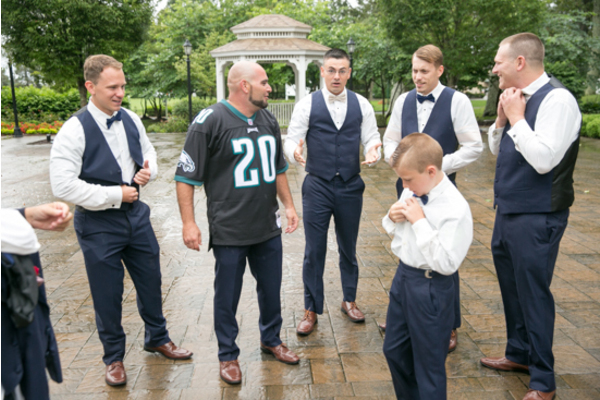 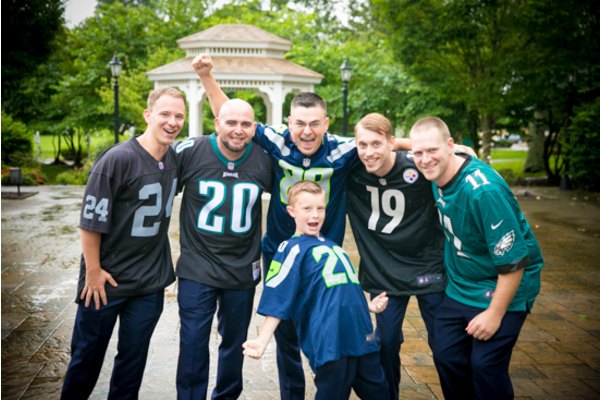 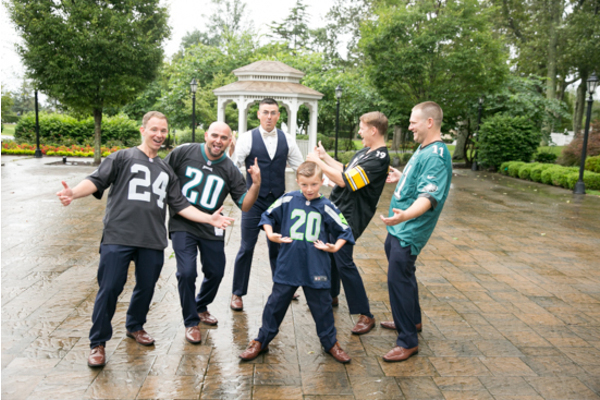 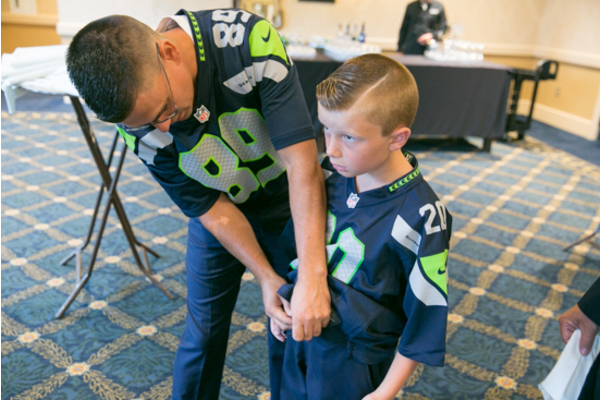 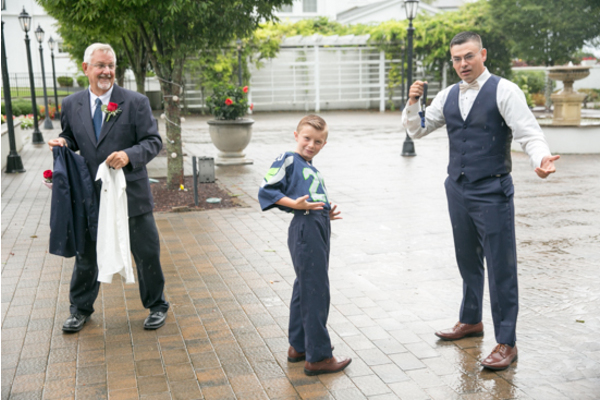 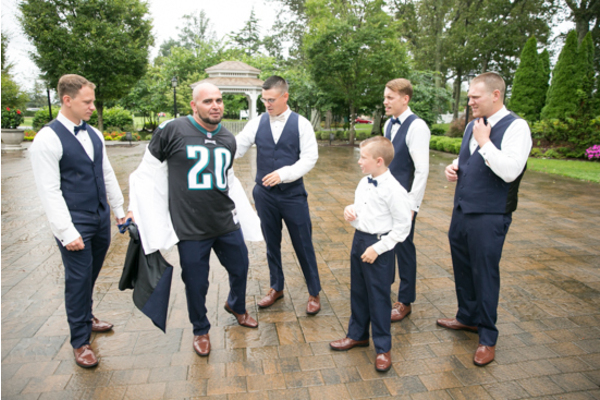 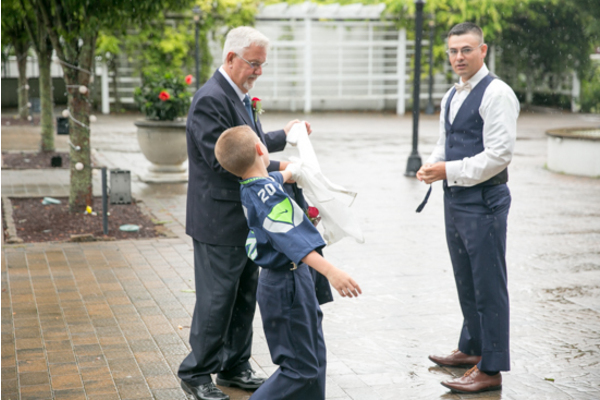 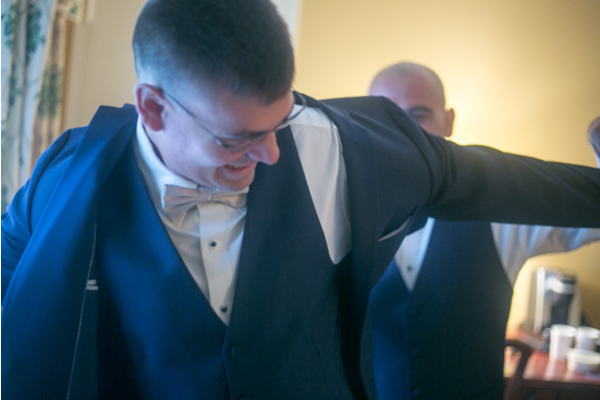 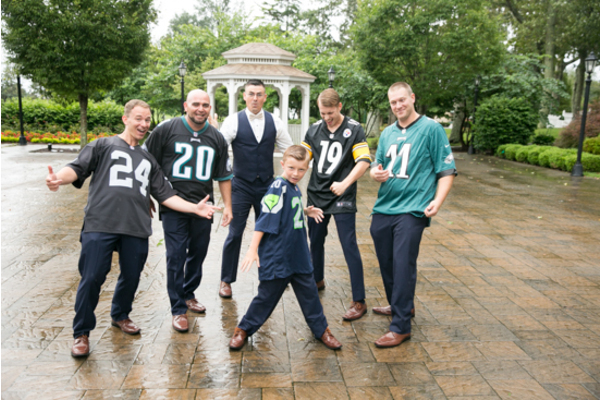 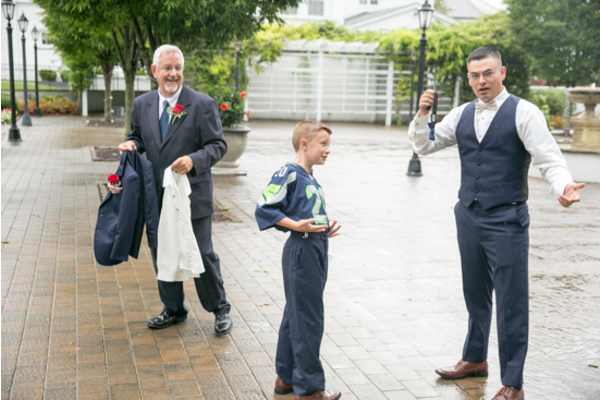 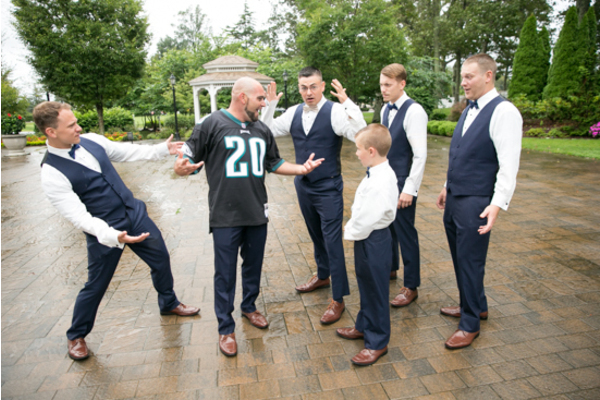 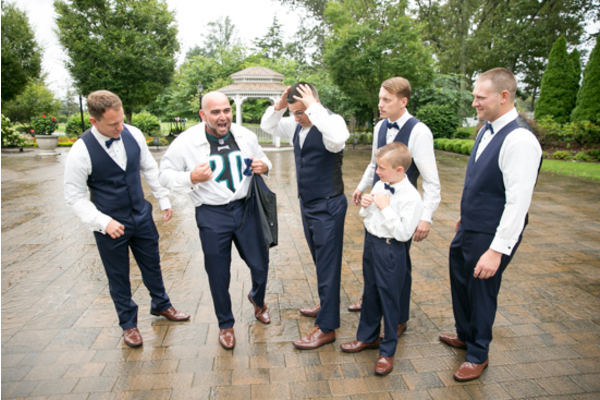 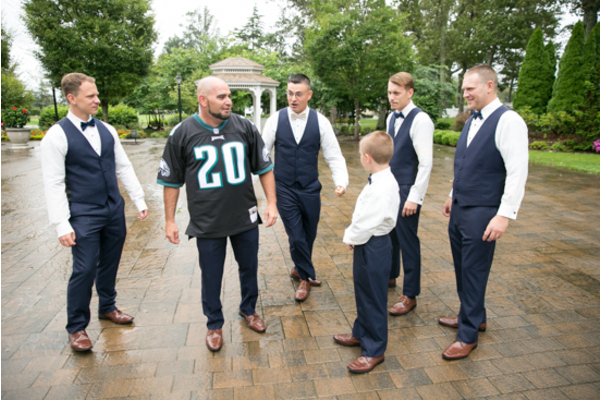 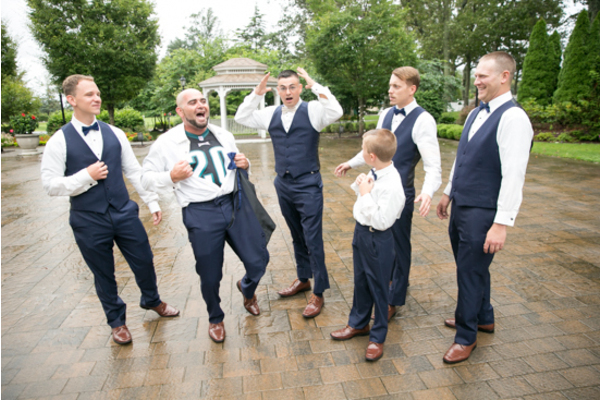 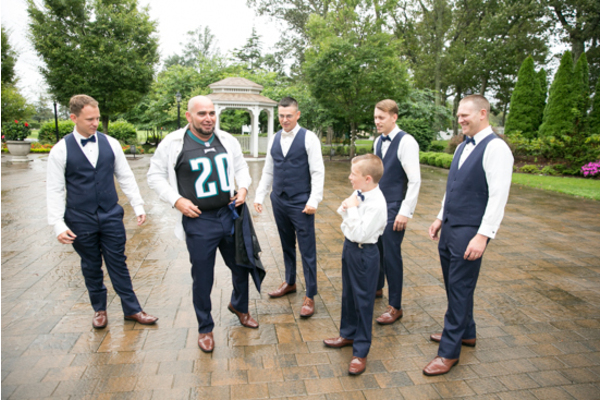 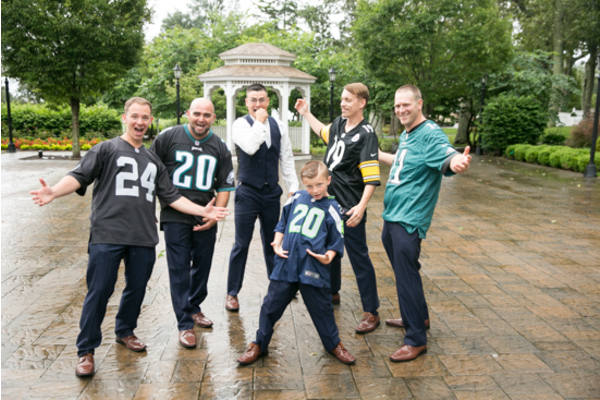 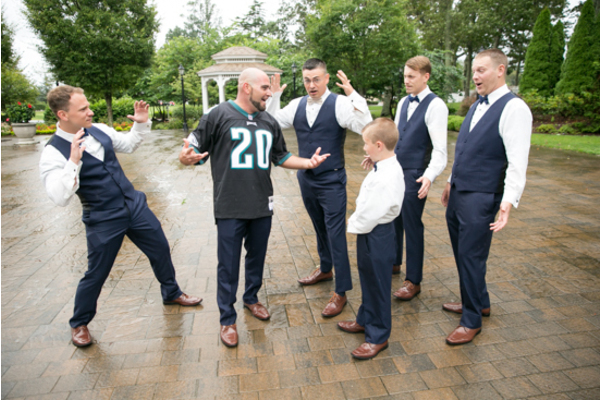 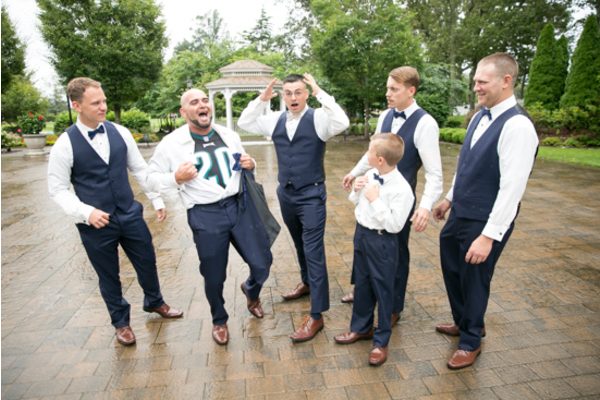 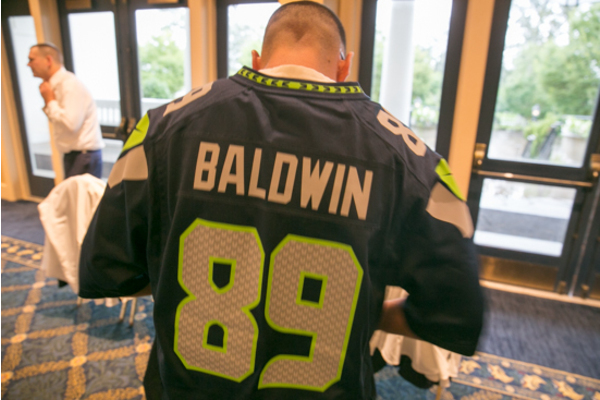 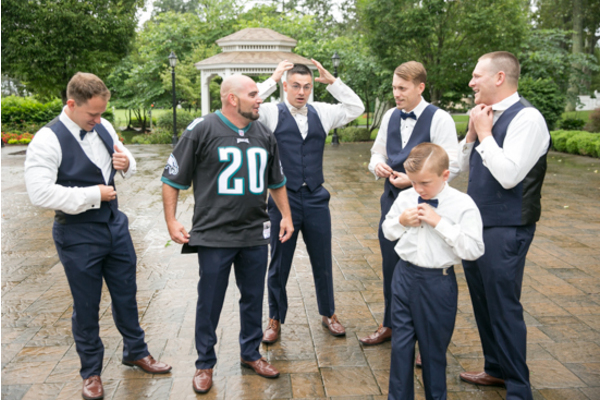 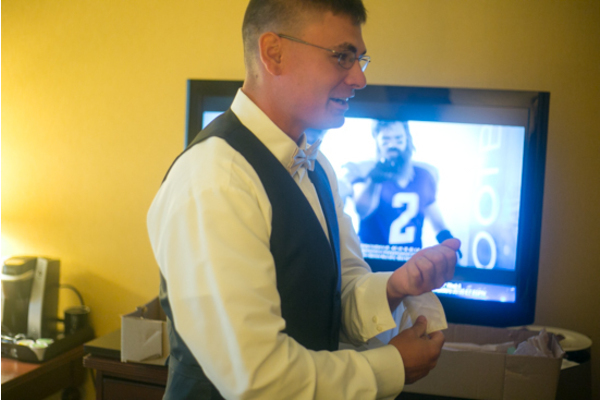 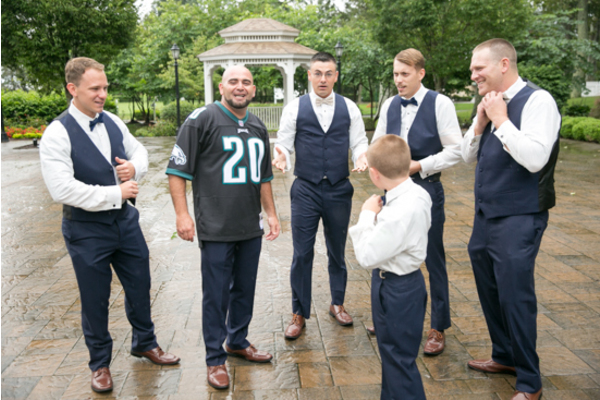 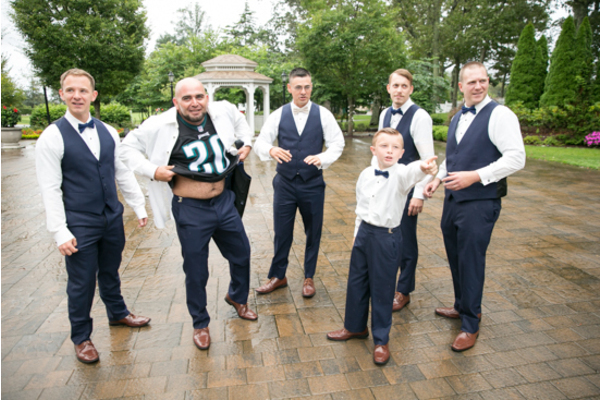 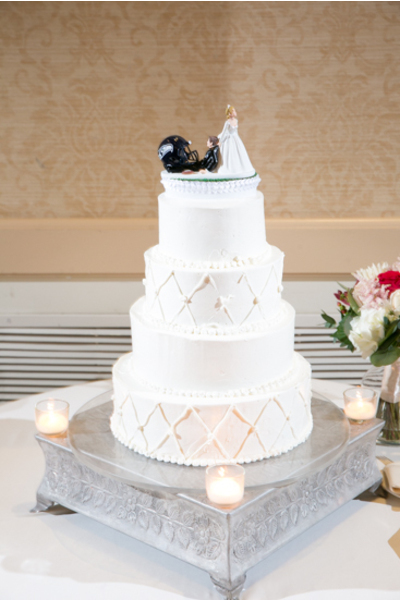 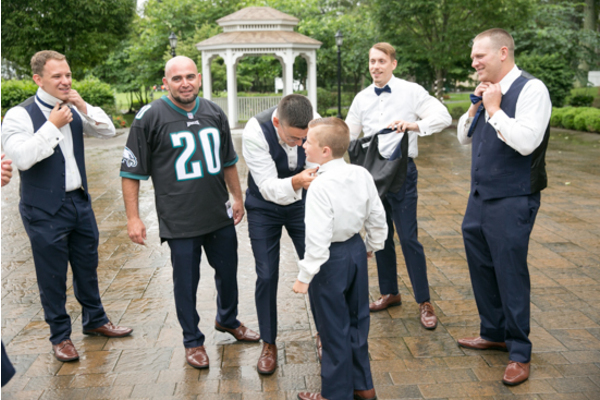 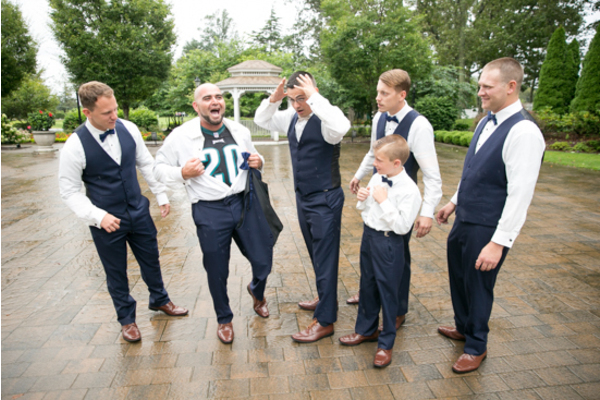 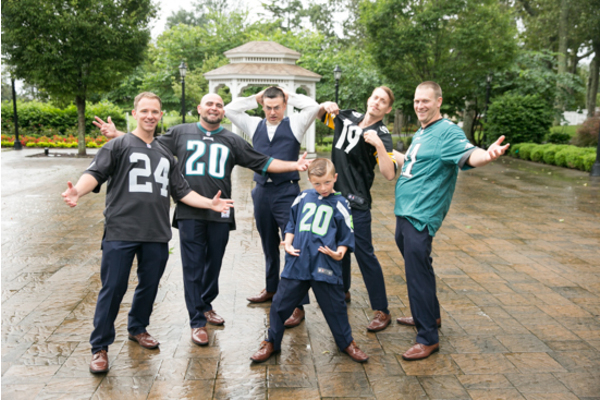 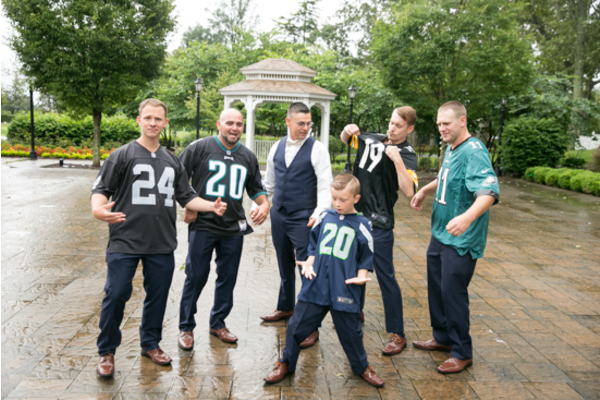 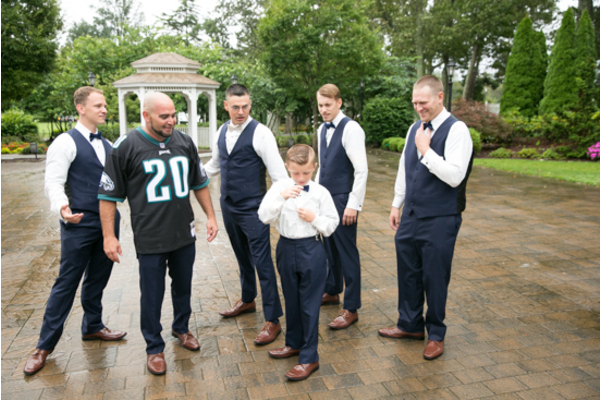 After formal wear photos, the couple changed into their favorite team’s football jerseys! 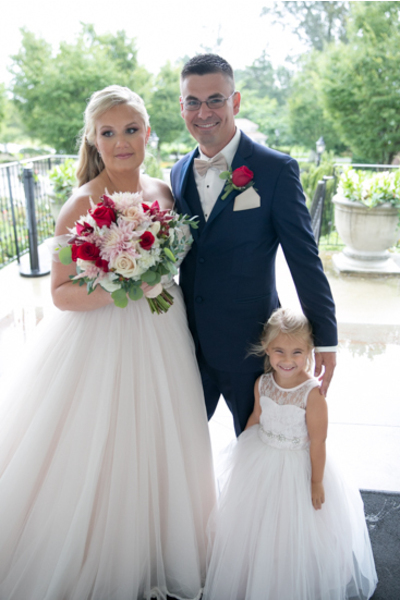 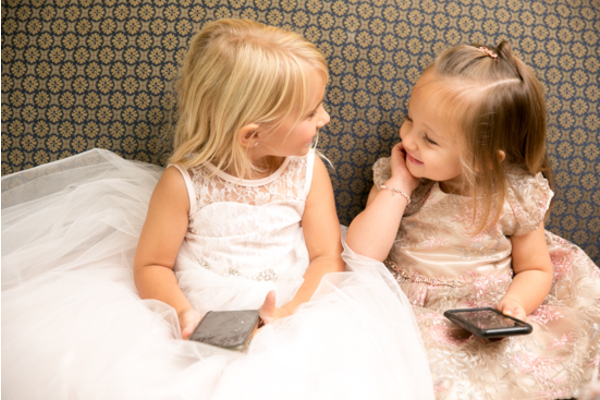 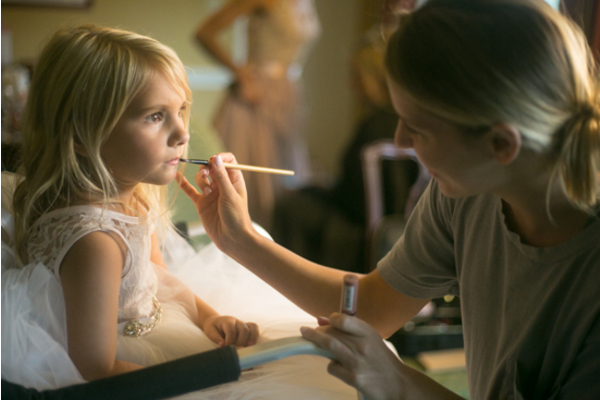 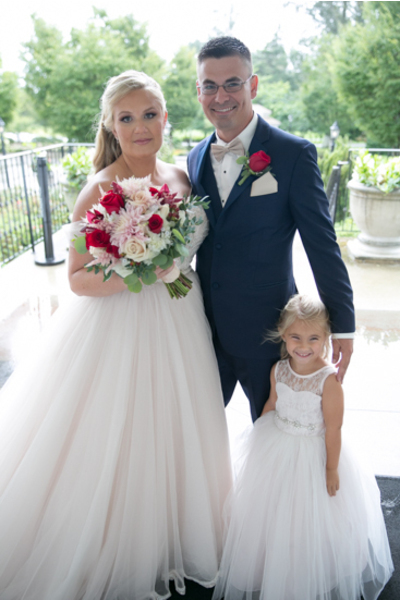 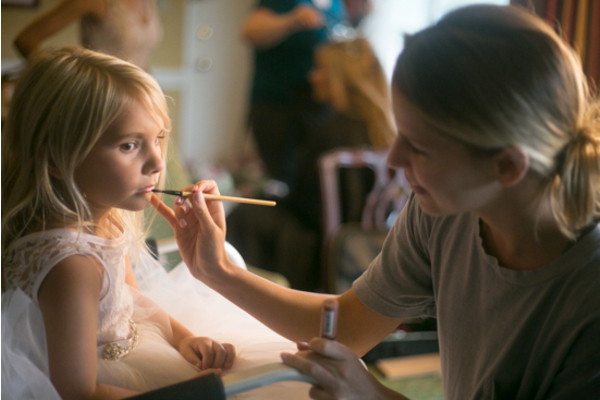 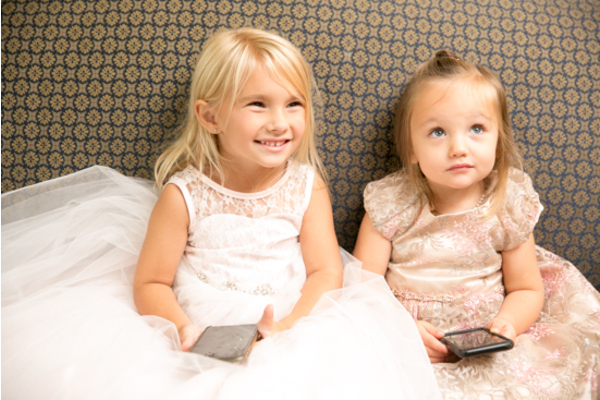 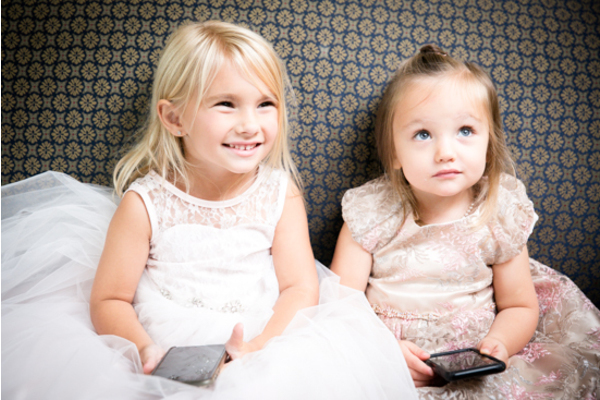 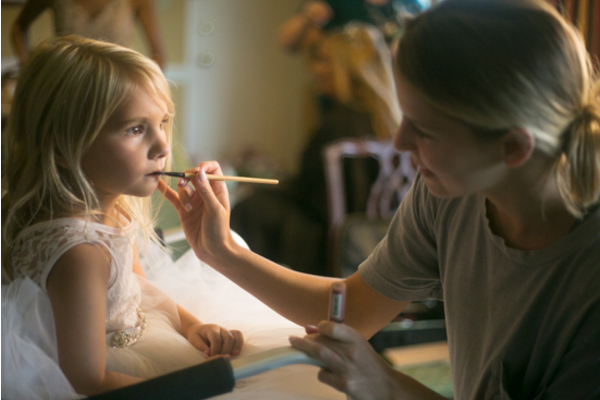 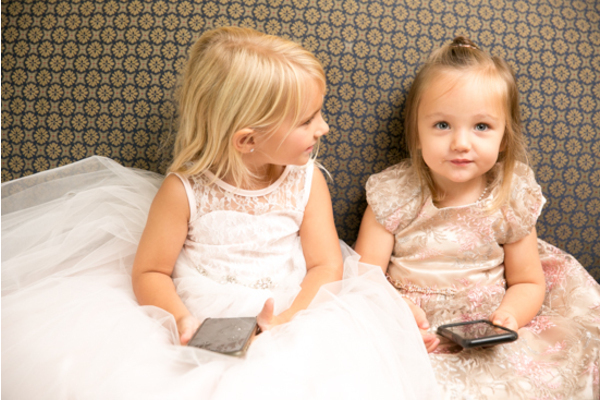 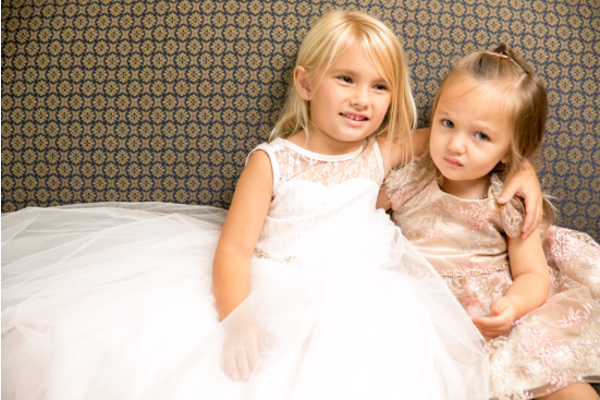 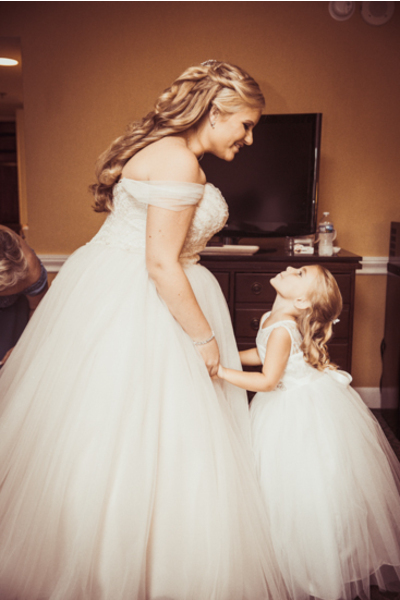 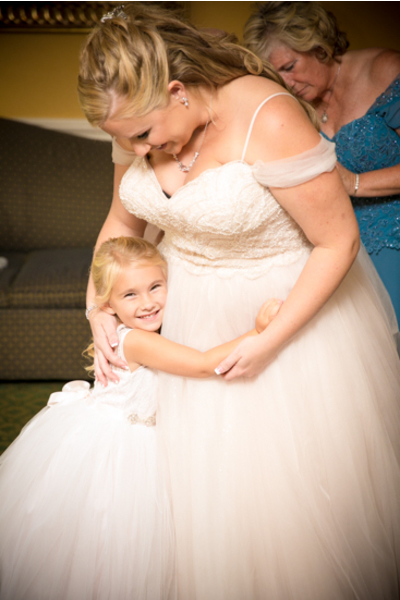 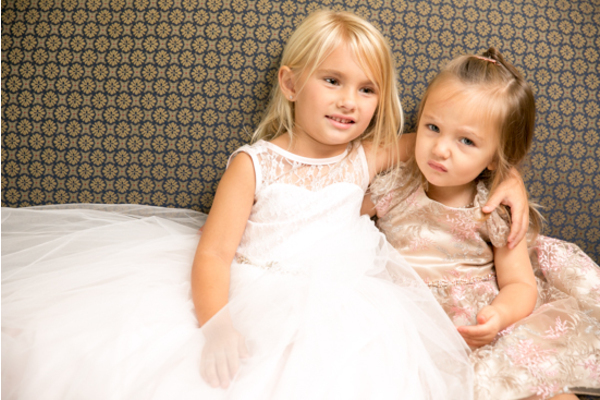 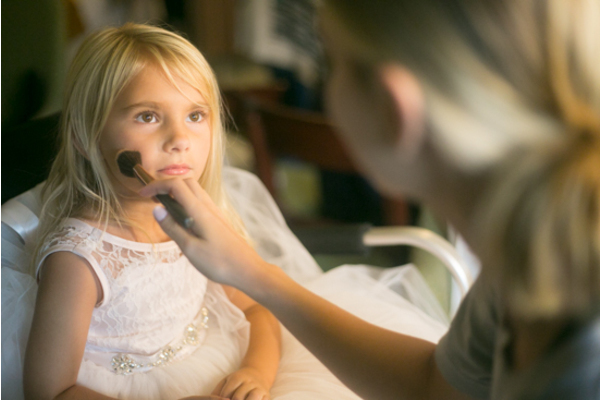 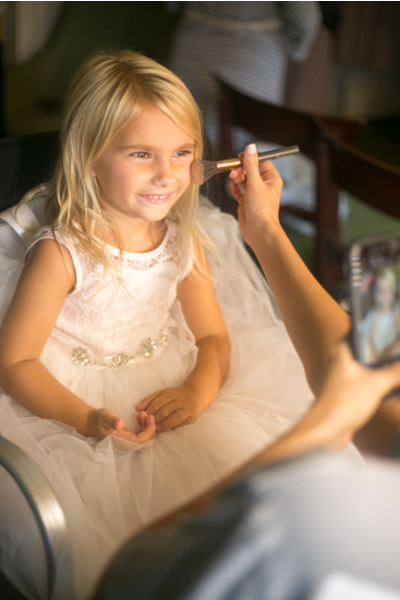 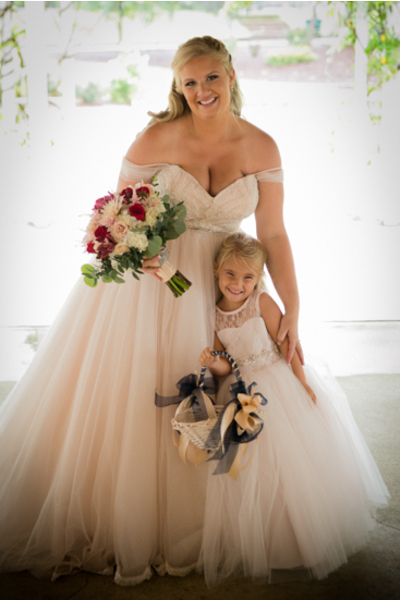 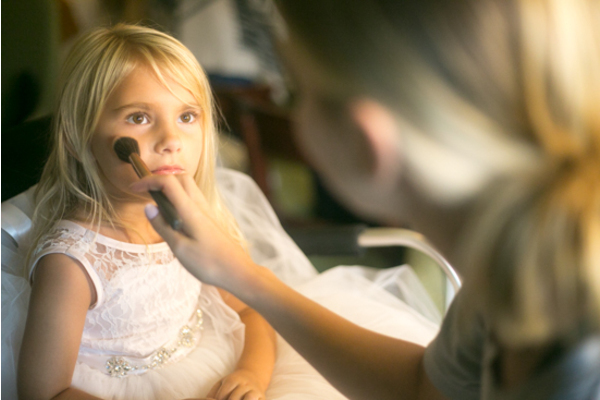 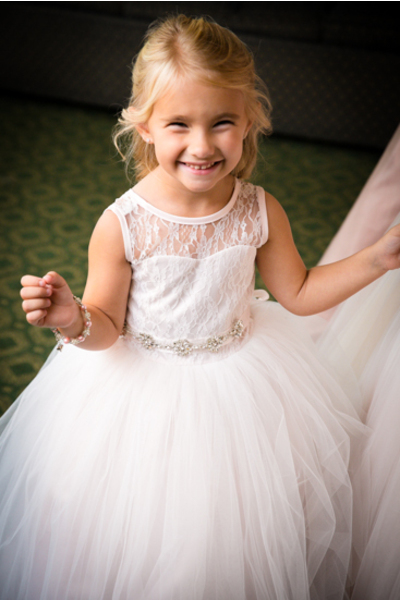 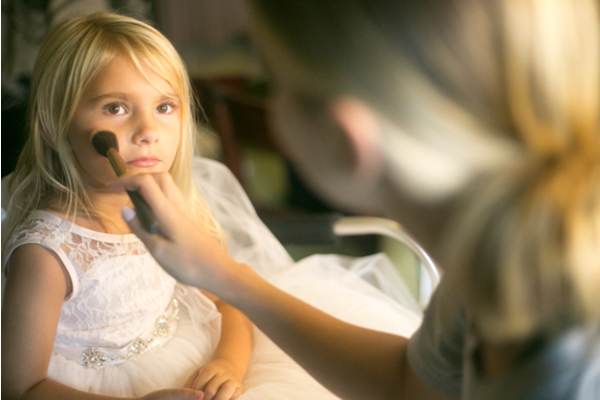 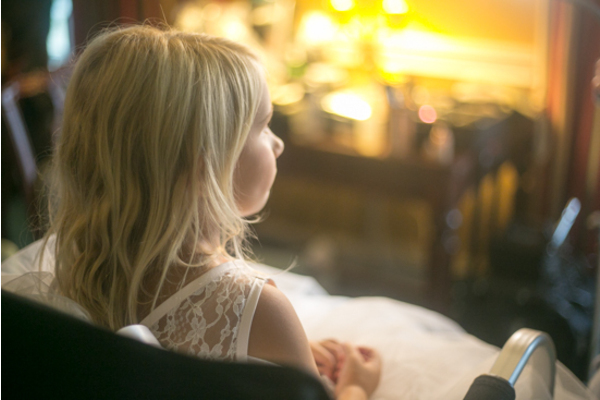 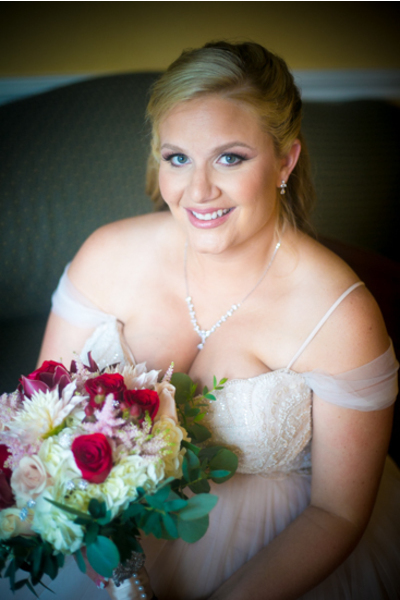 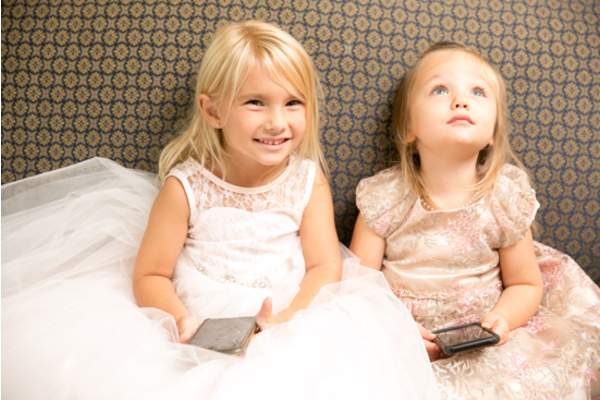 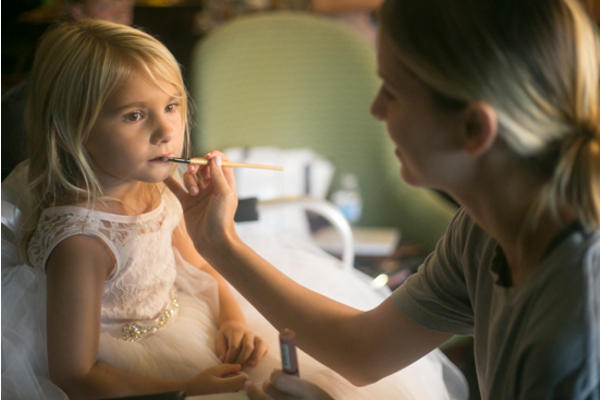 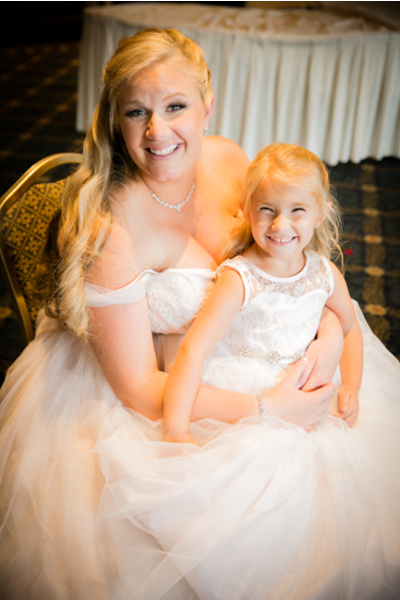 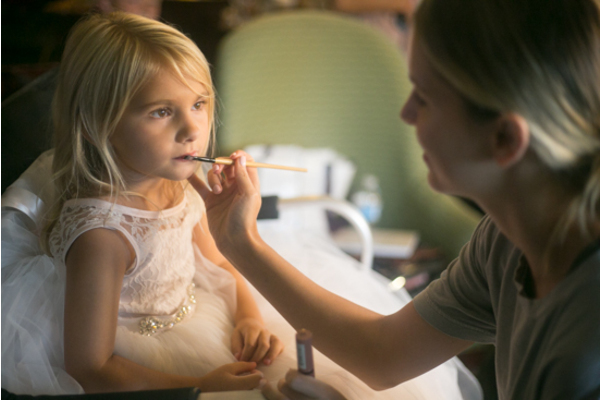 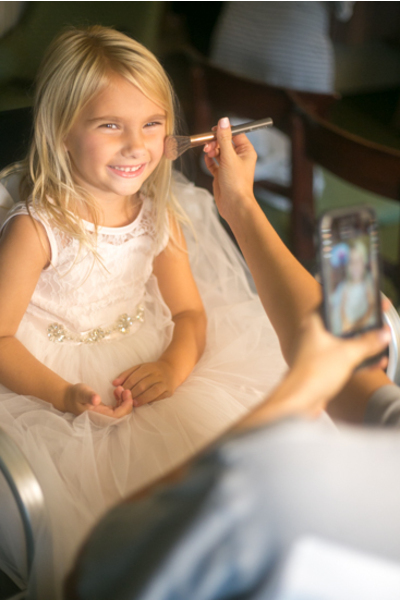 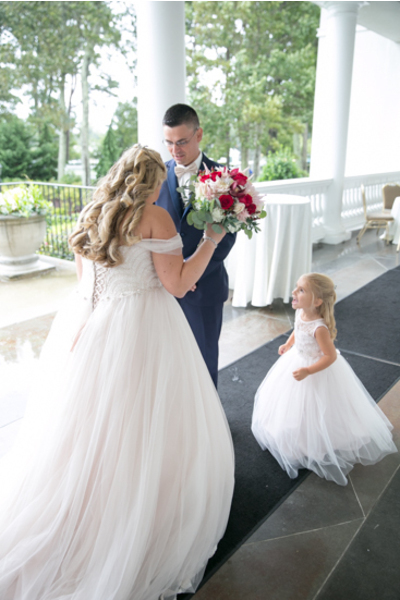 Nicole slipped into her beautiful dress with the help of her bridesmaids. 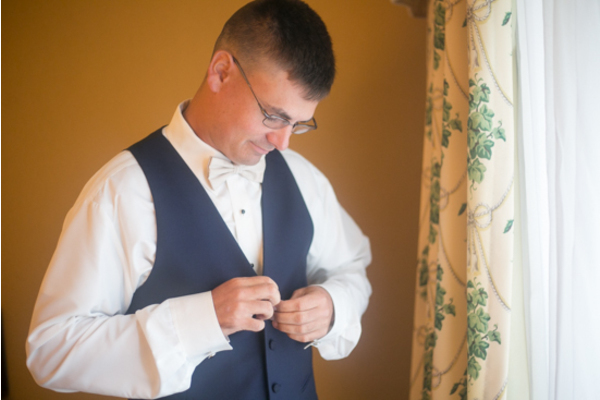 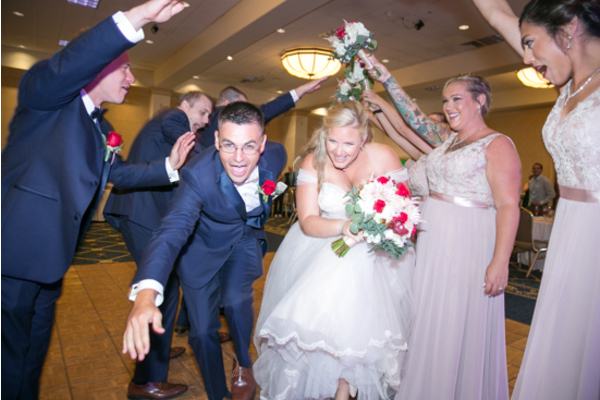 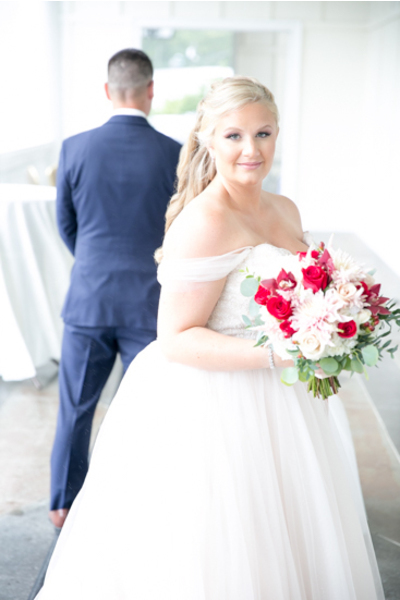 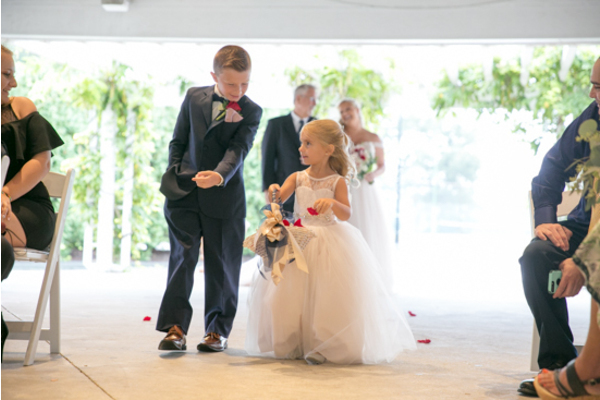 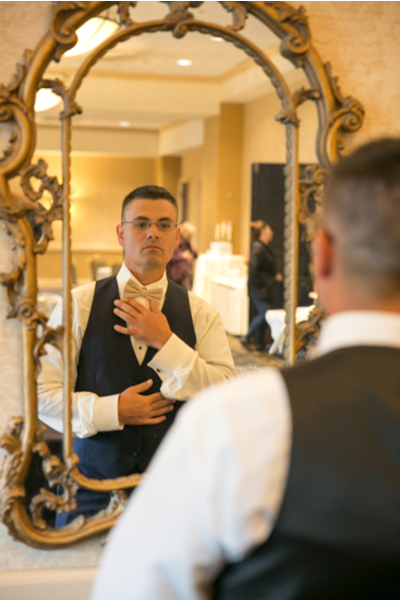 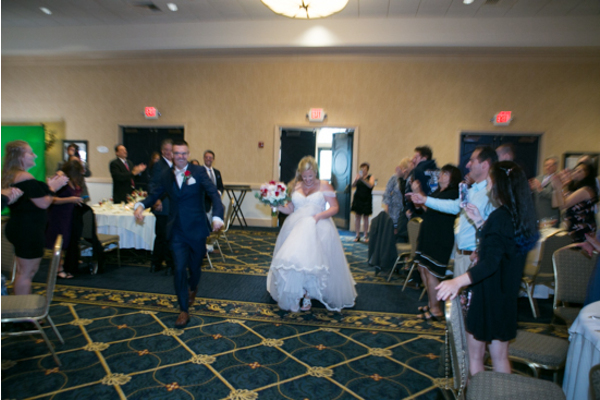 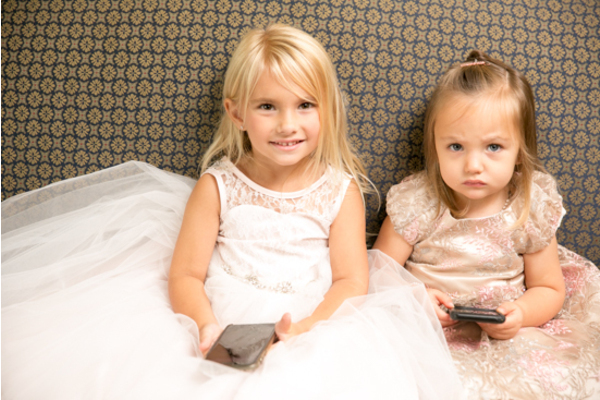 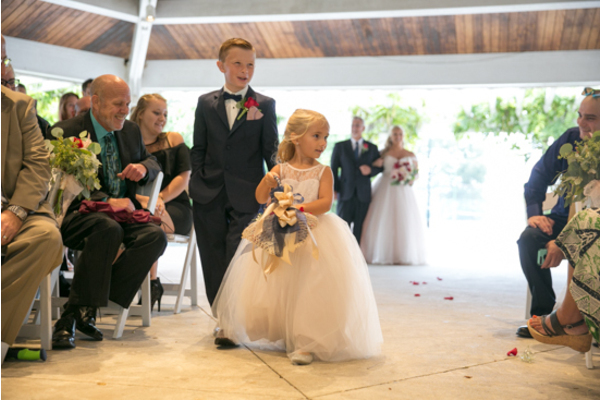 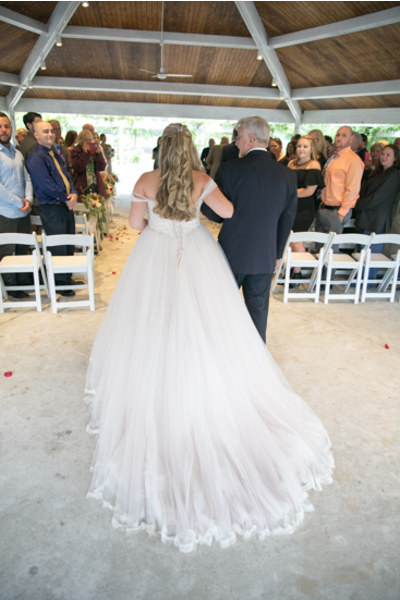 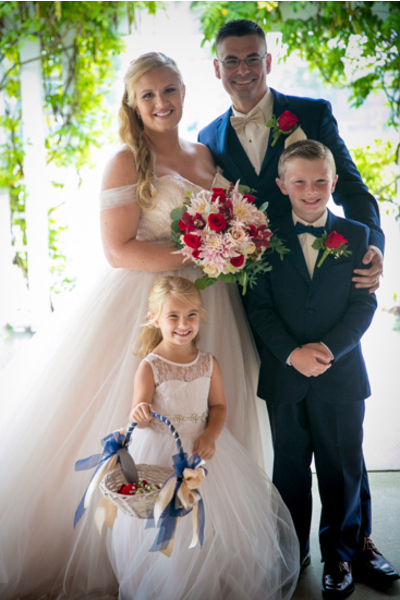 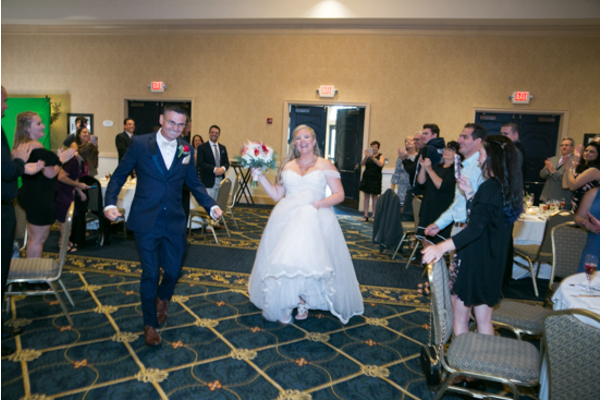 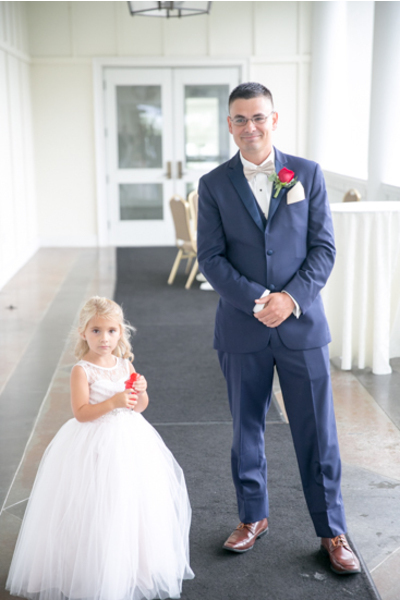 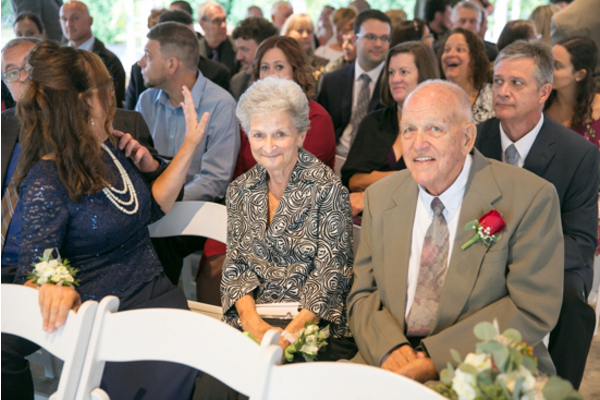 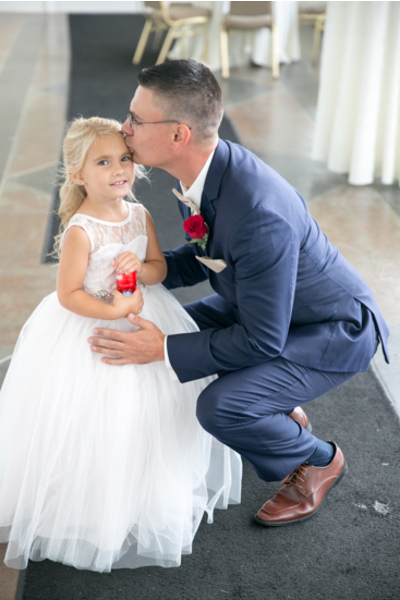 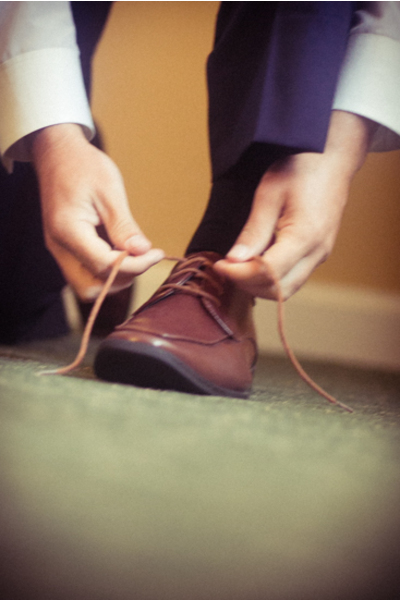 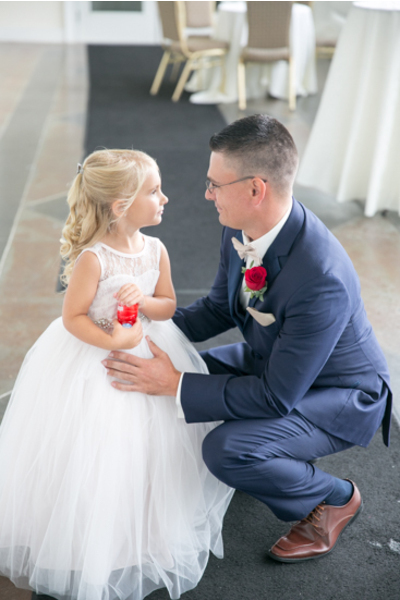 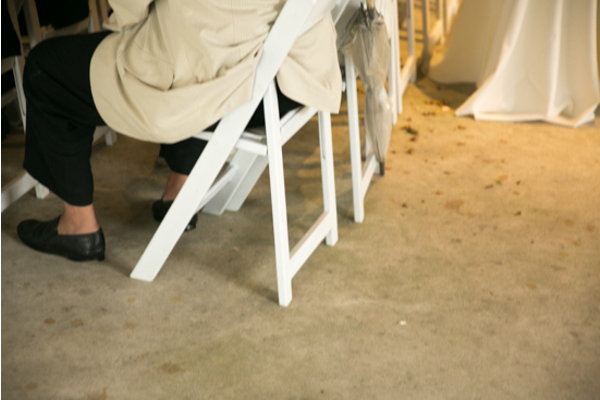 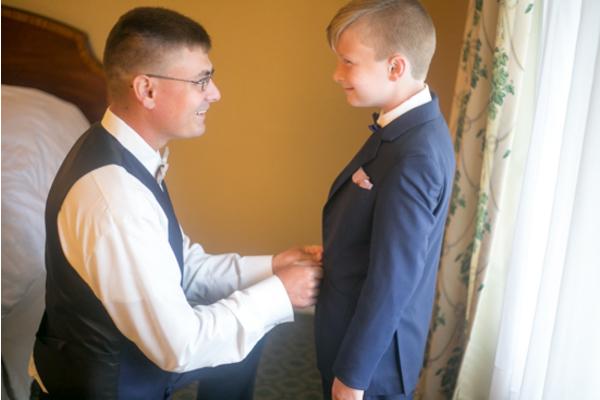 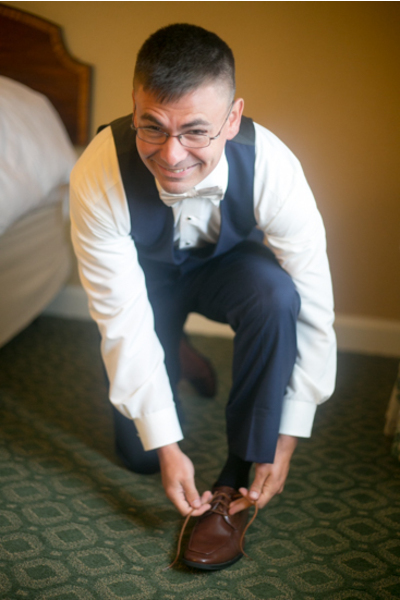 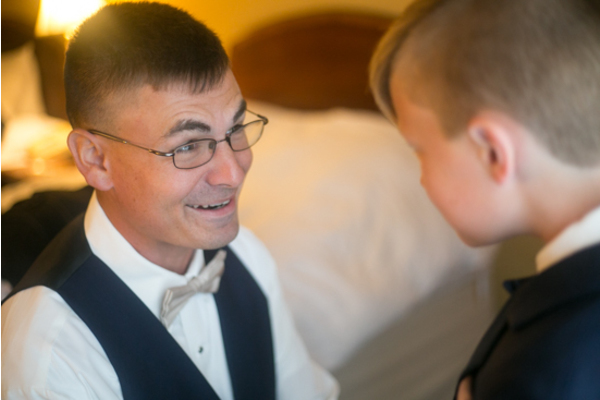 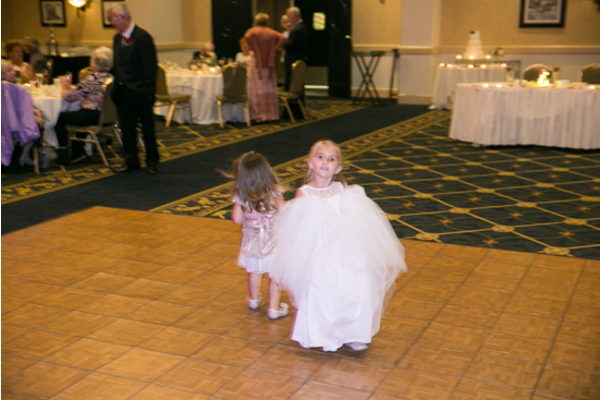 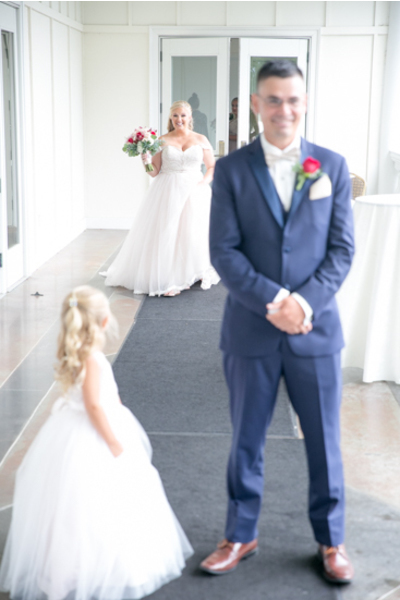 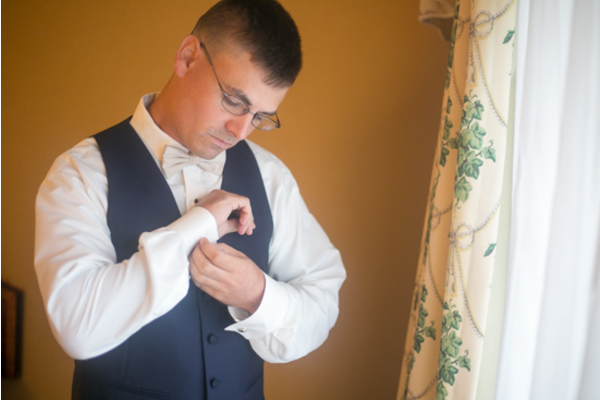 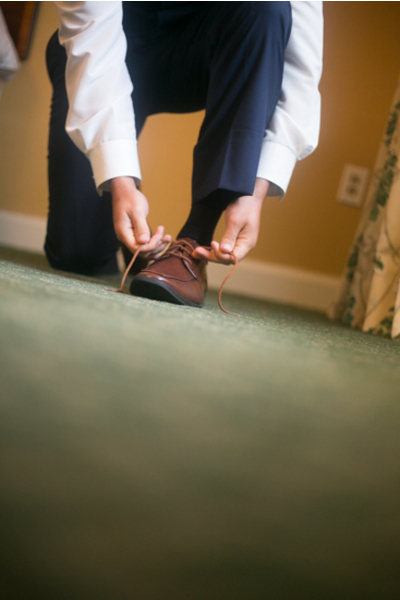 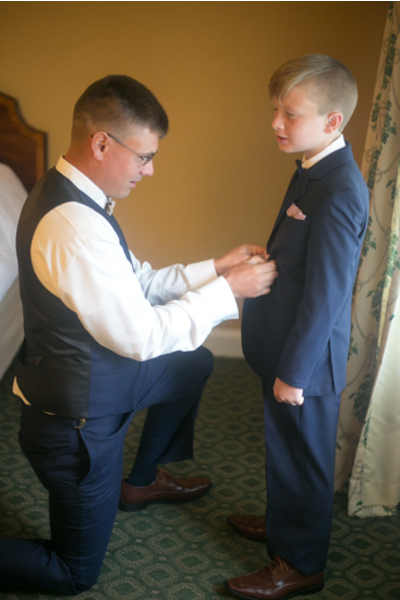 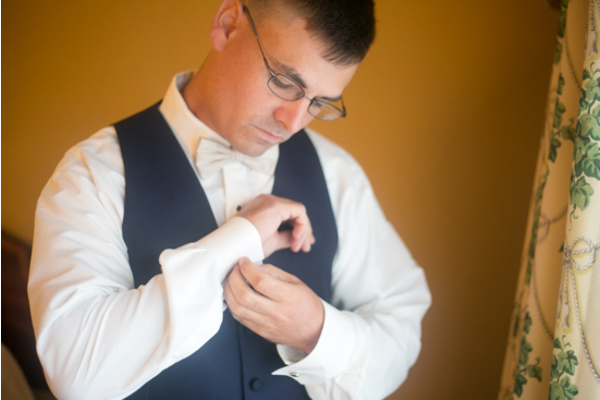 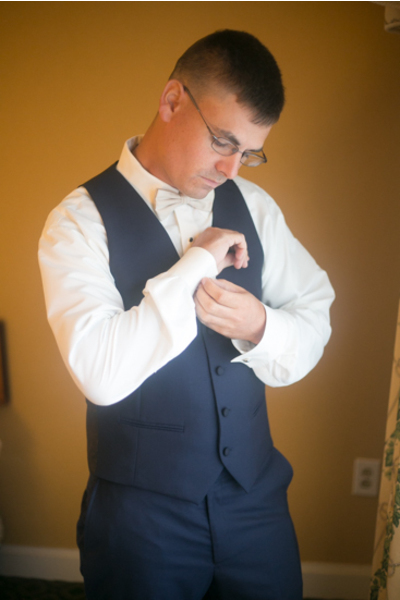 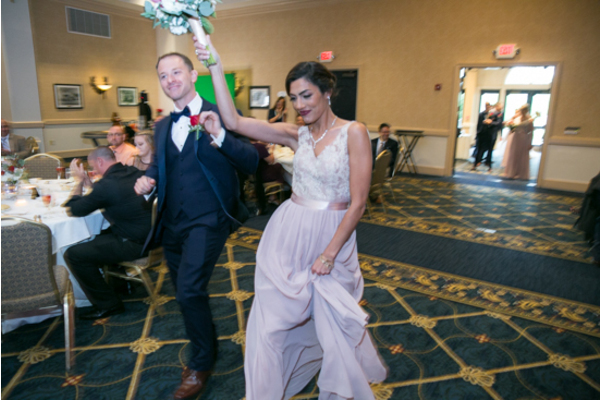 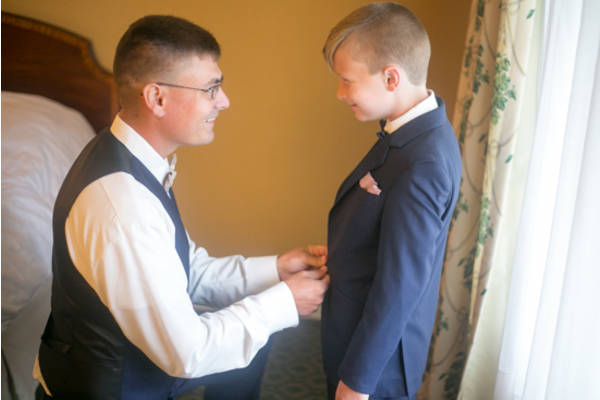 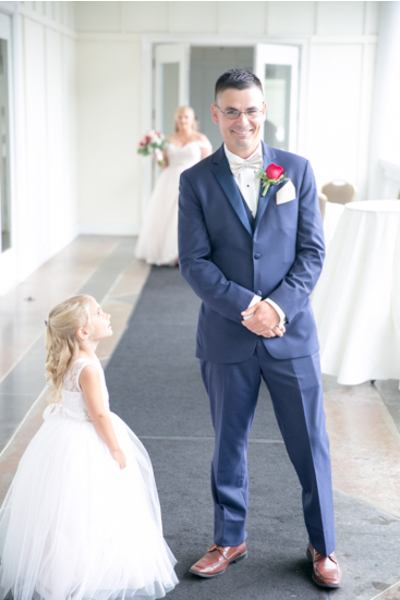 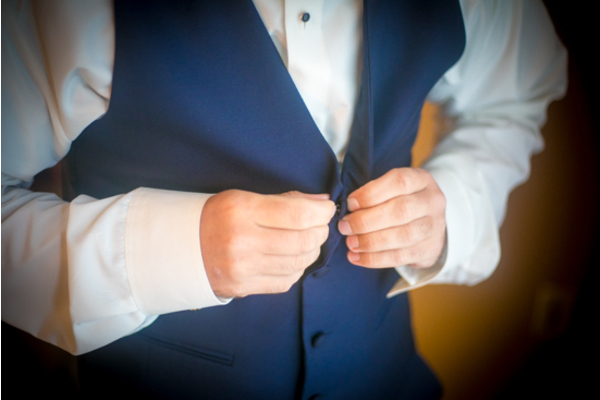 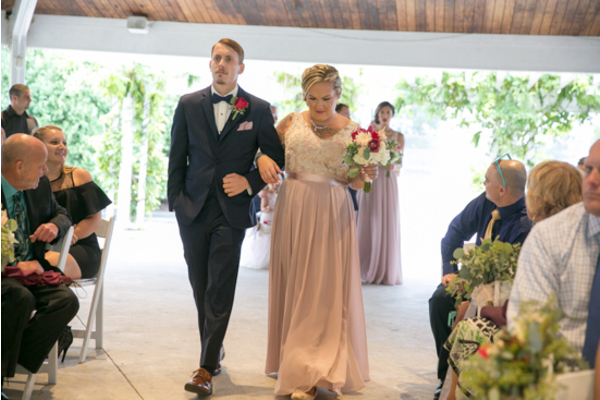 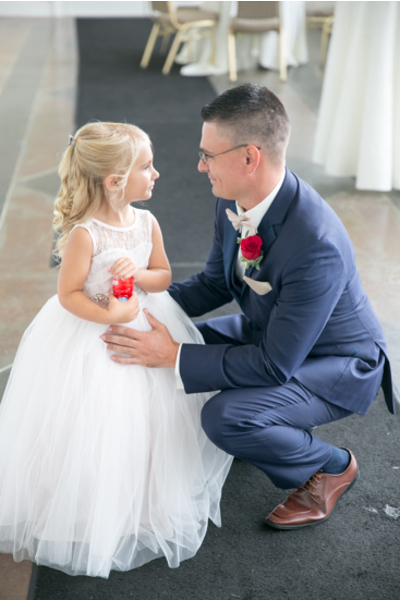 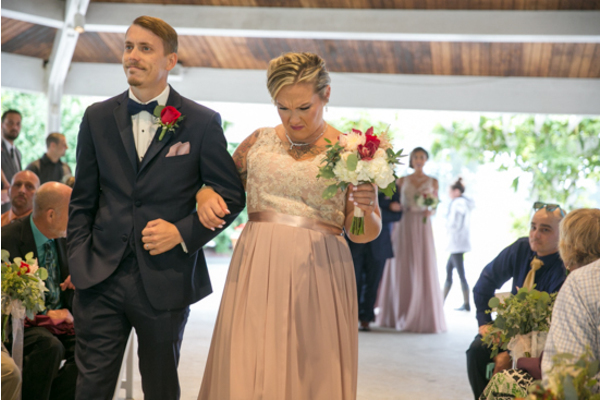 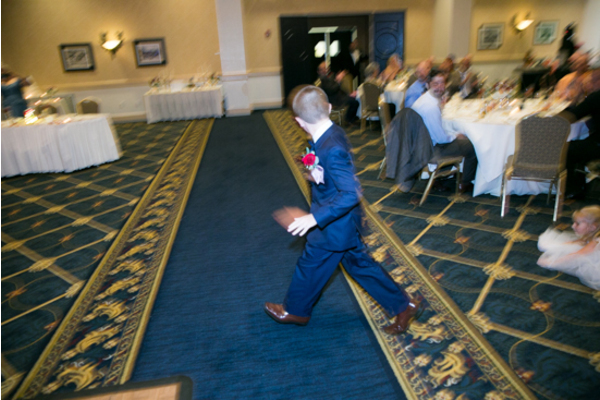 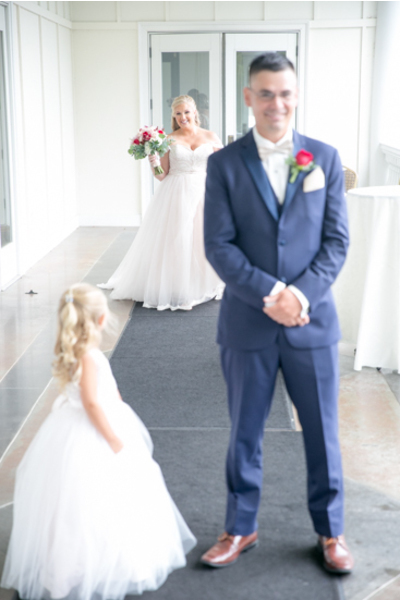 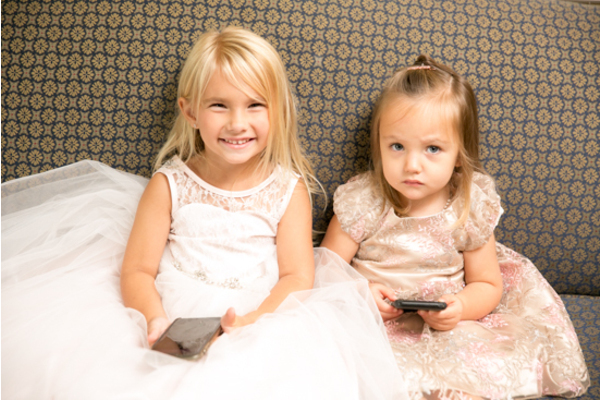 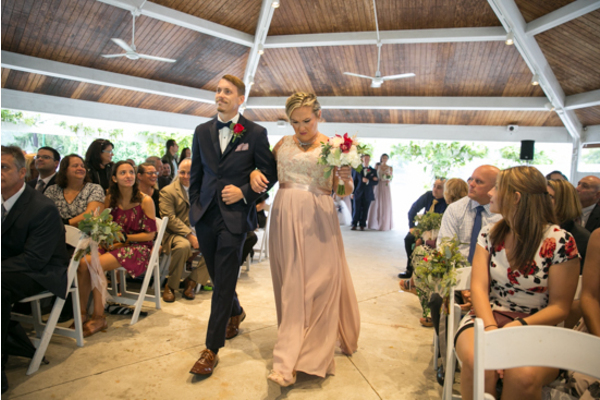 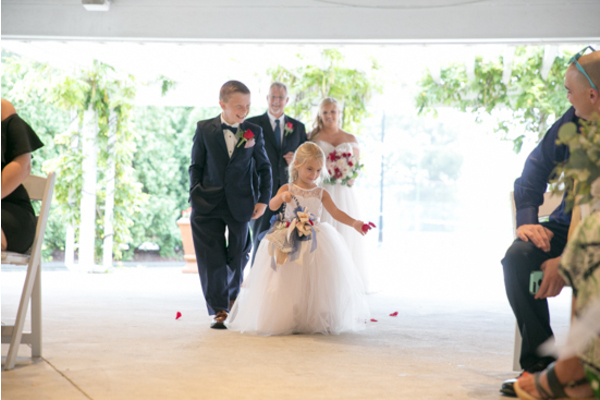 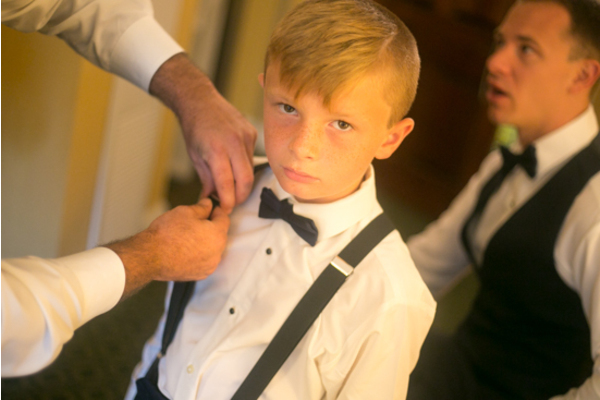 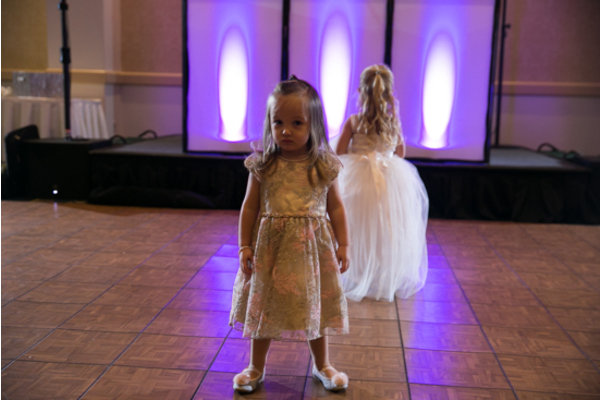 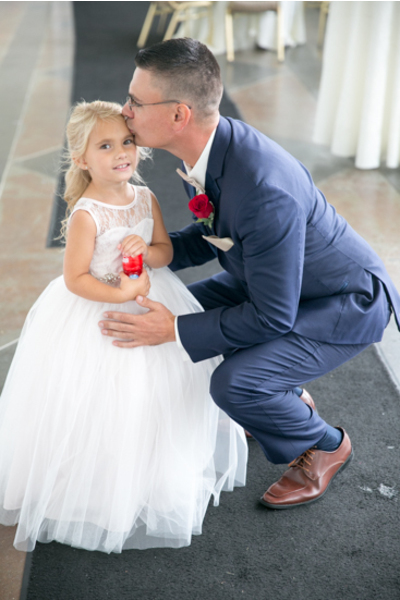 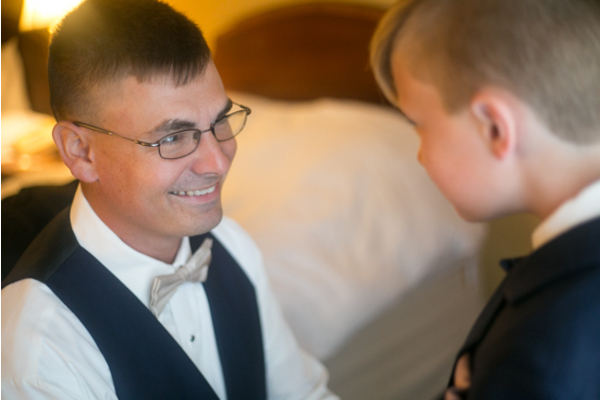 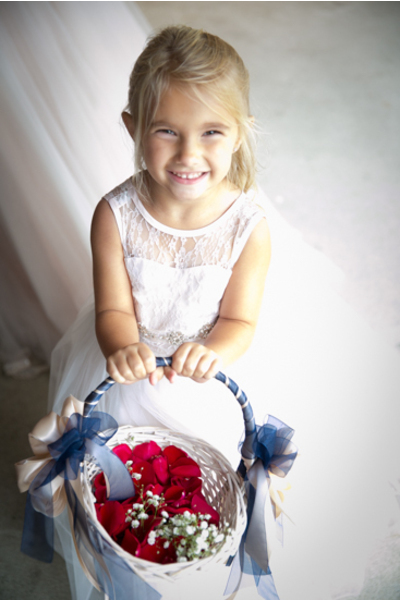 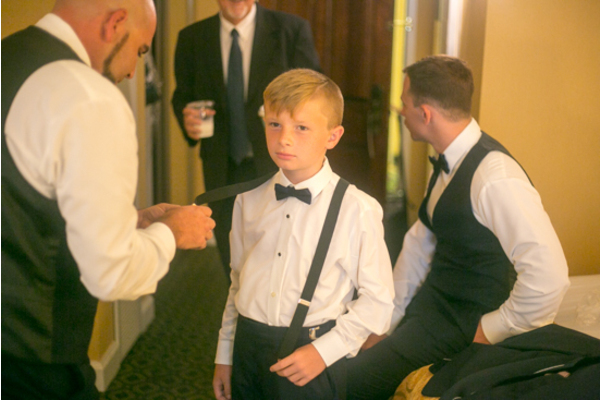 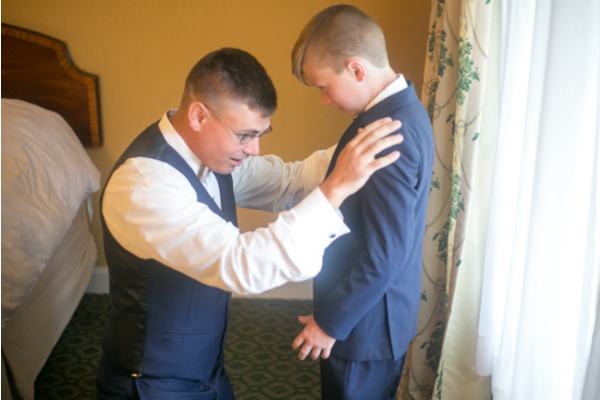 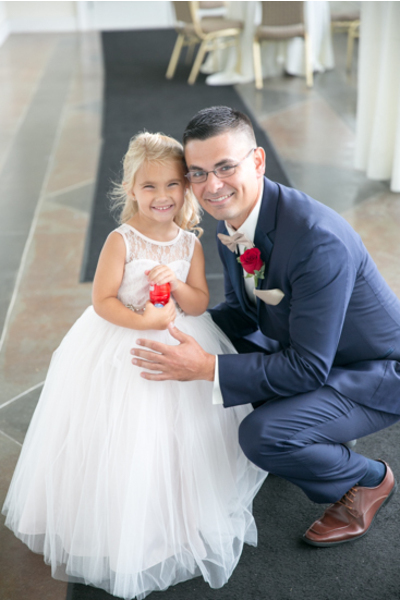 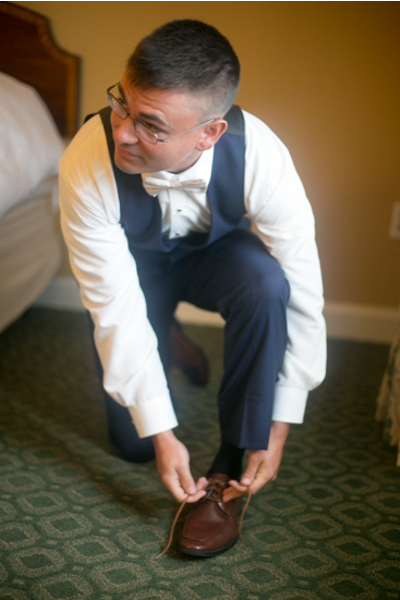 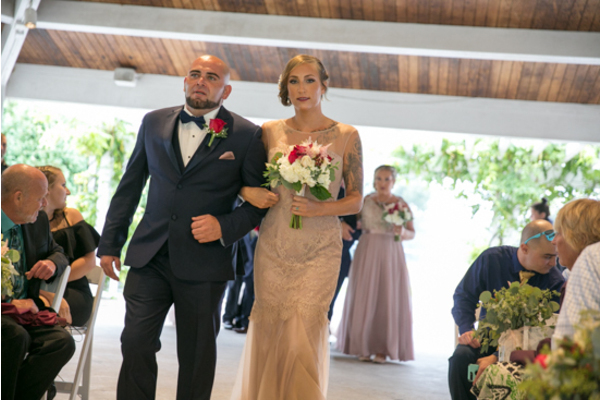 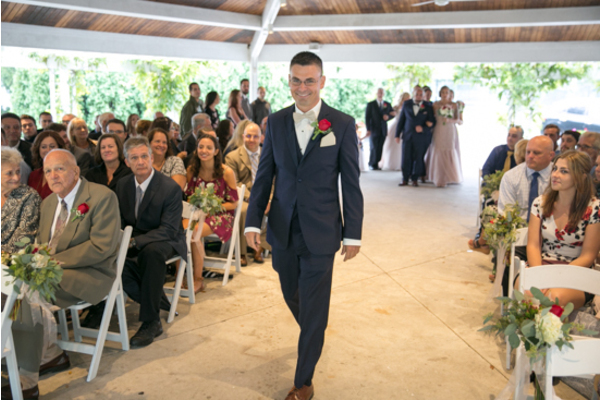 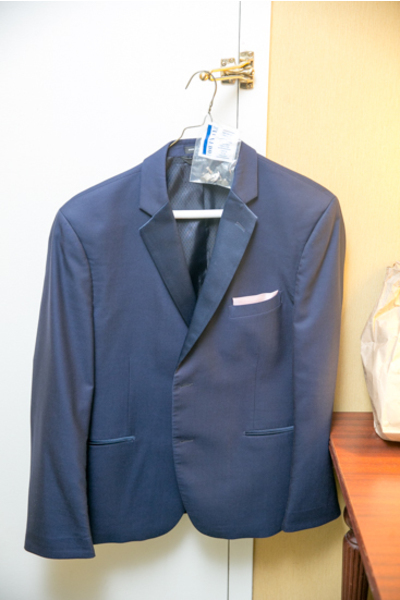 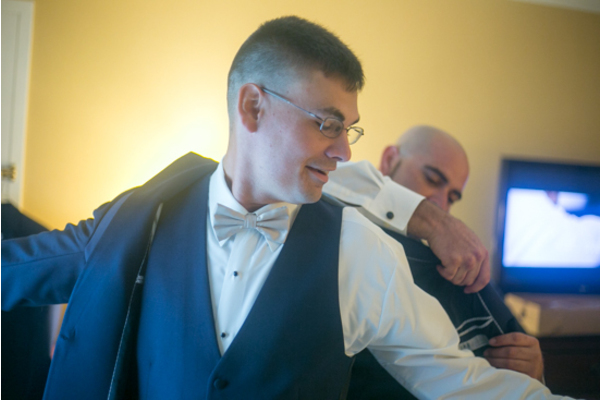 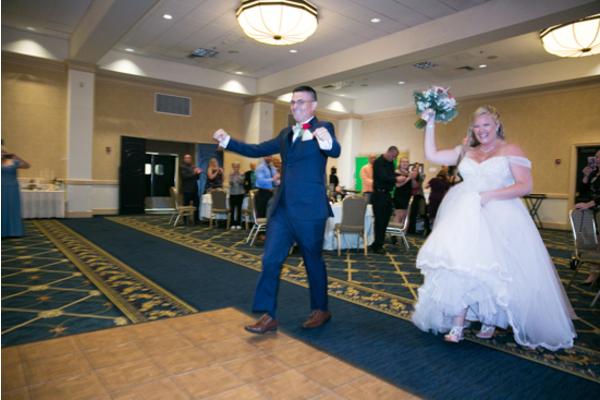 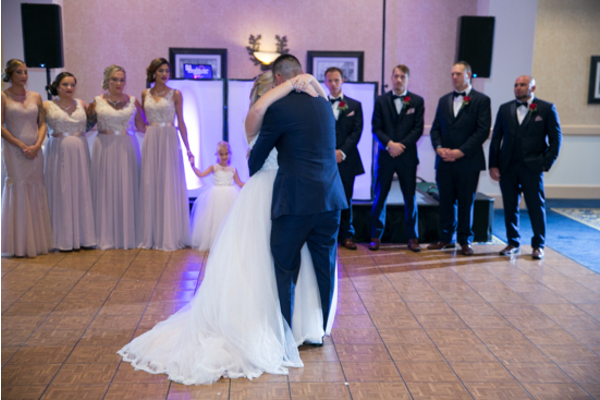 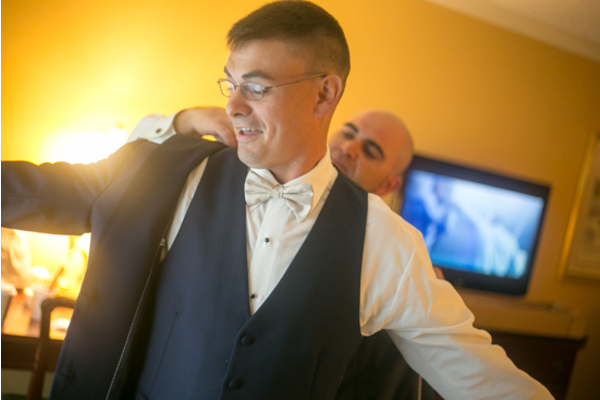 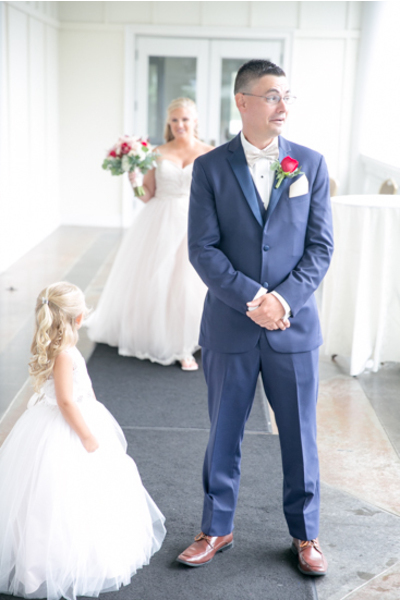 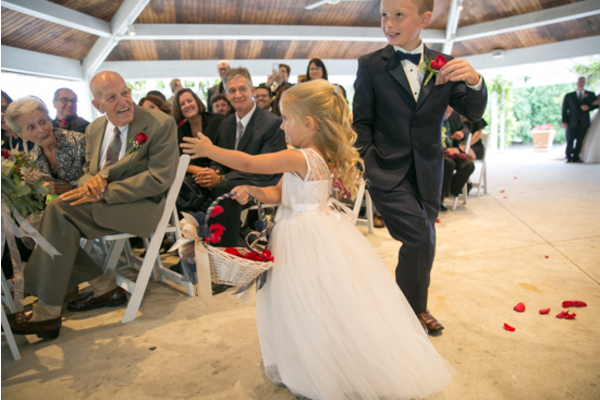 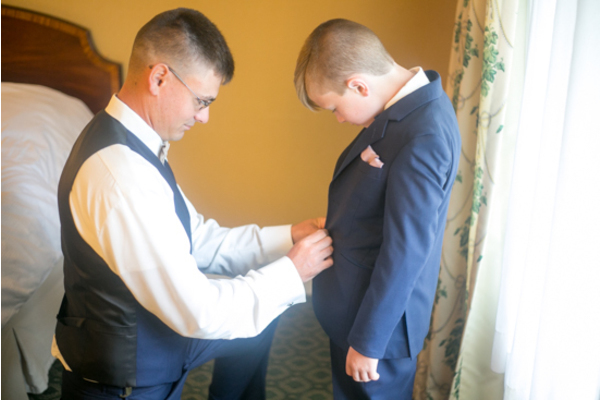 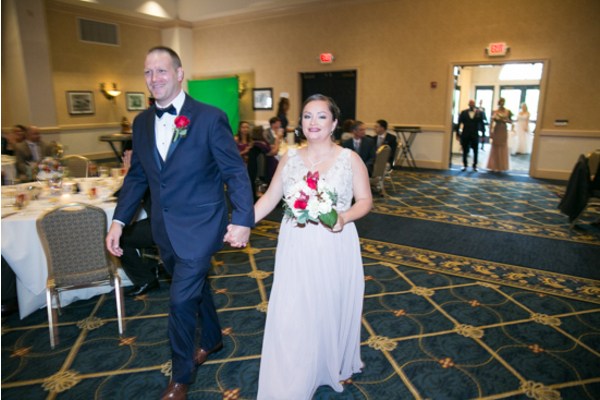 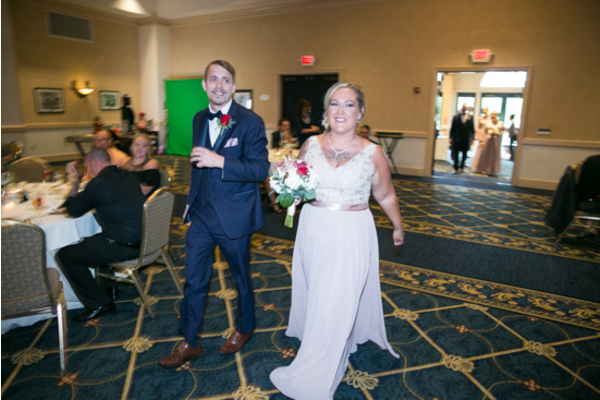 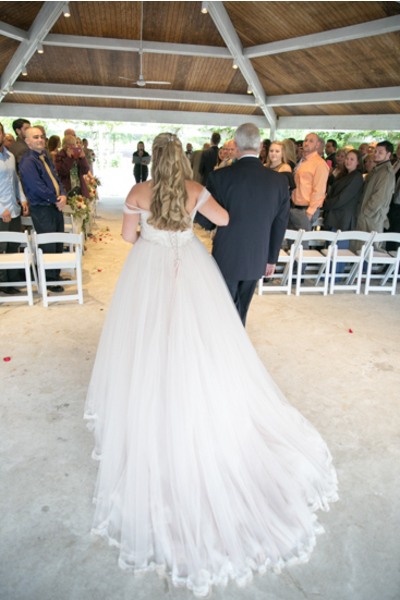 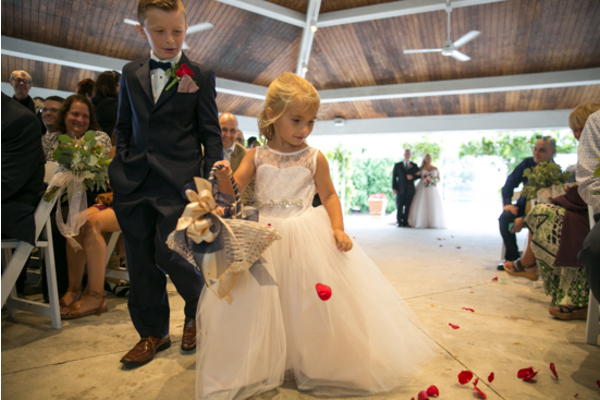 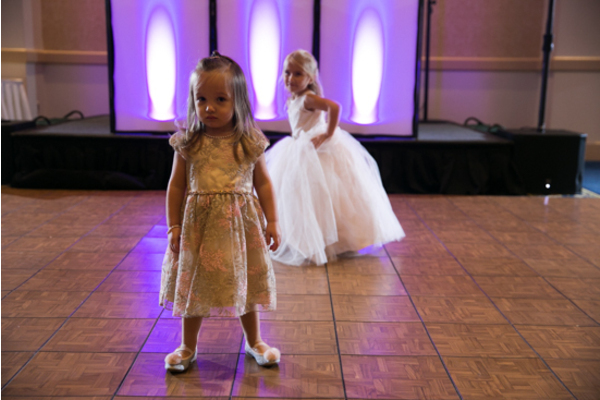 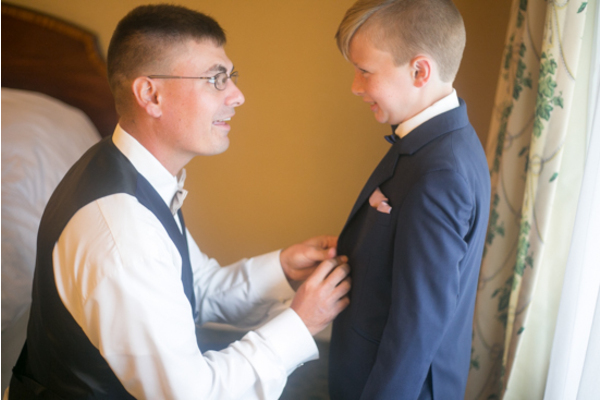 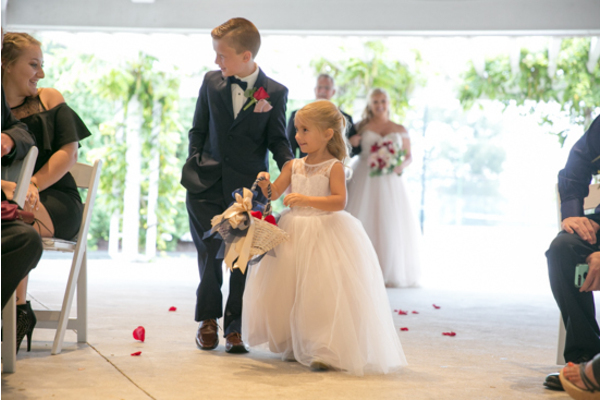 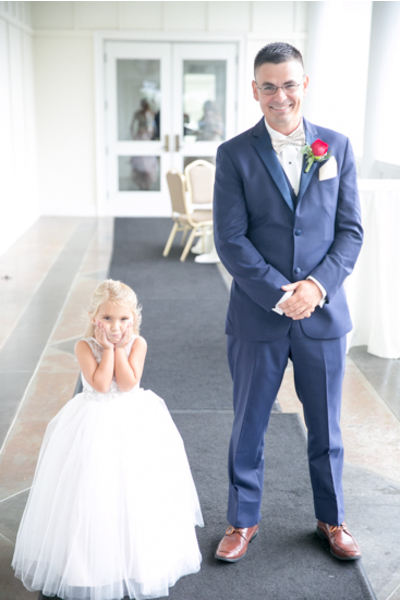 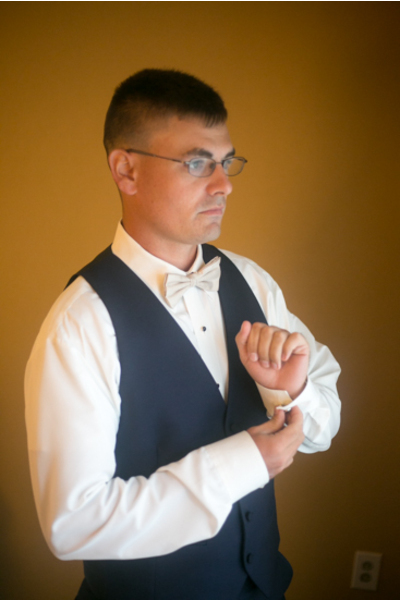 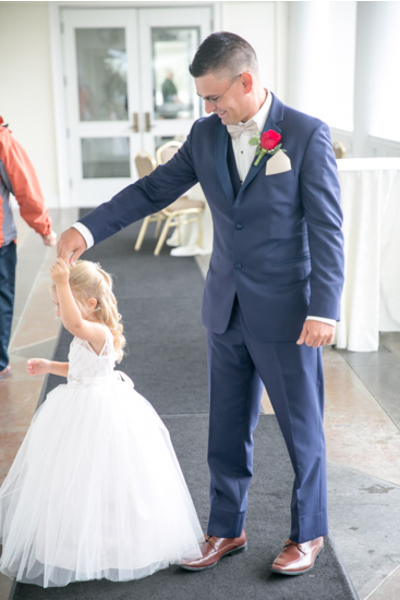 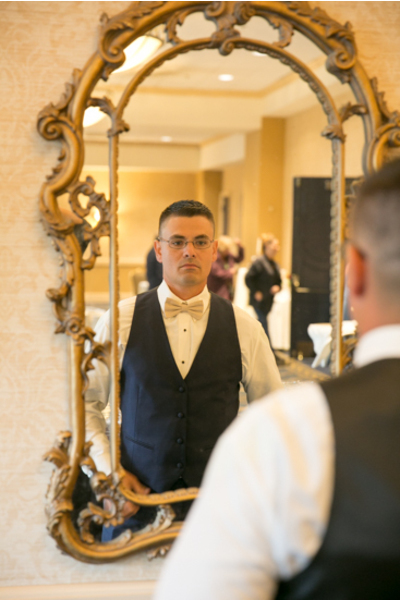 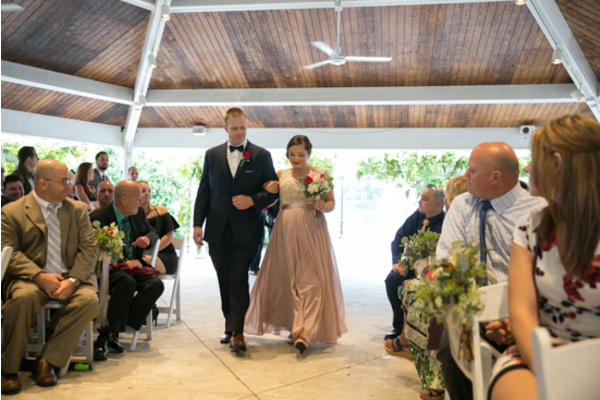 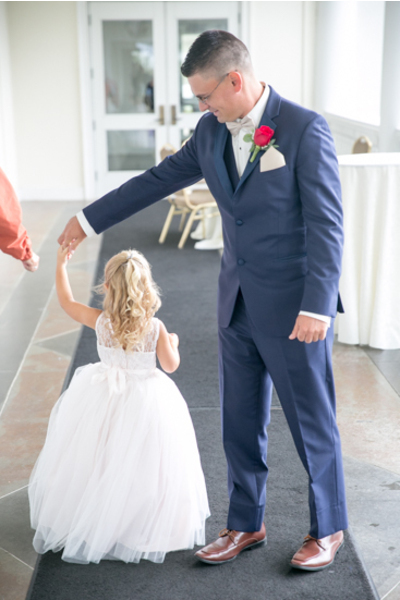 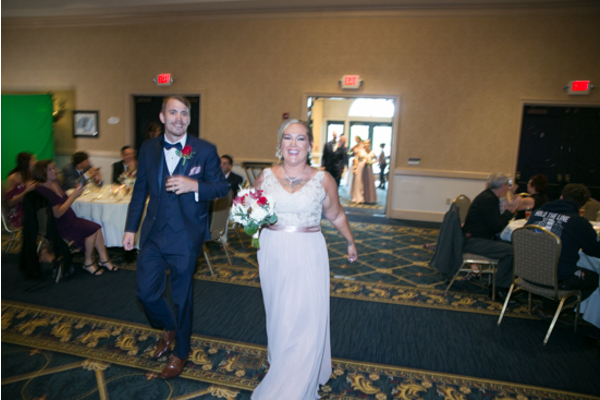 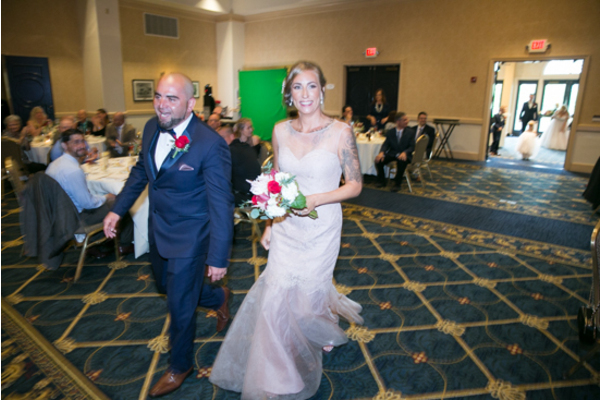 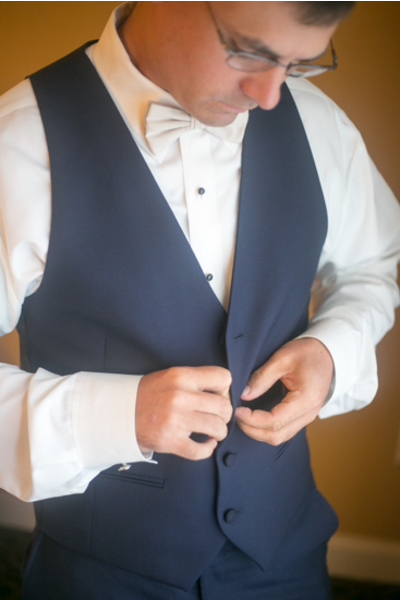 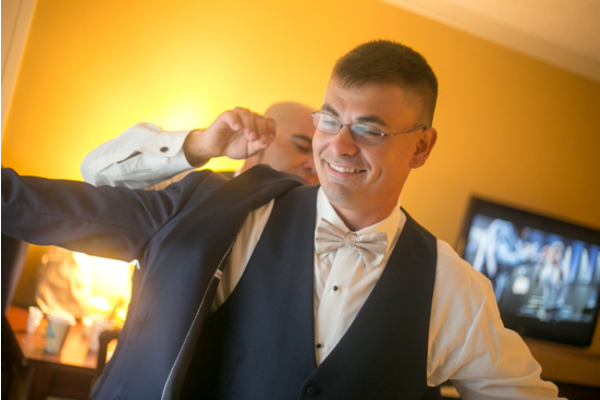 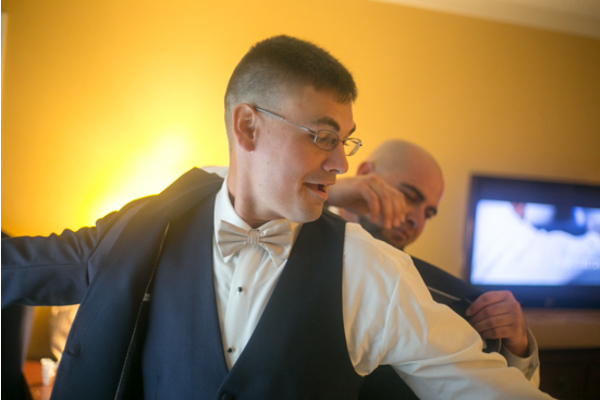 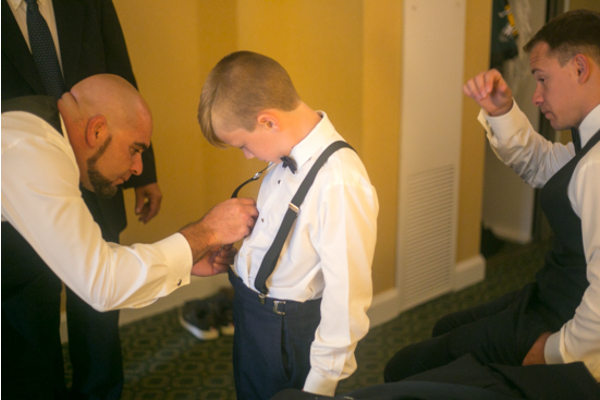 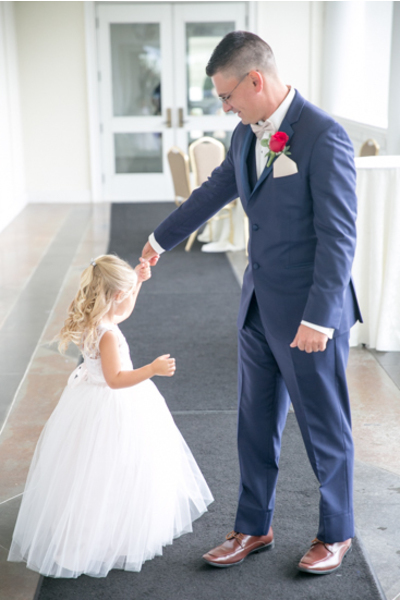 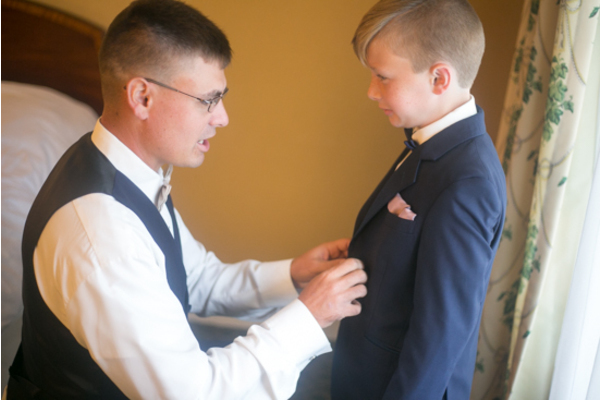 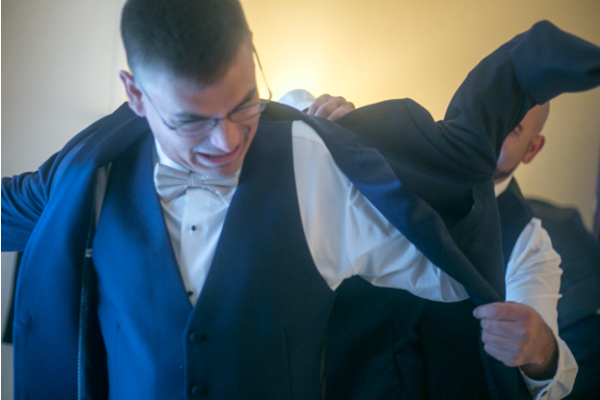 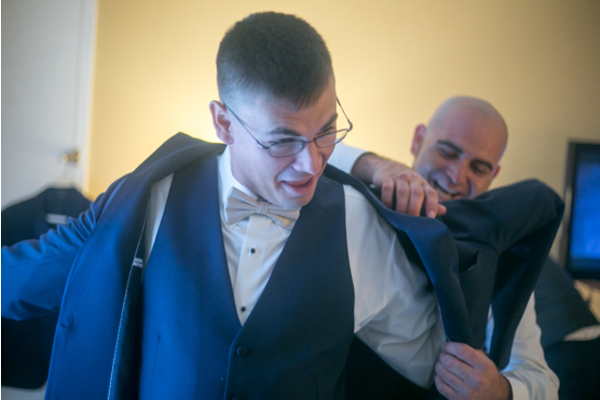 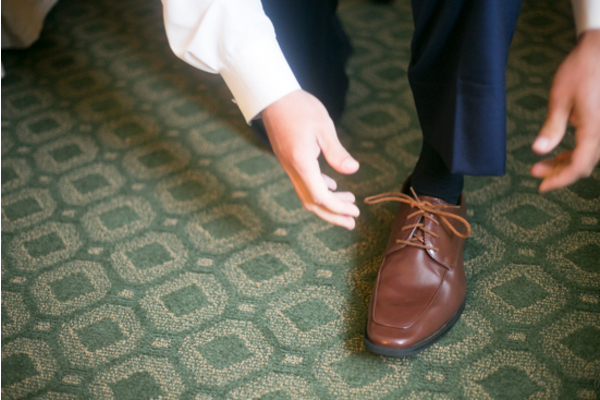 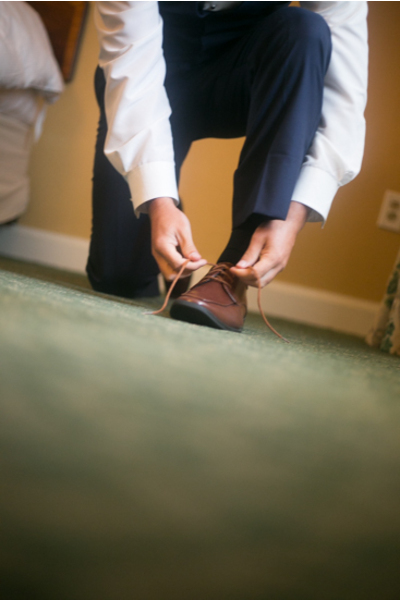 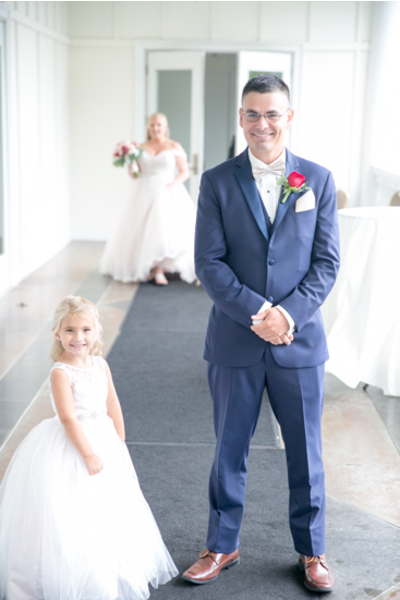 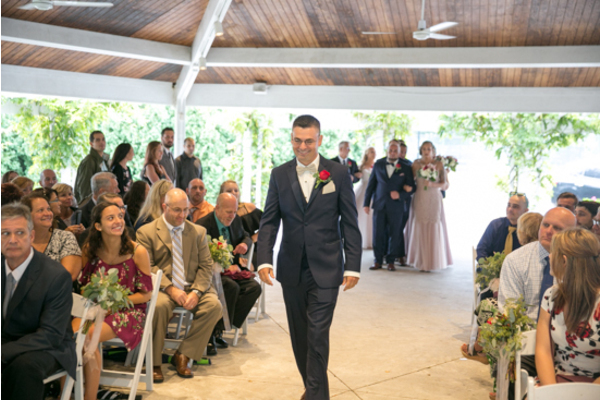 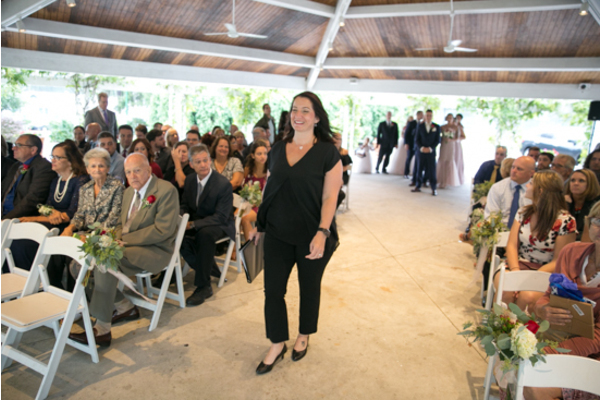 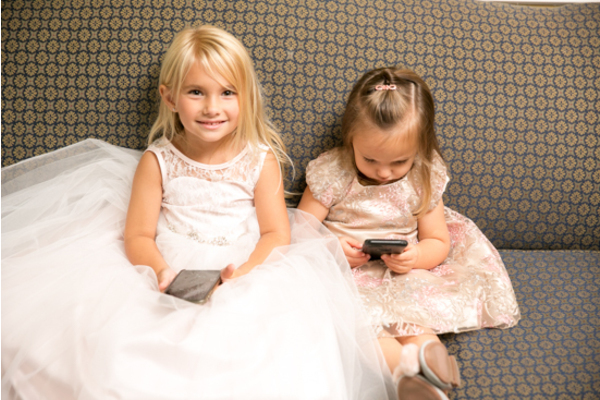 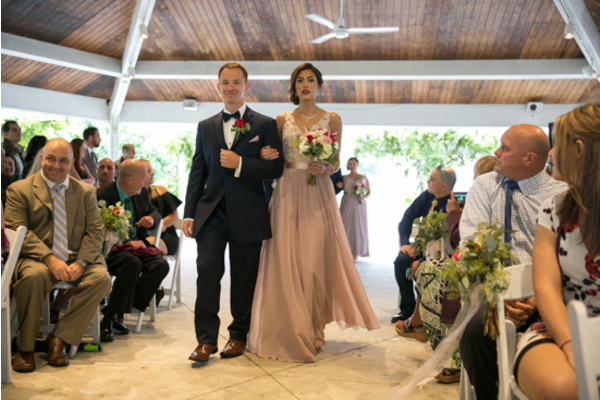 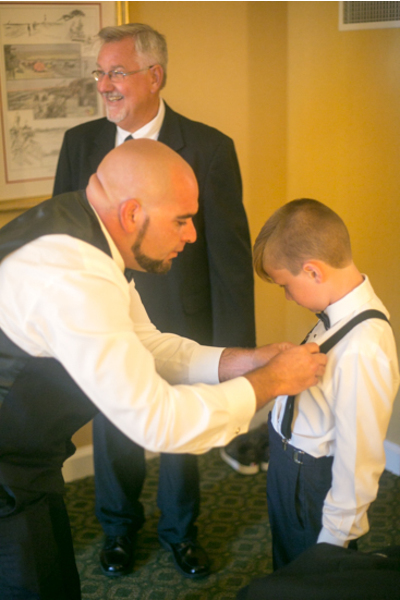 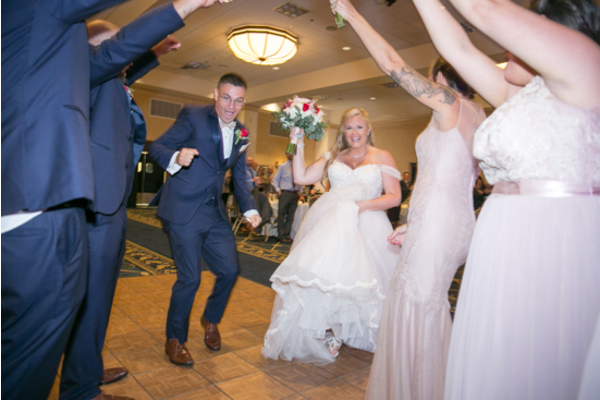 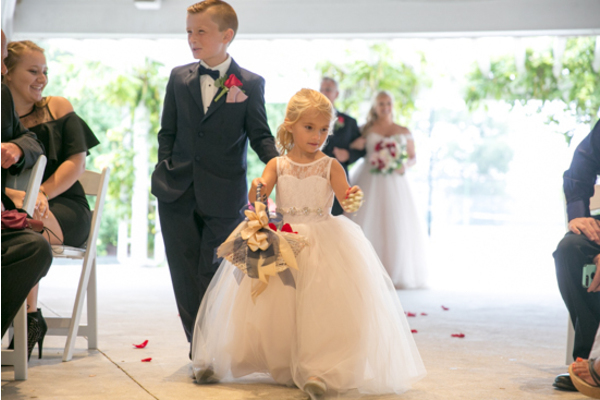 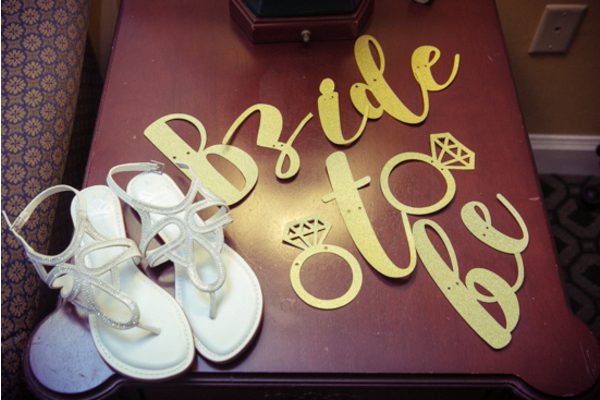 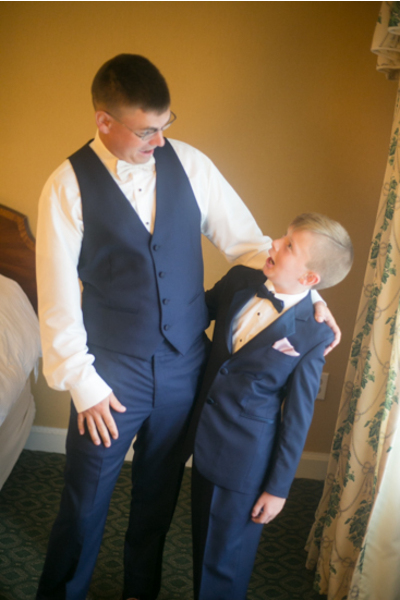 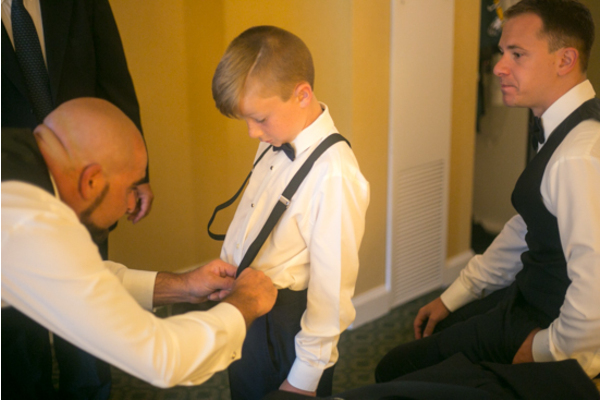 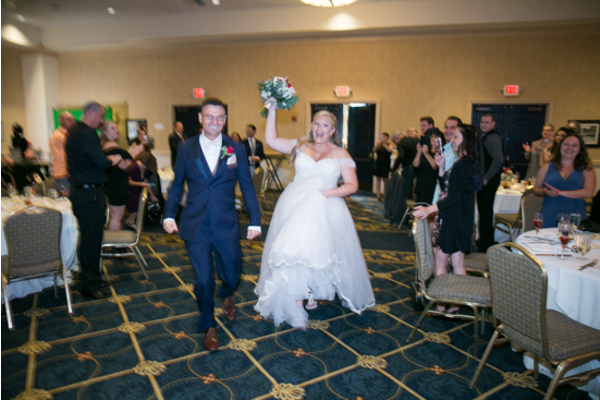 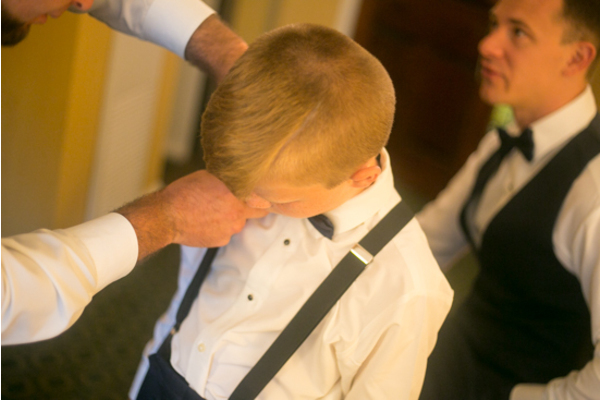 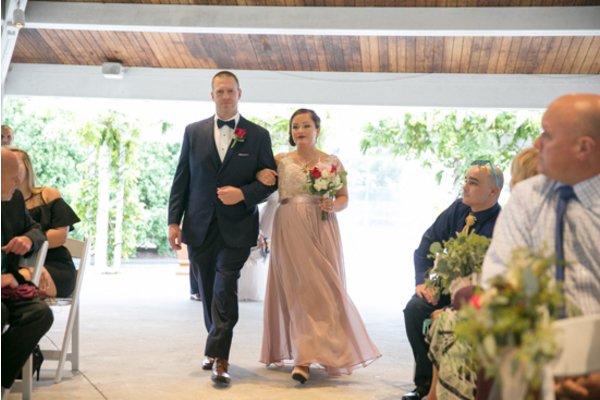 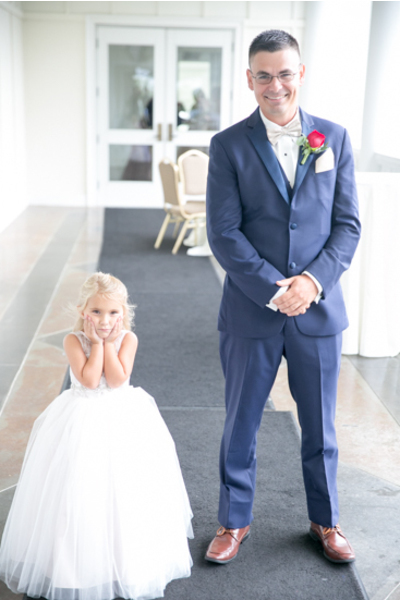 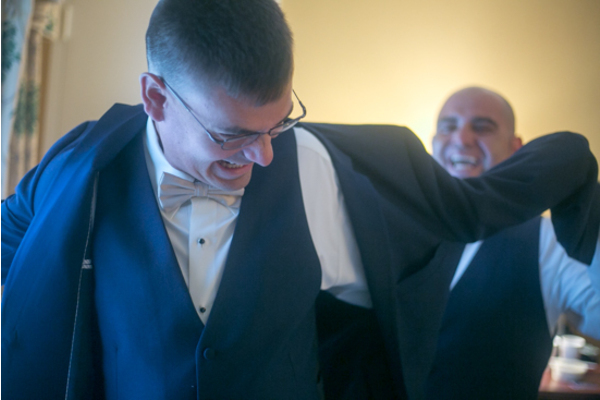 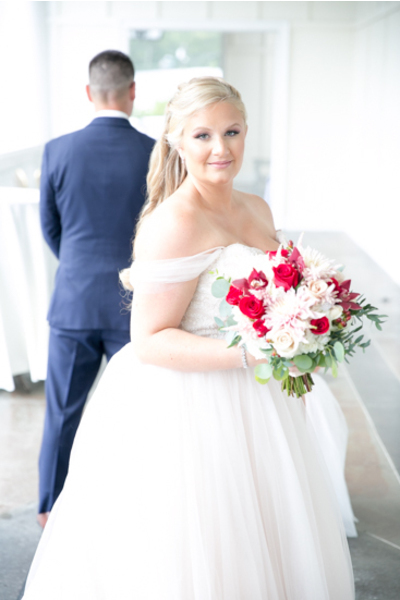 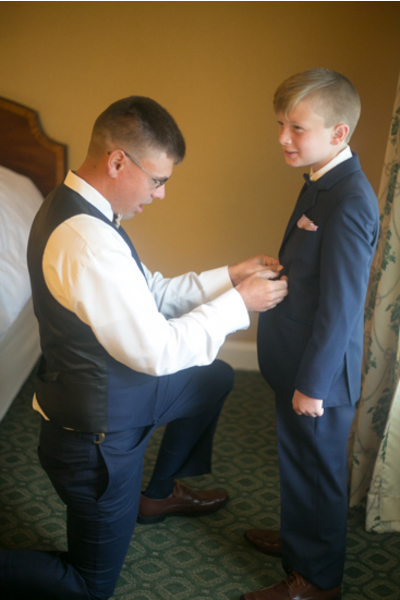 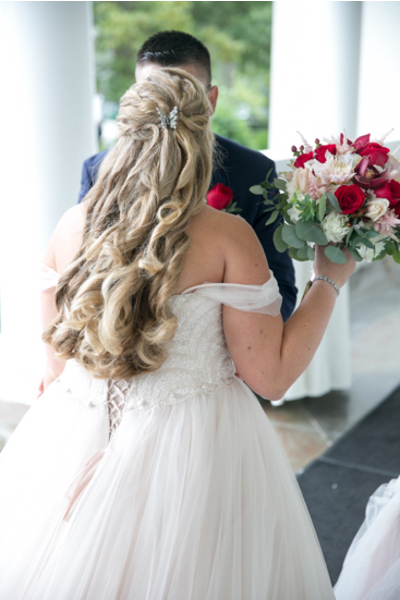 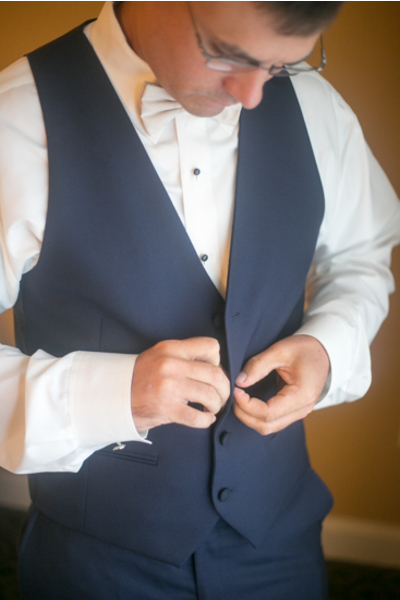 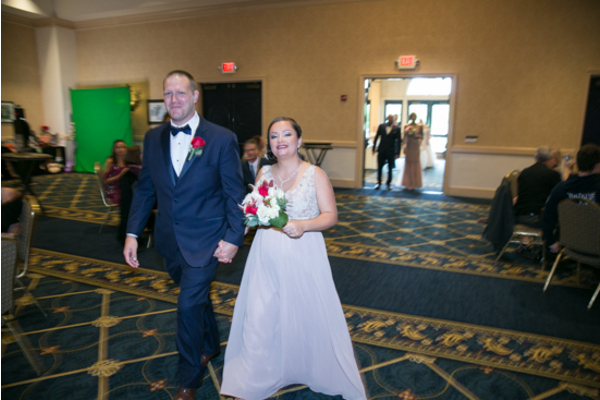 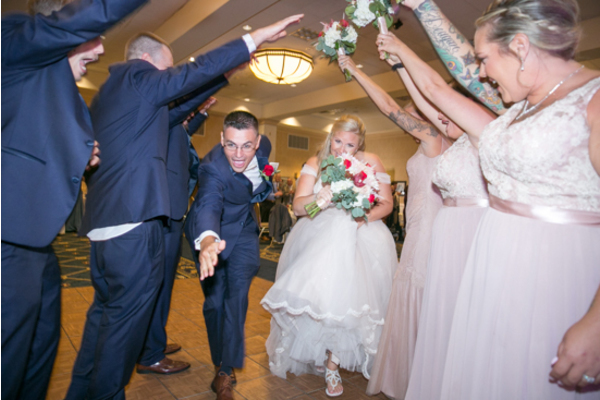 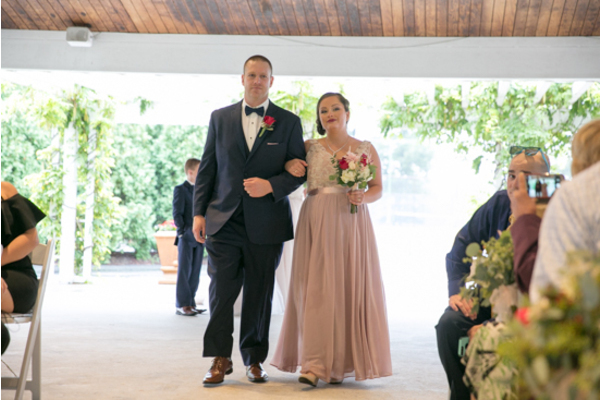 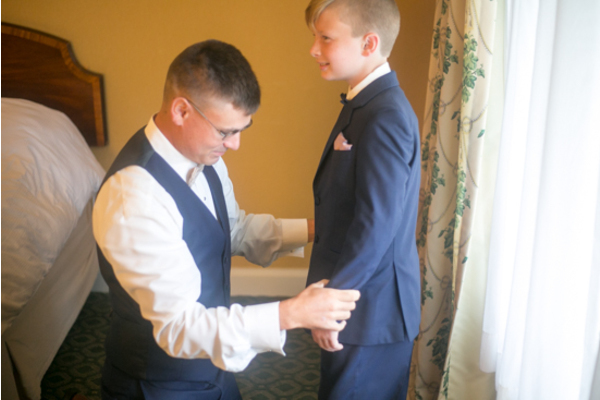 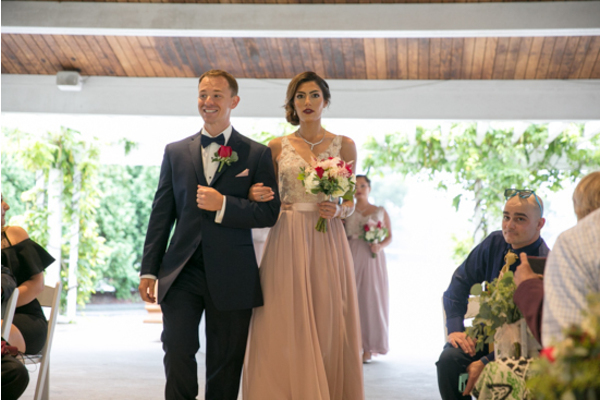 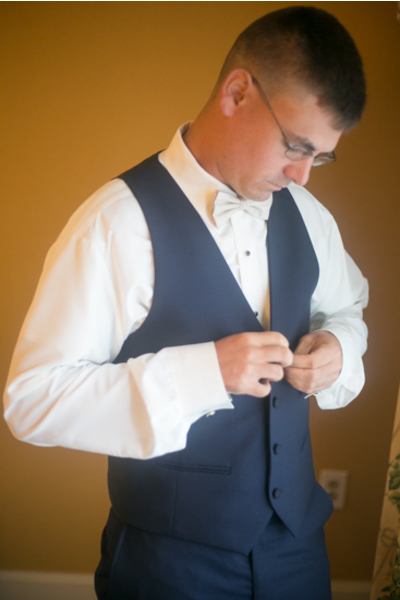 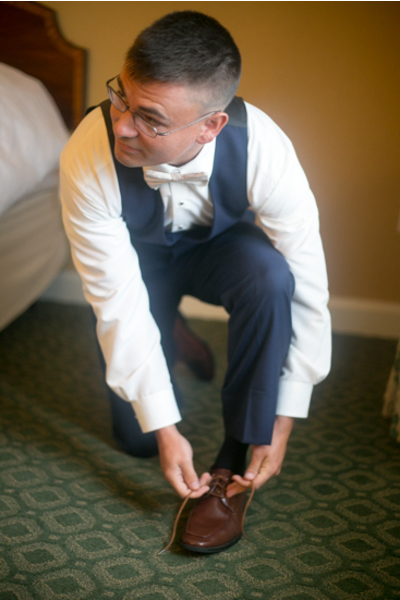 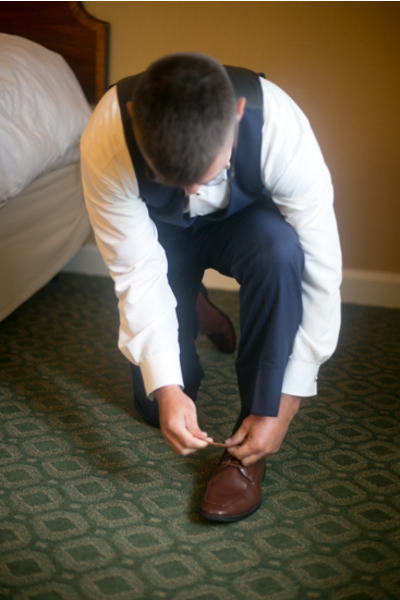 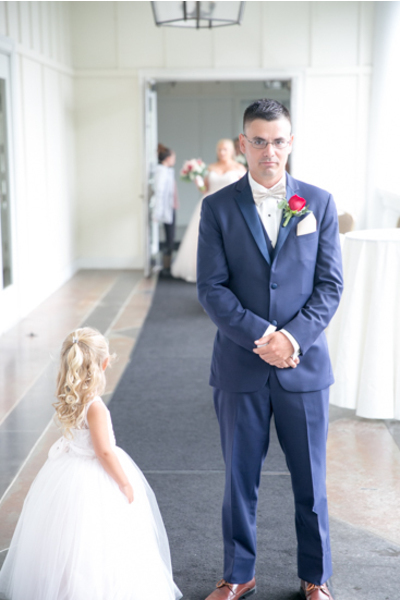 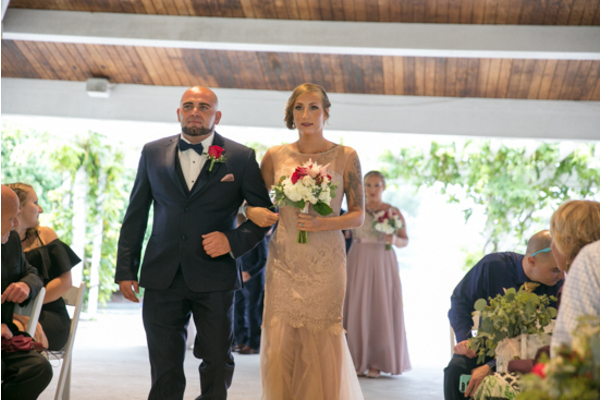 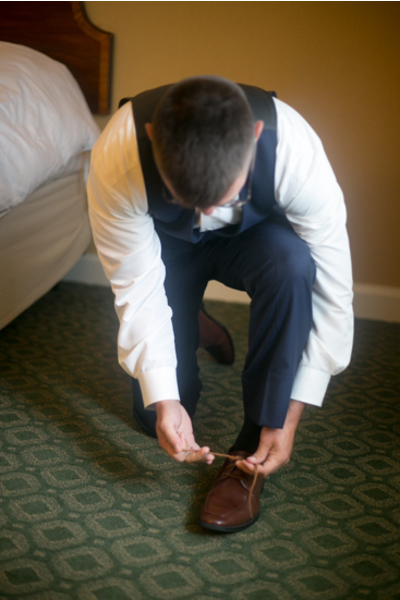 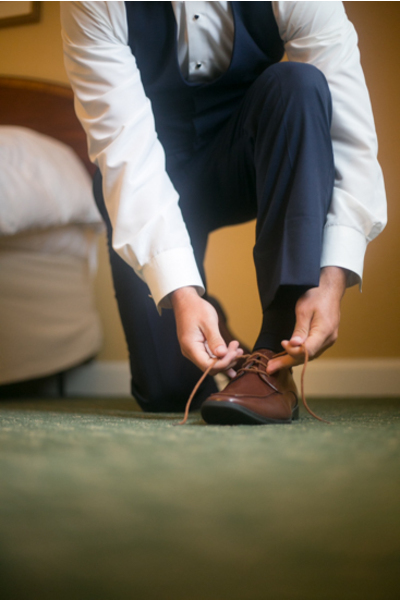 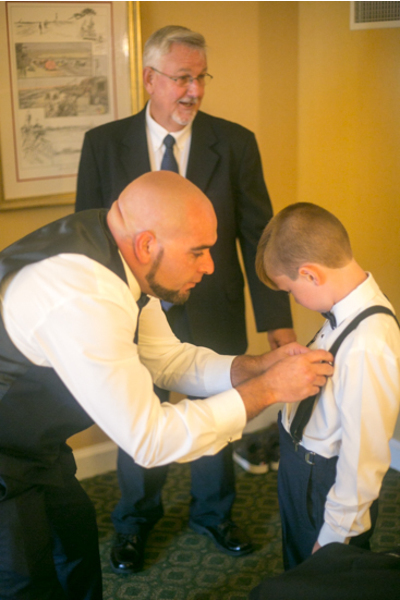 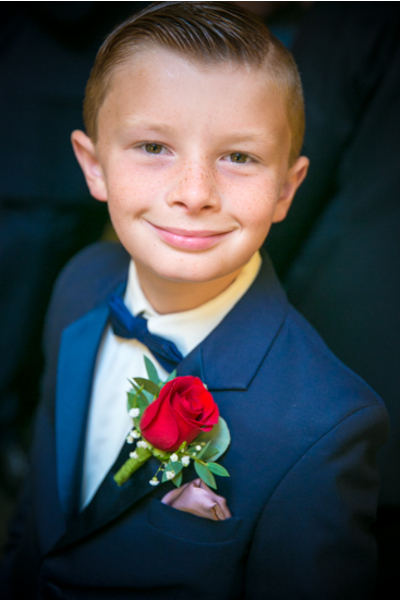 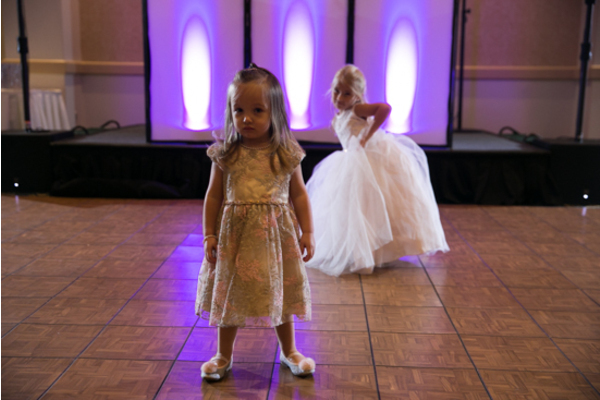 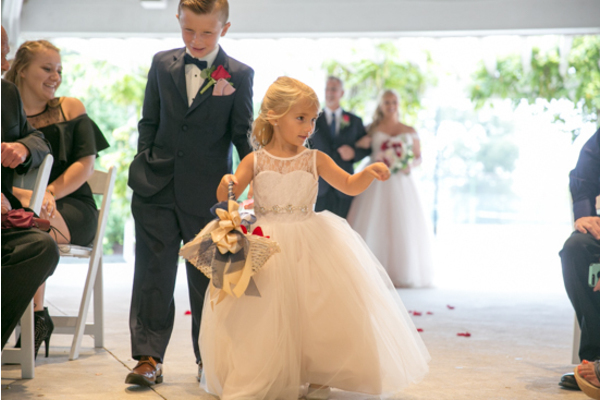 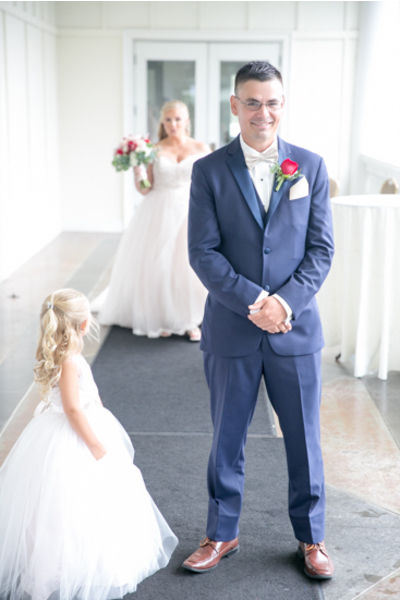 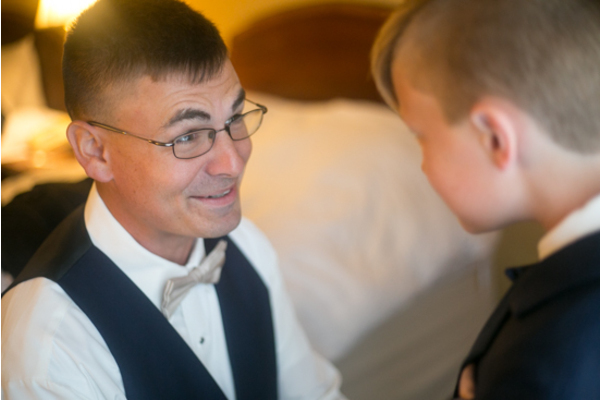 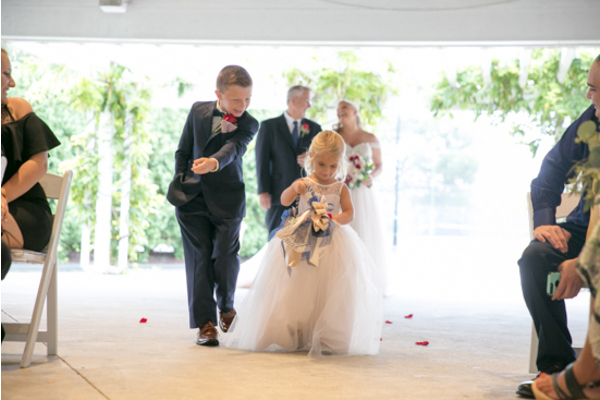 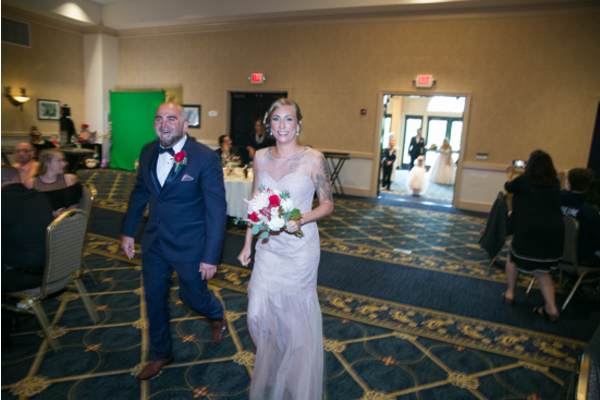 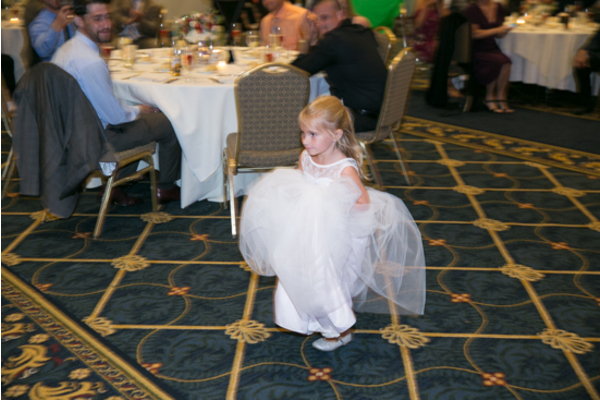 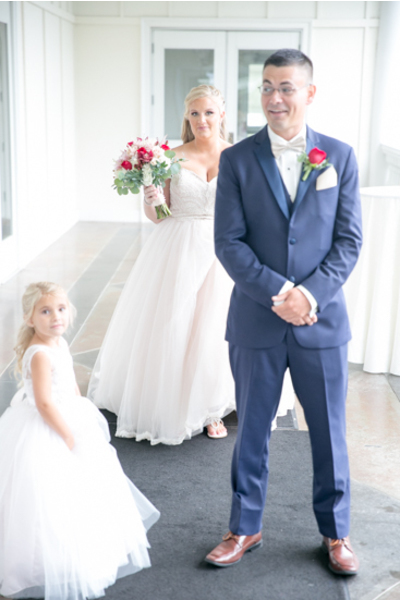 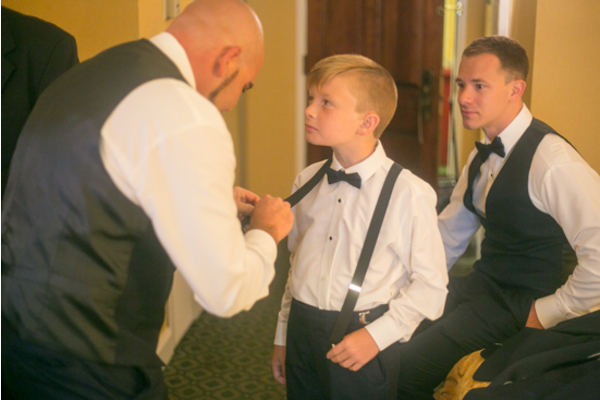 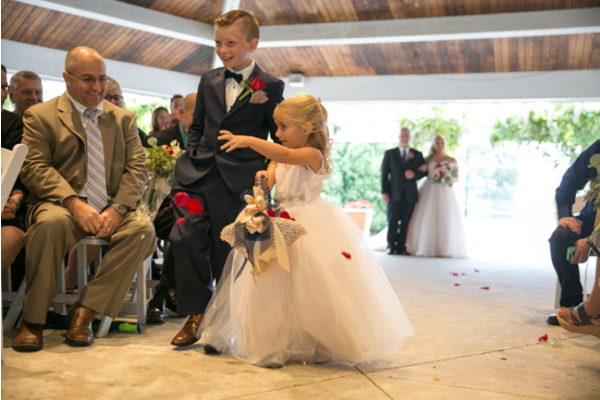 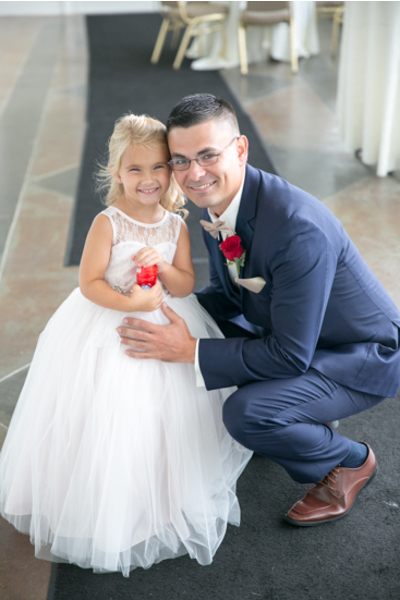 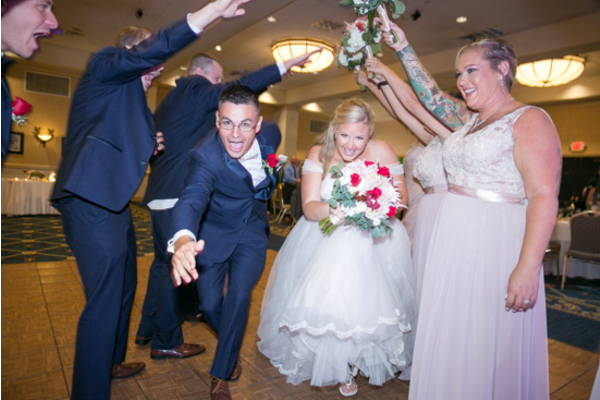 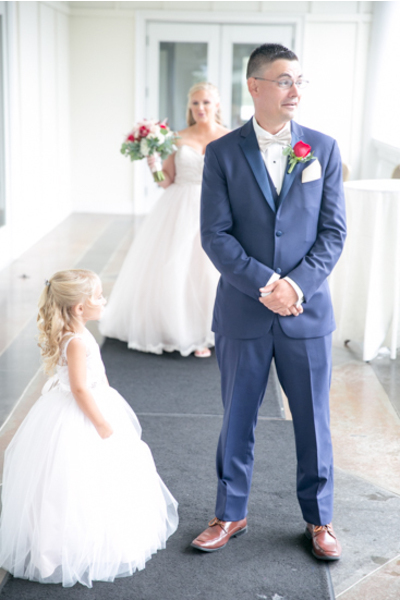 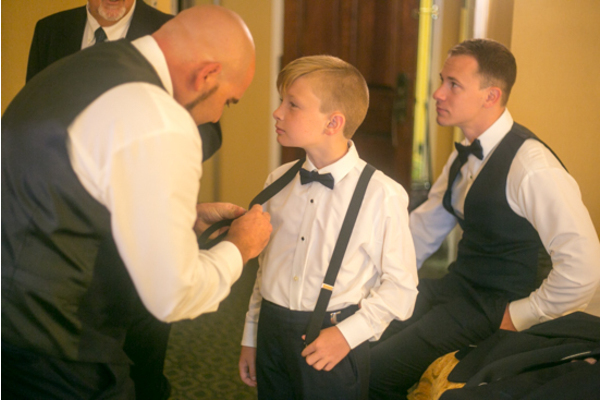 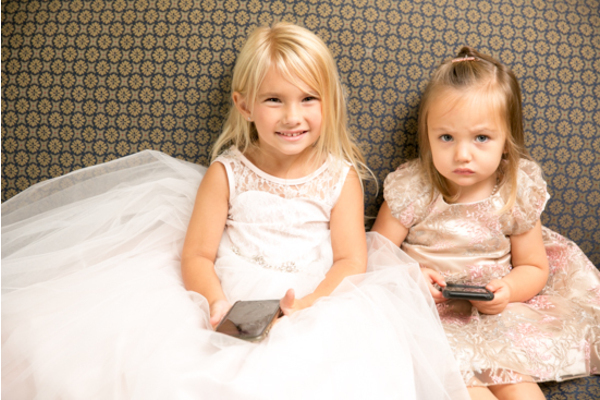 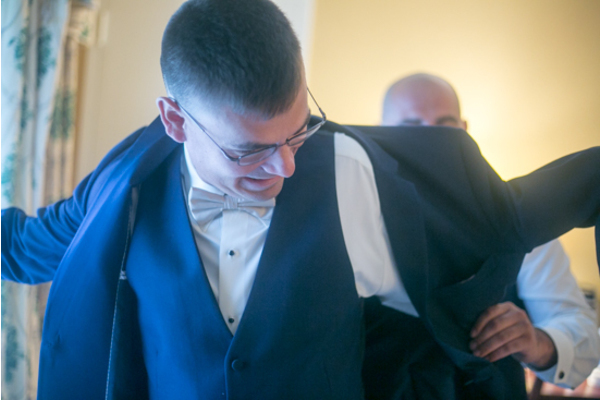 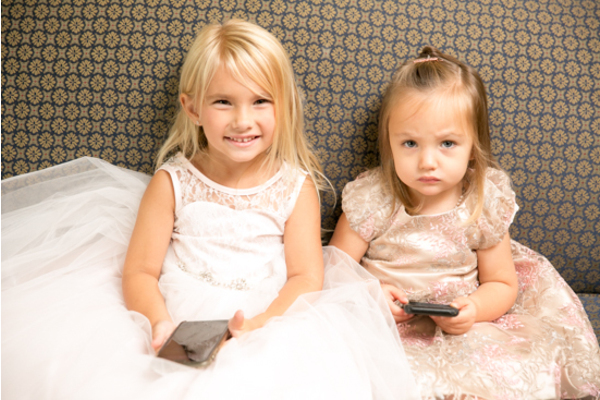 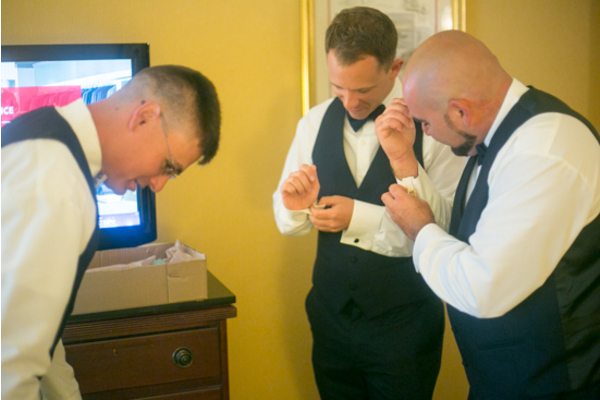 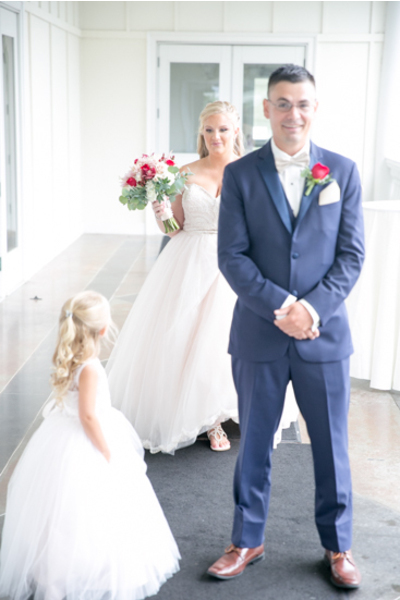 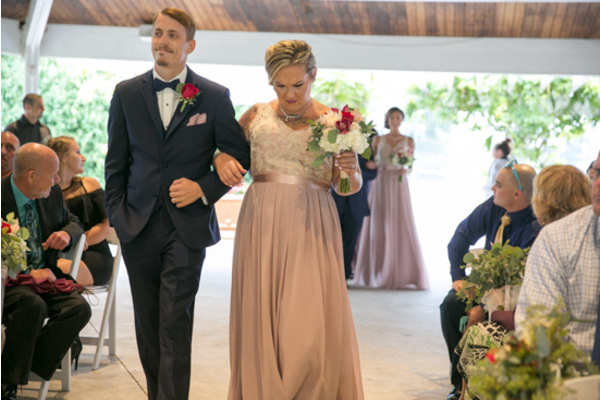 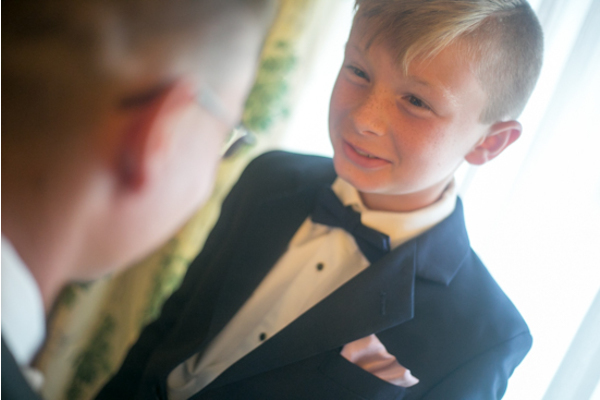 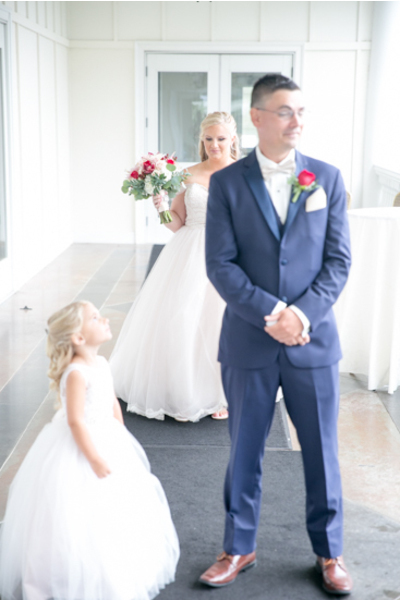 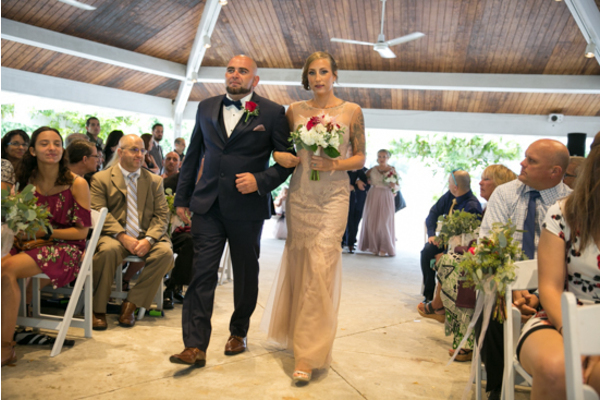 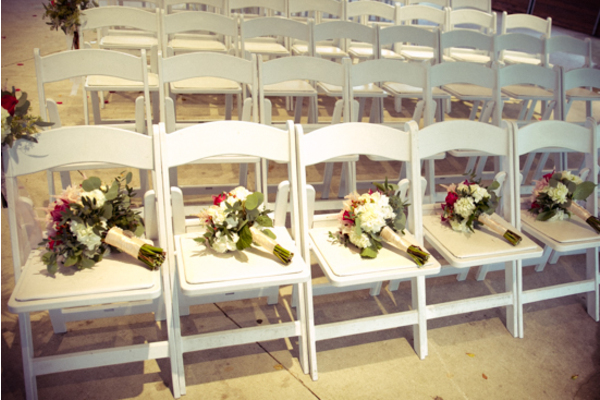 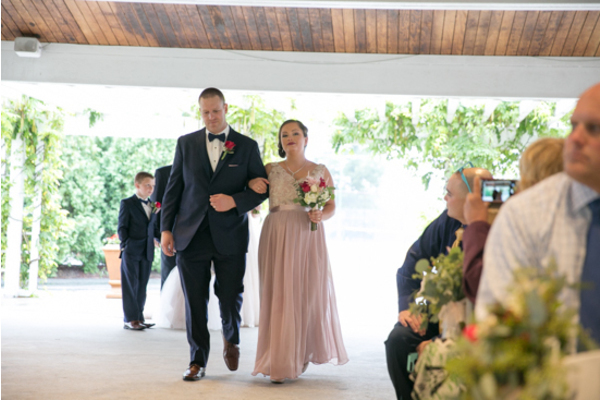 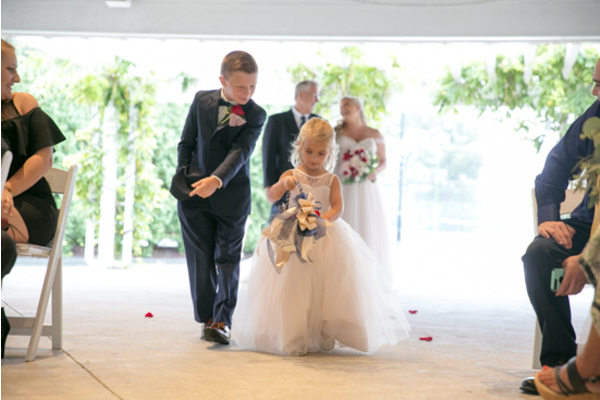 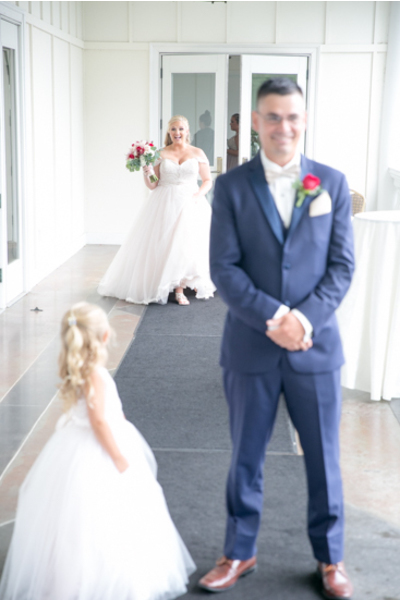 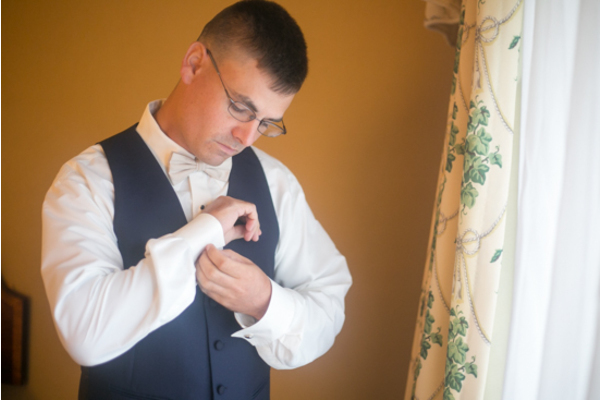 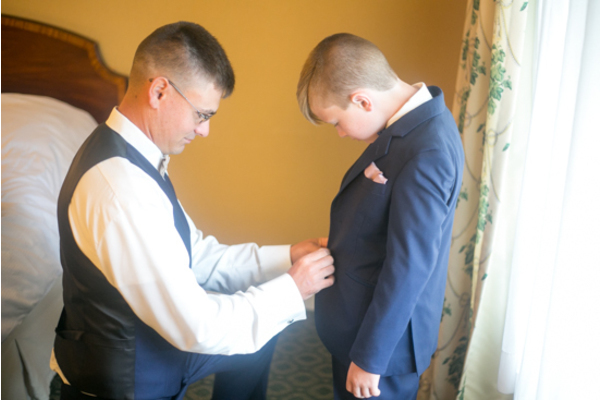 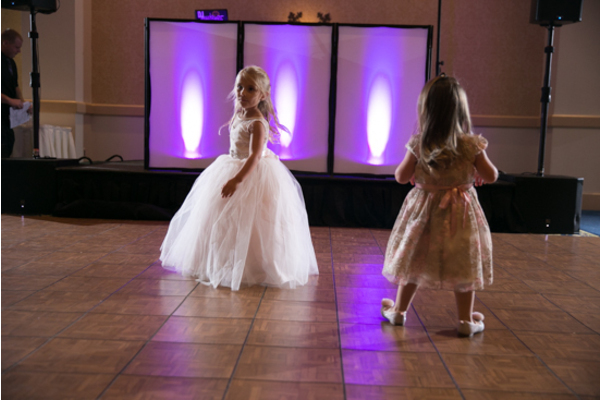 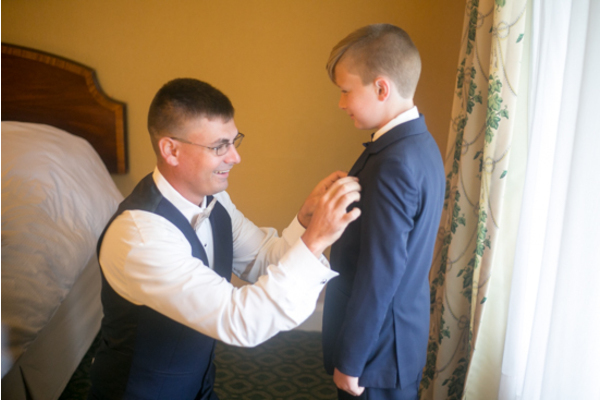 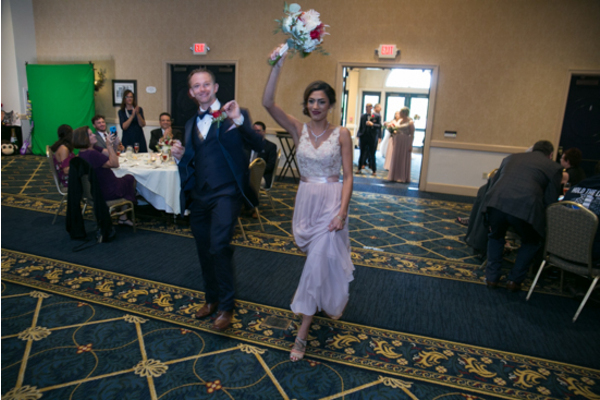 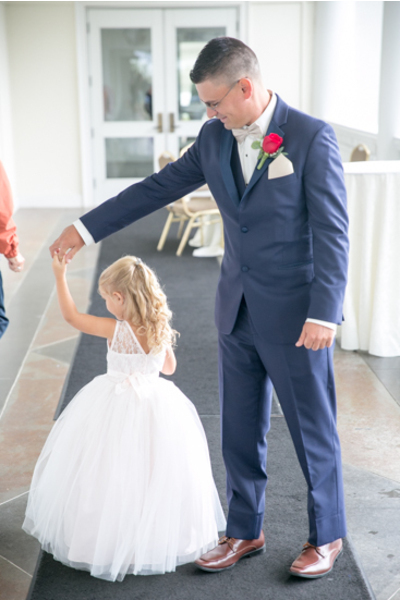 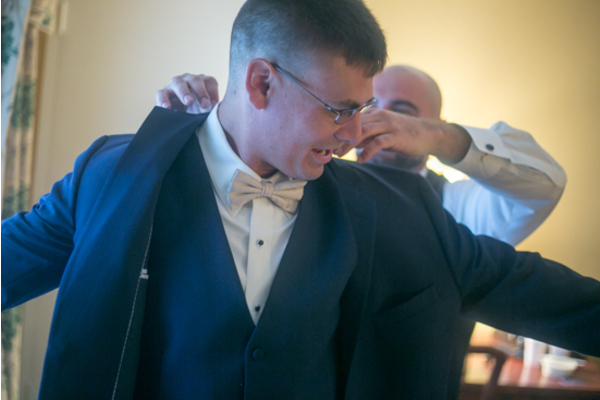 Once everyone was ready, it was time to make the walk down the aisle. 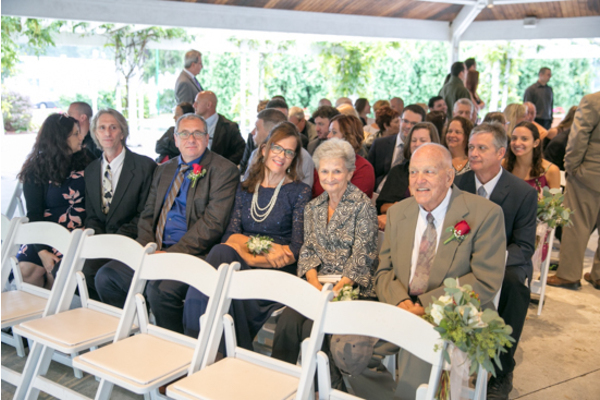 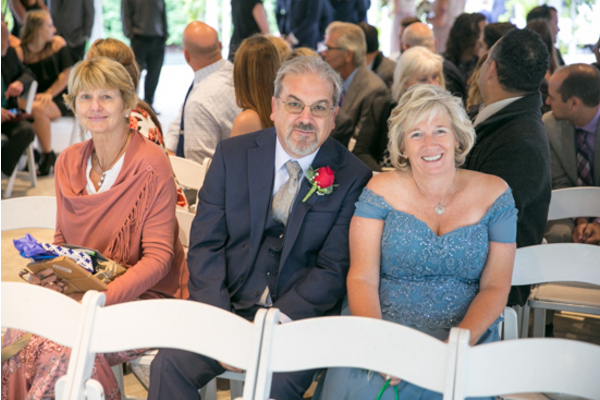 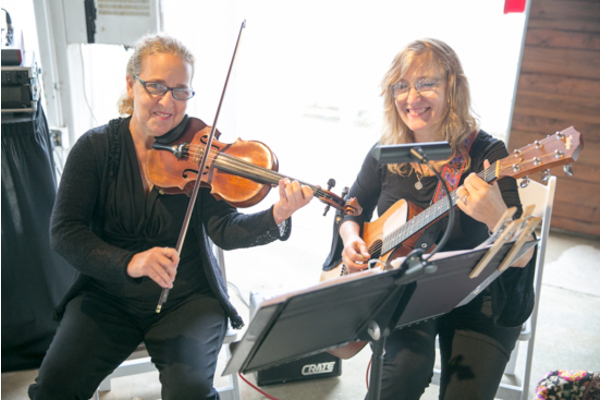 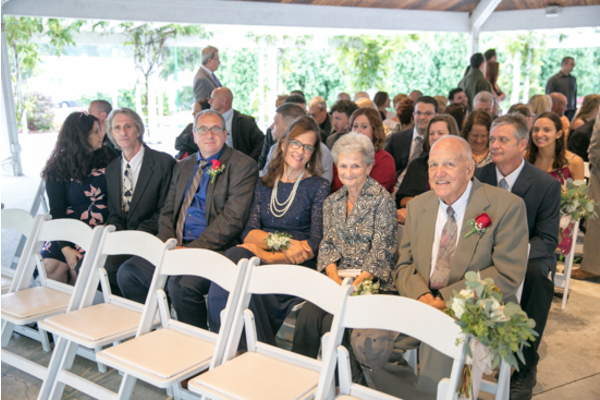 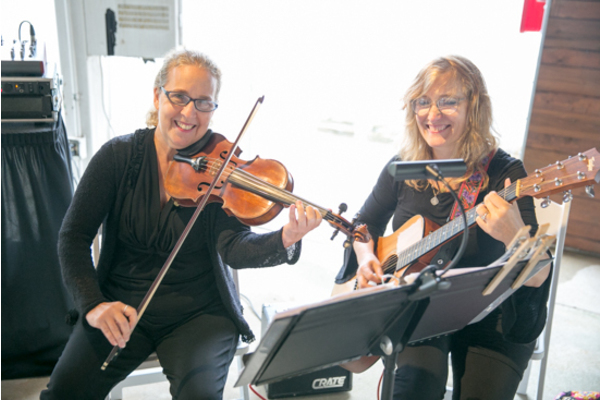 During the ceremony, friends and family made their way to their seats as violinists set the mood. 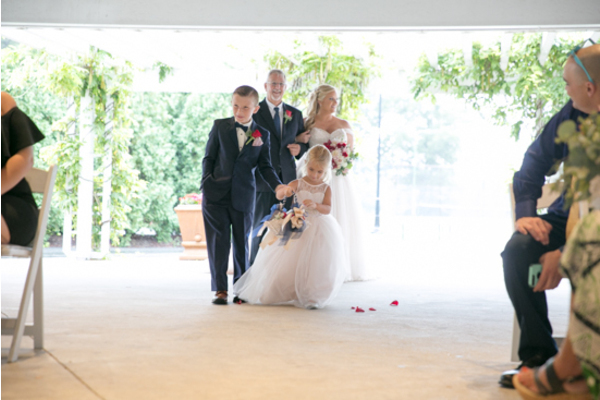 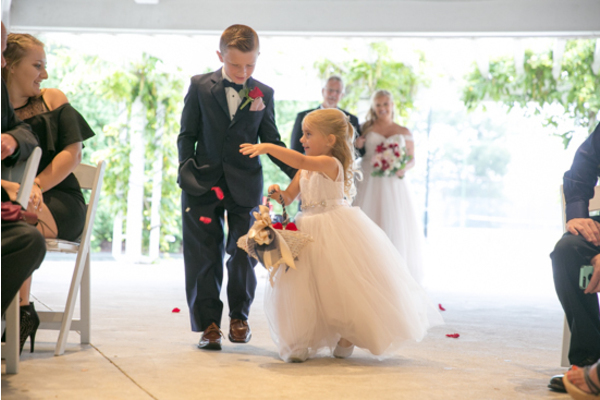 Nicole floated down the aisle to stand by her prince. 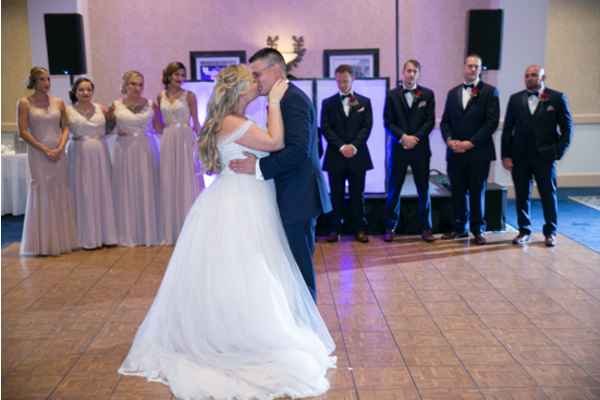 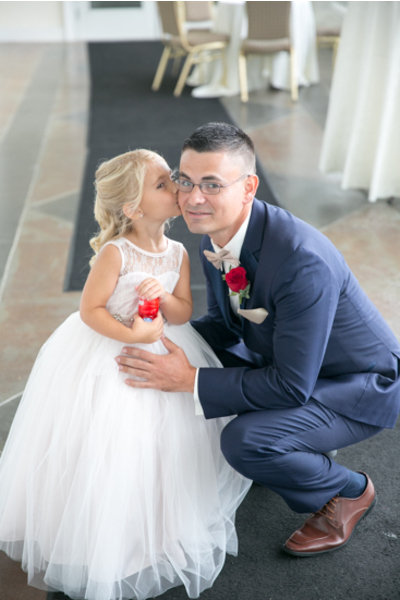 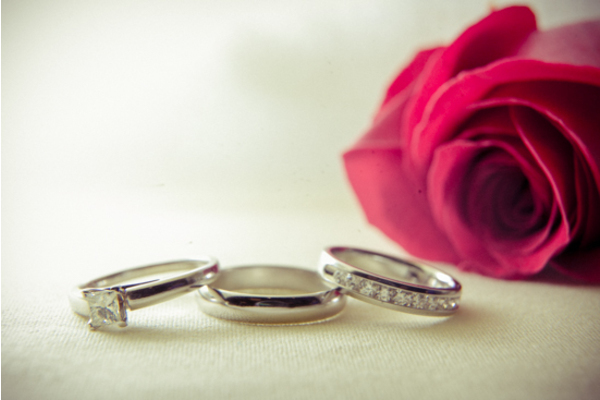 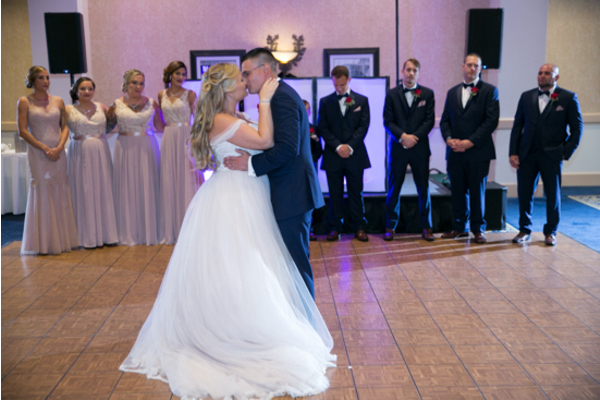 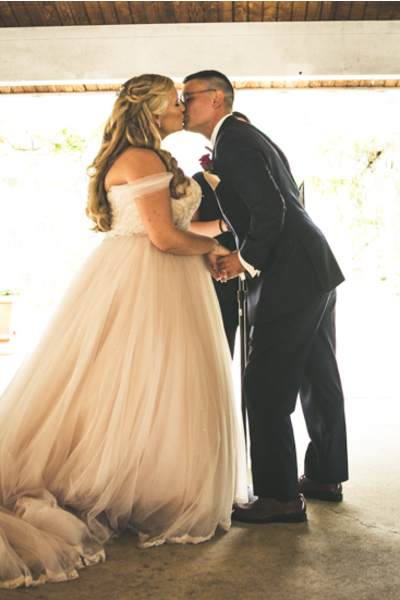 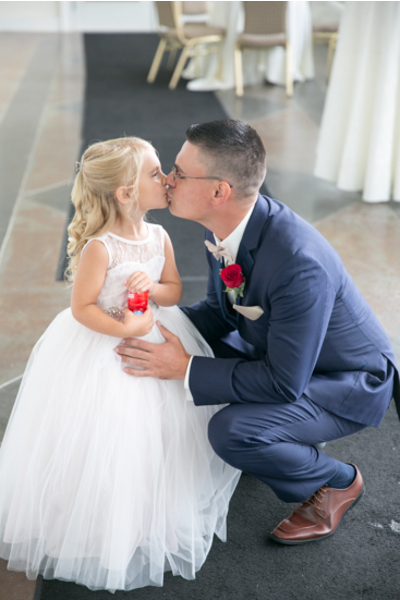 They sealed their vows with a kiss, and were finally pronounced husband and wife! 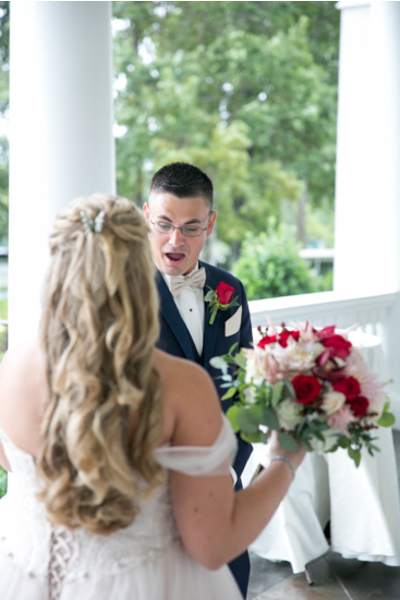 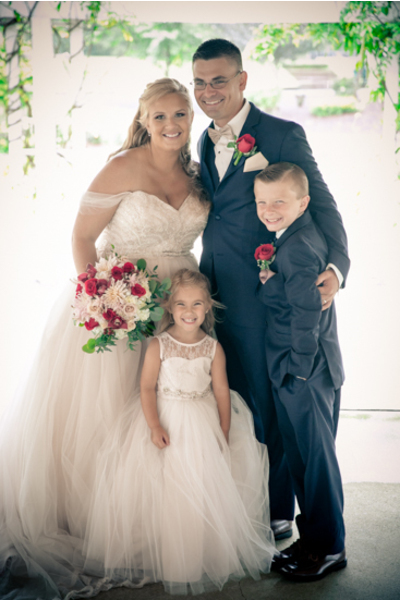 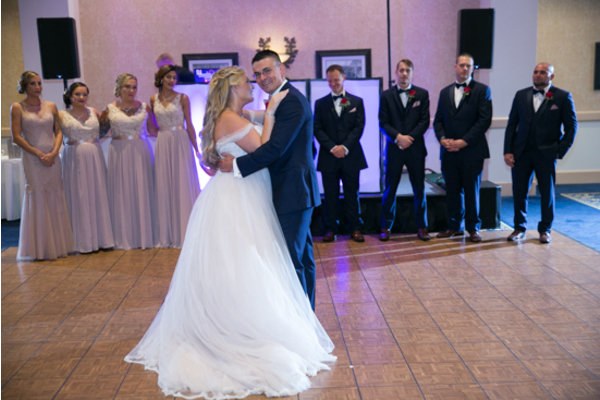 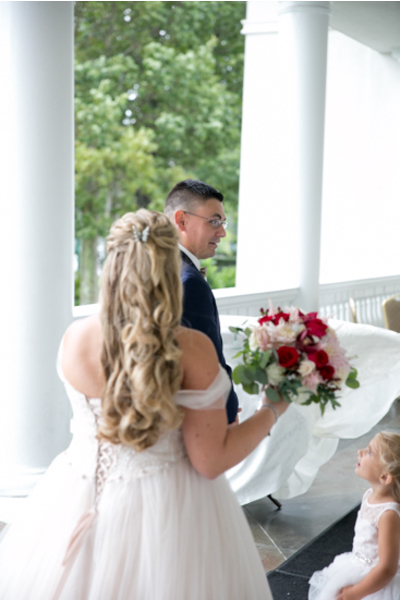 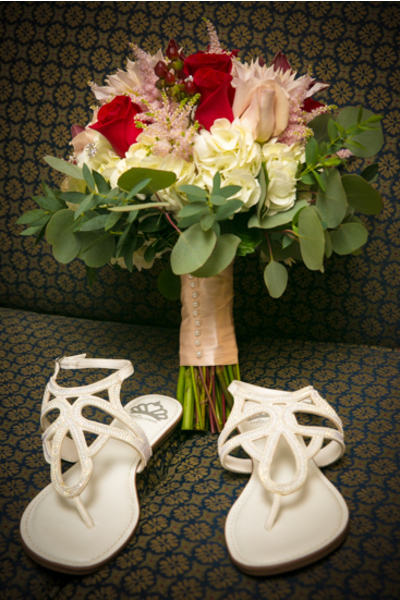 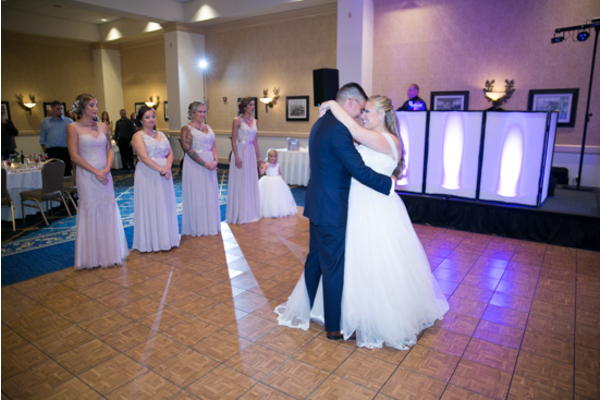 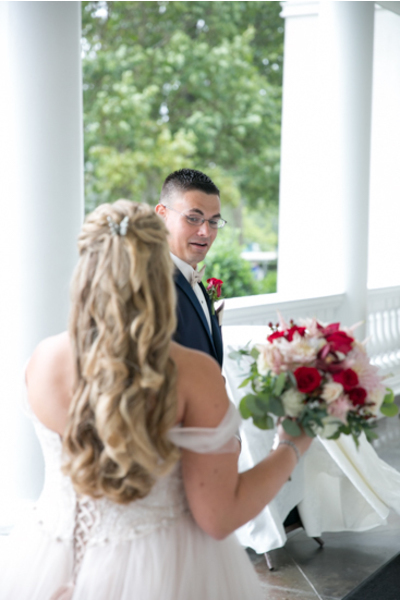 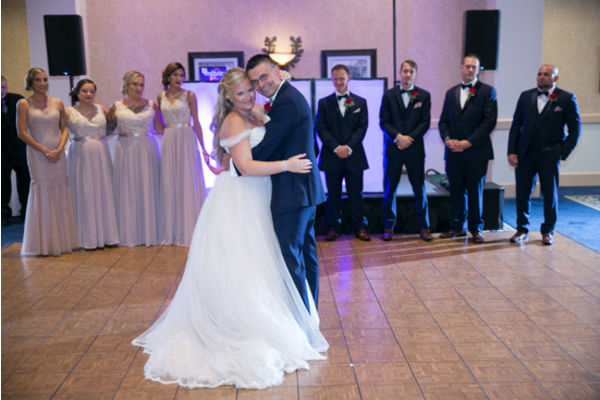 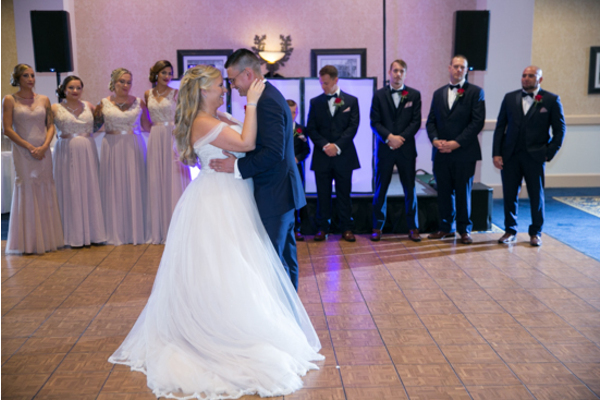 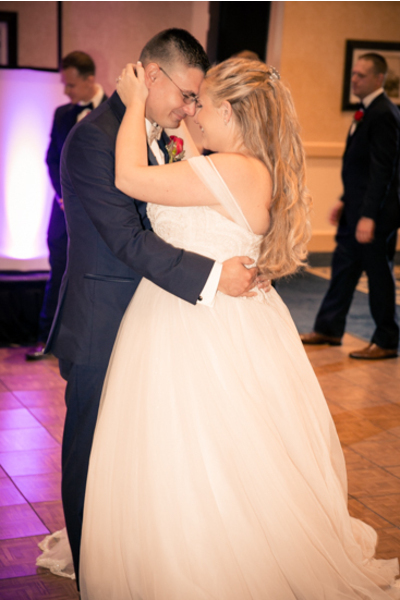 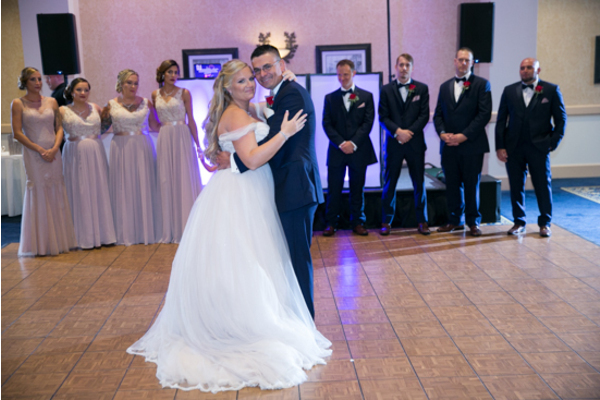 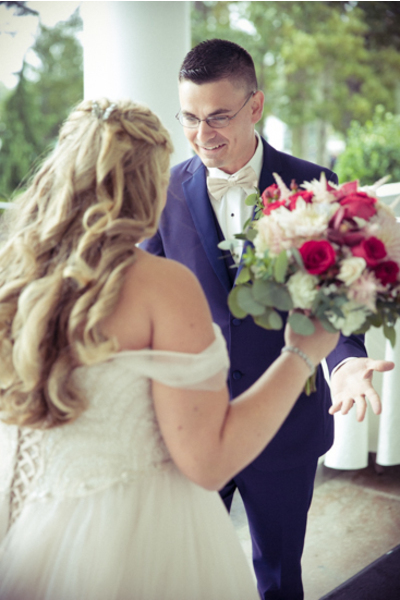 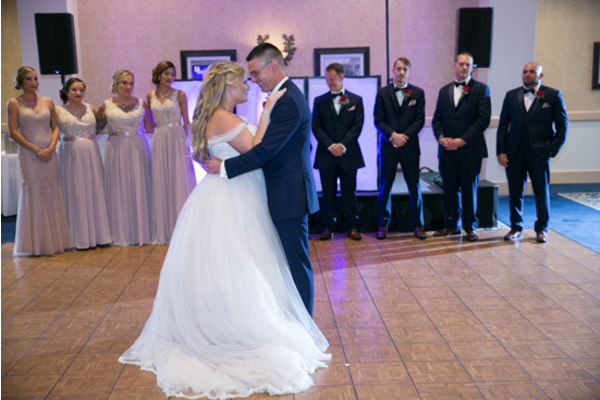 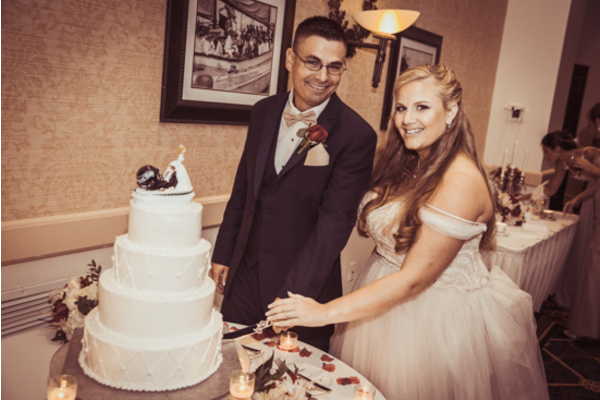 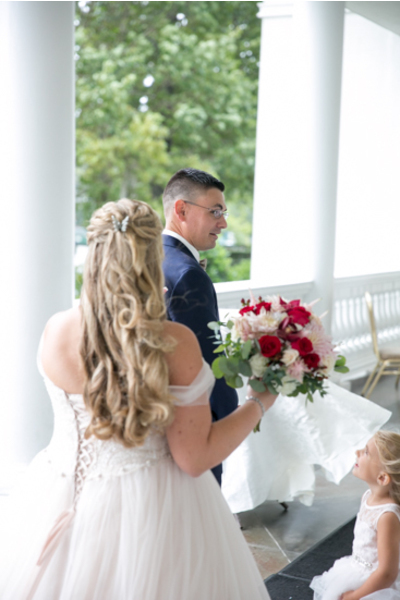 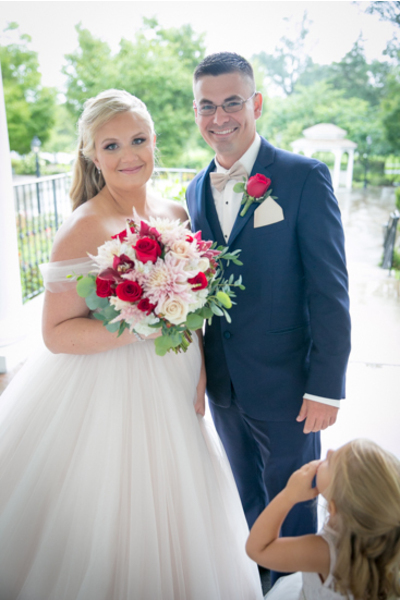 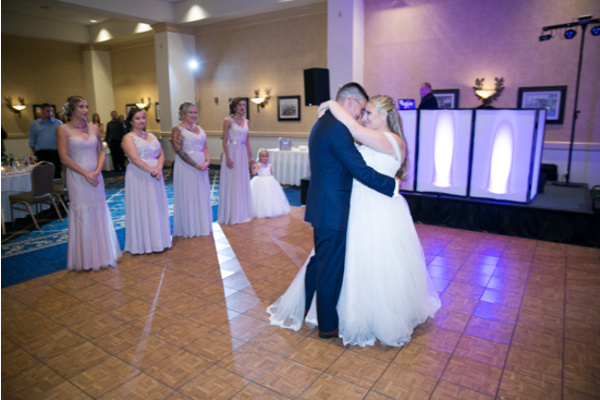 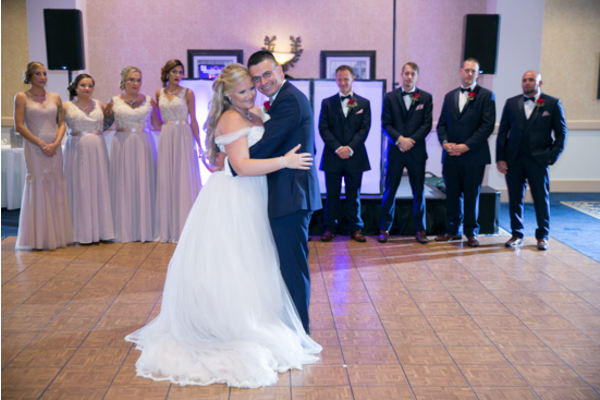 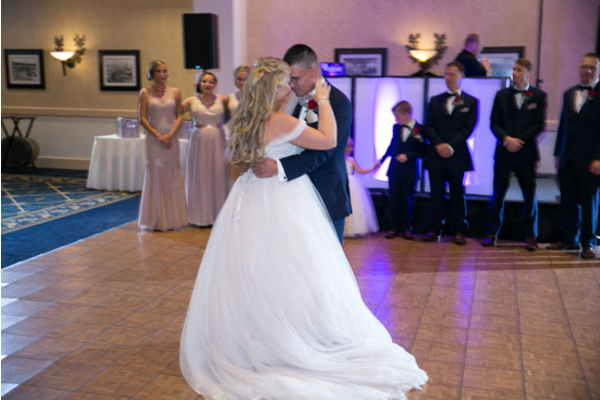 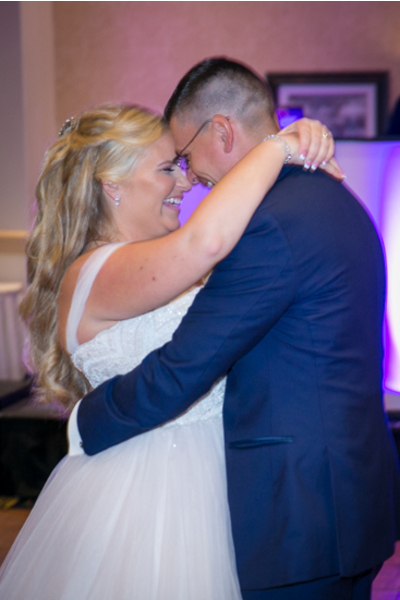 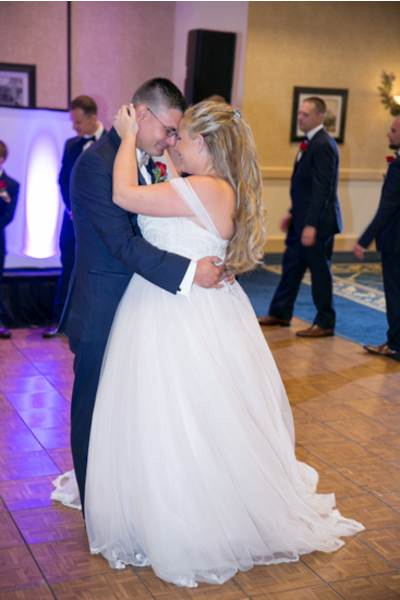 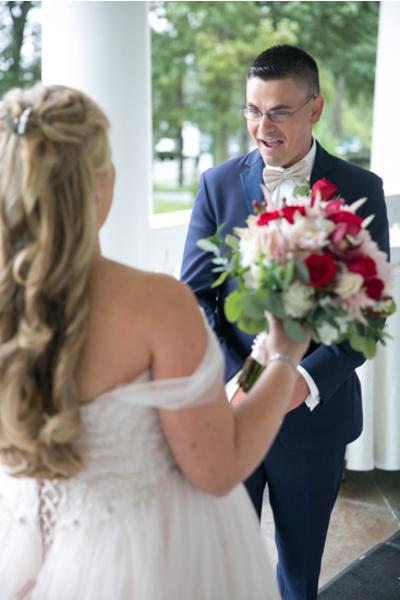 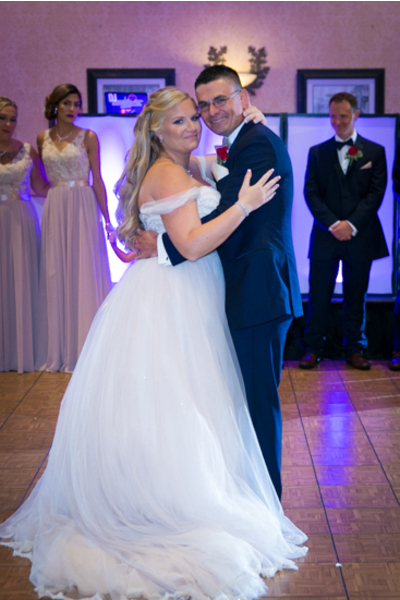 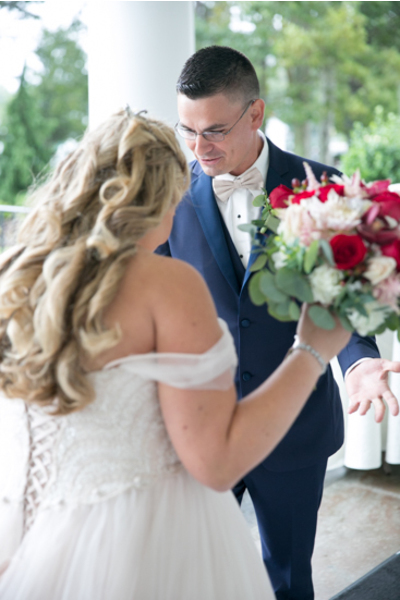 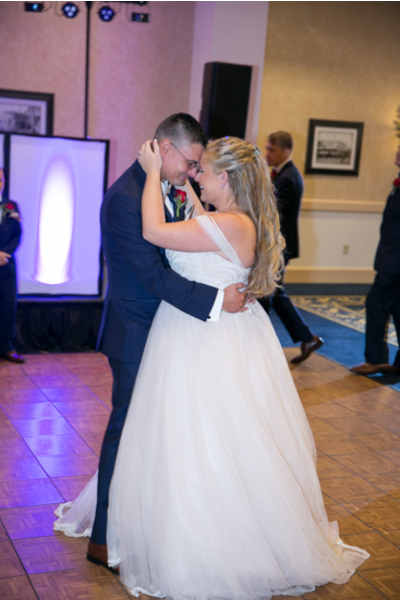 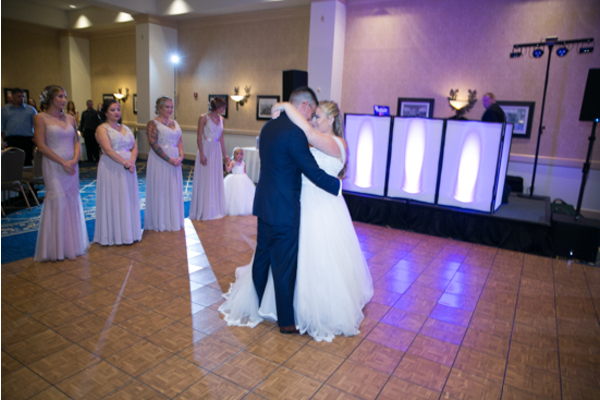 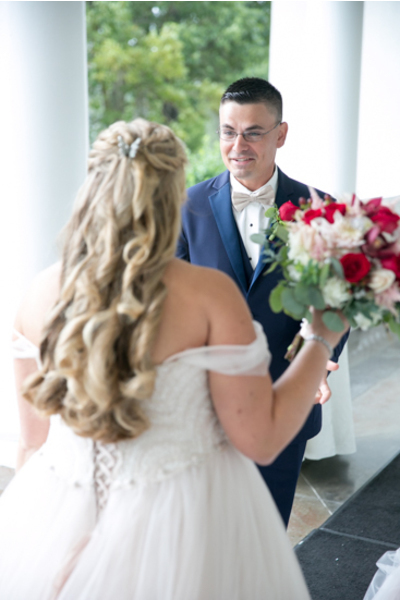 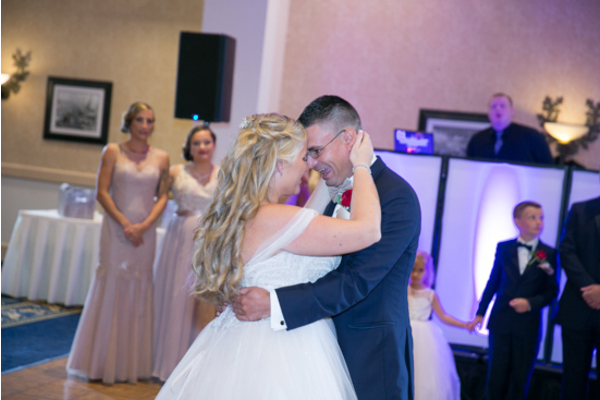 Our NJ Wedding Photographer photographed Nicole and Glenn celebrating their first moments together as newlyweds. 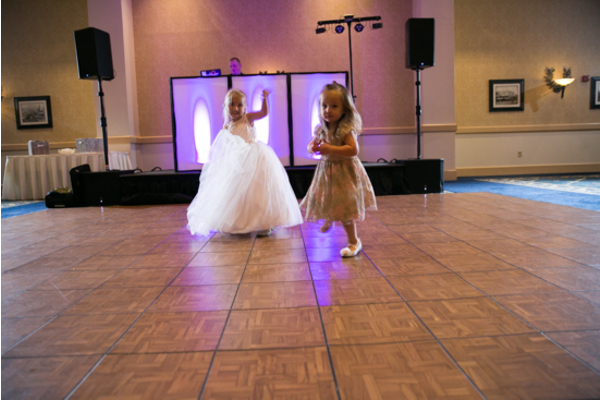 Next, it was party time! 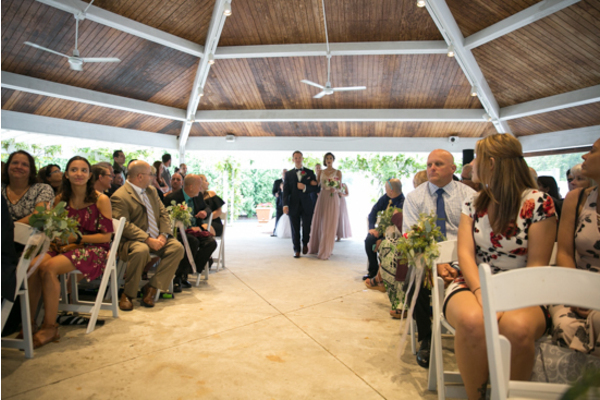 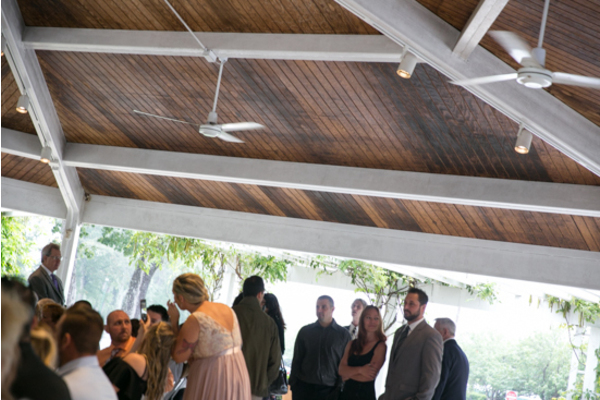 The outdoor ceremony was moved inside to a stunning open ballroom. 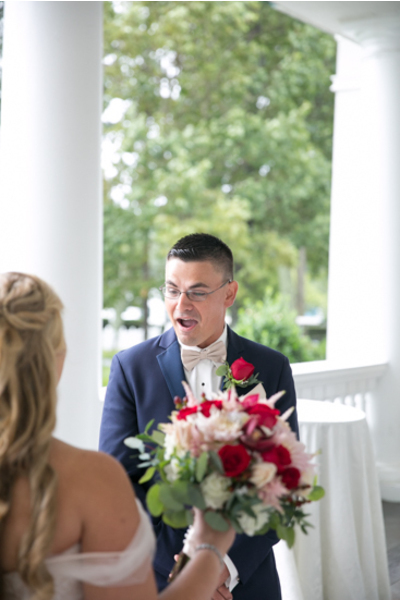 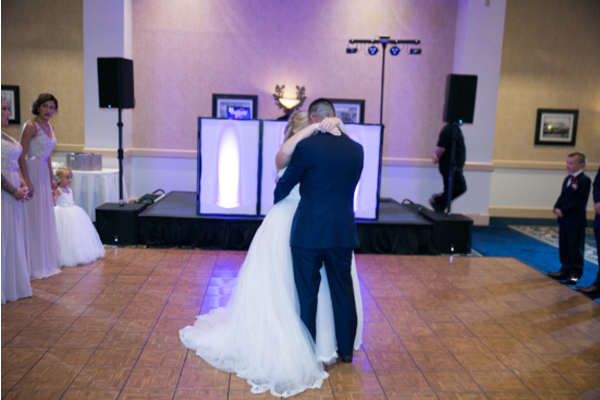 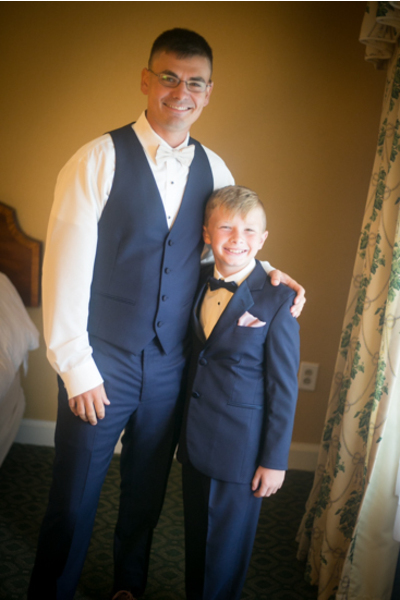 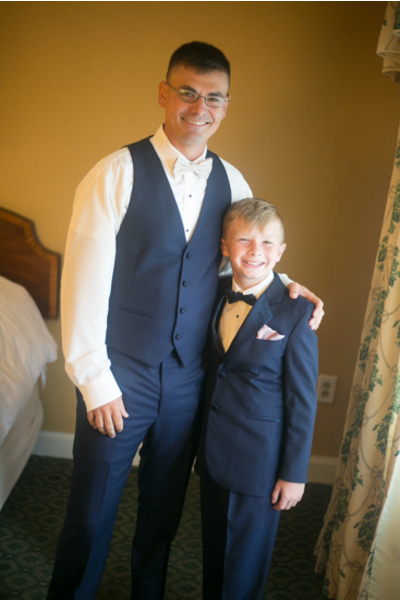 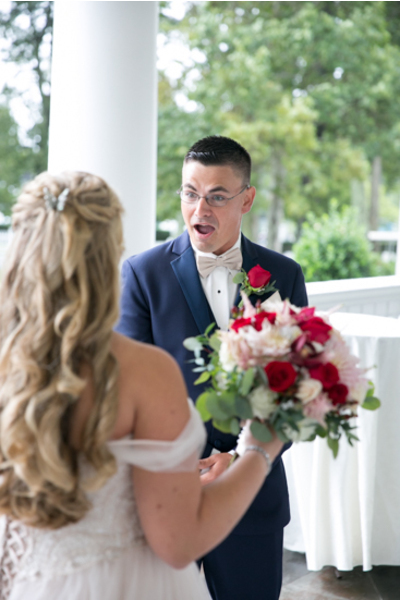 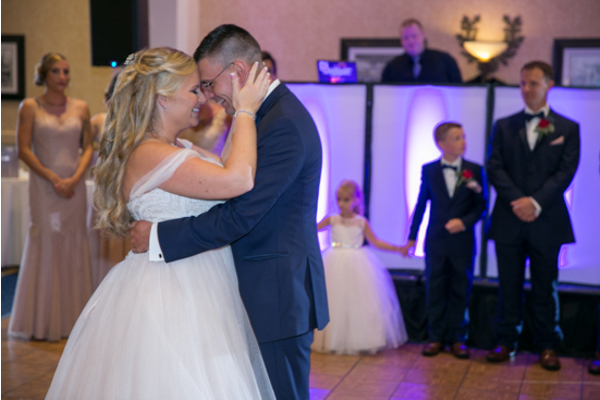 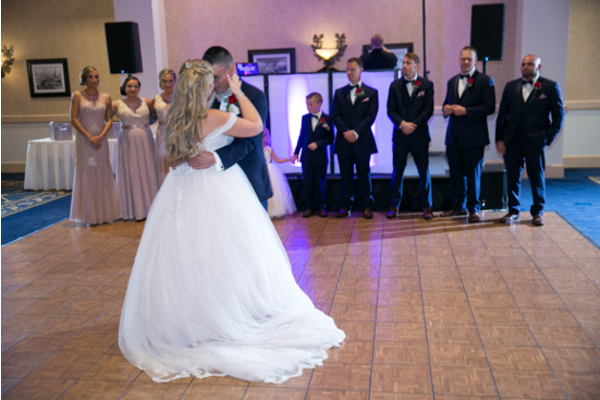 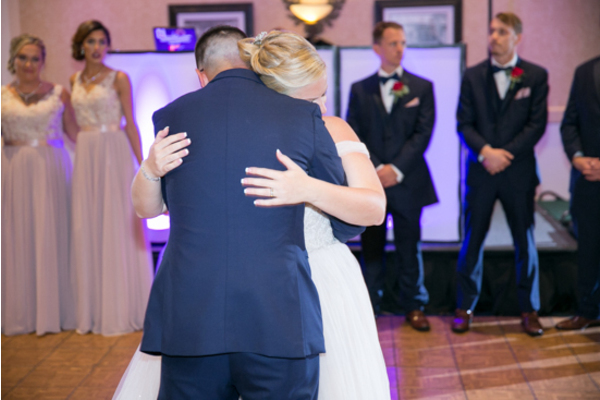 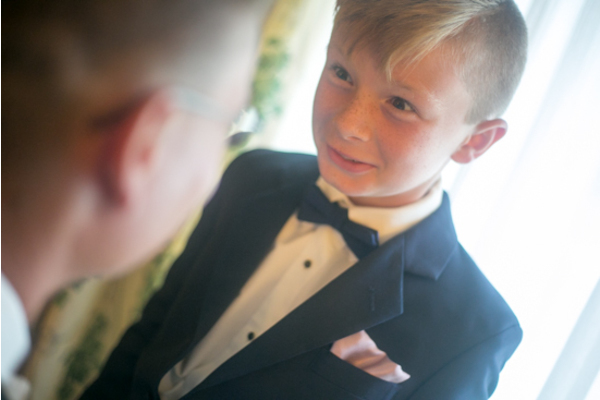 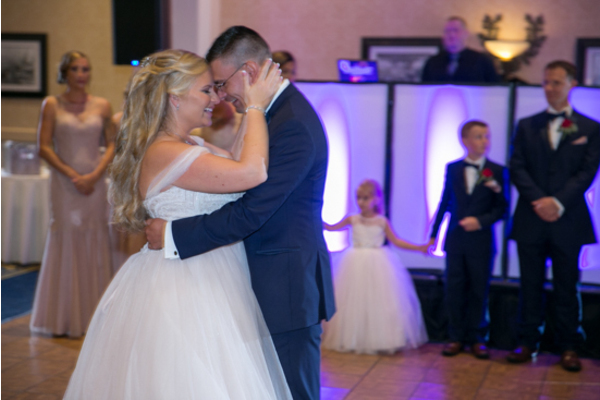 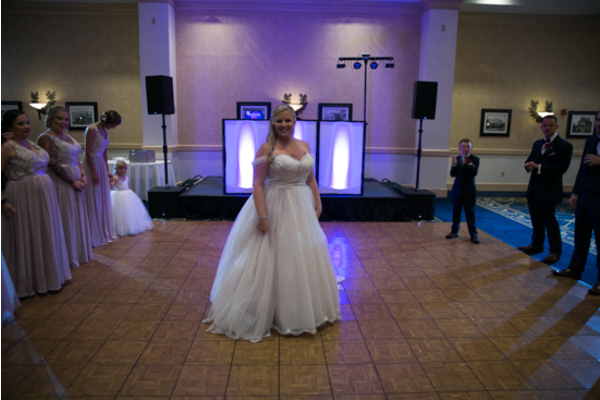 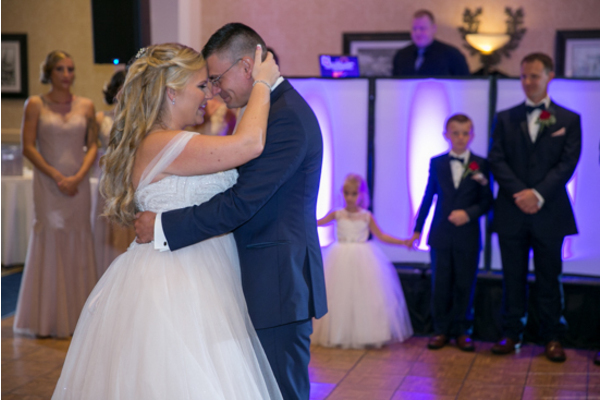 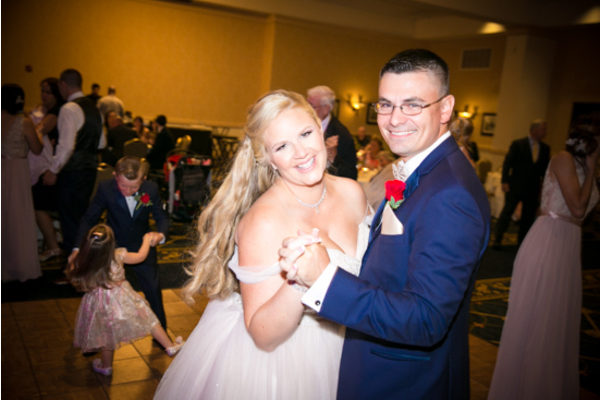 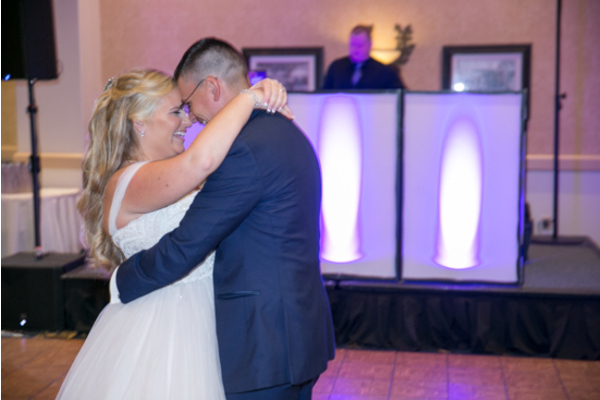 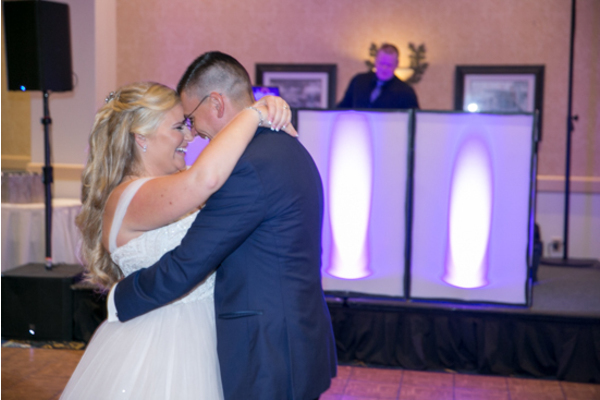 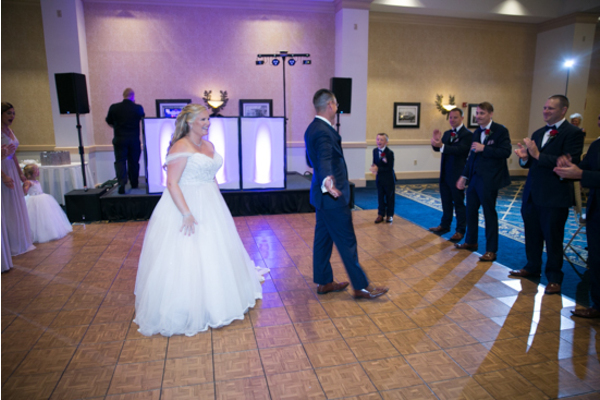 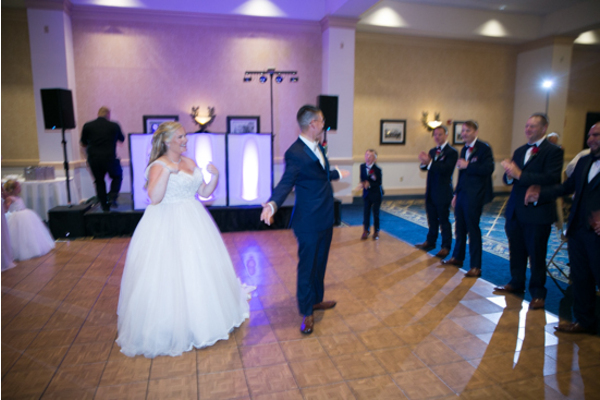 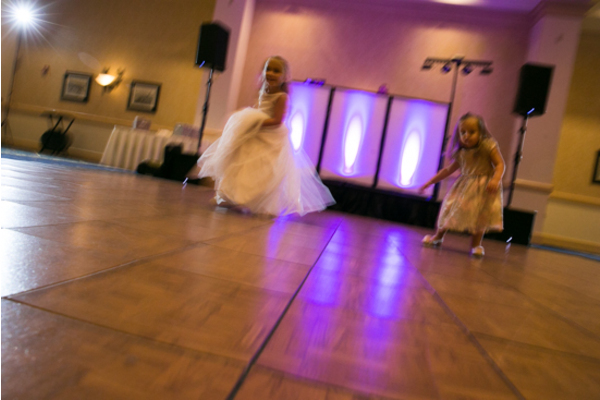 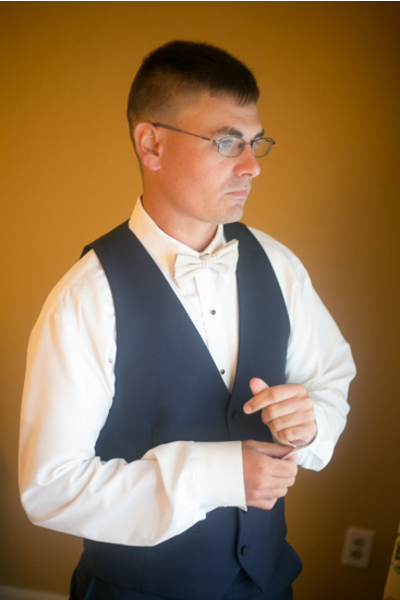 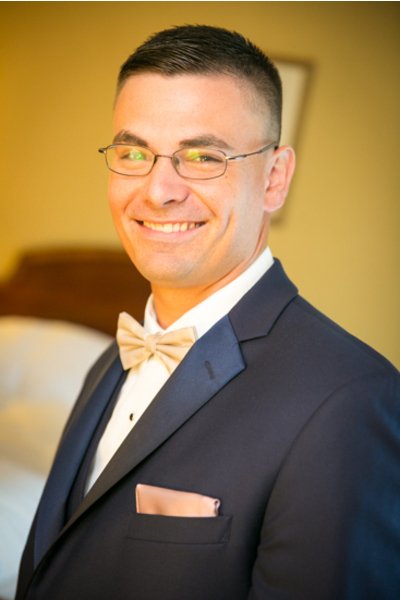 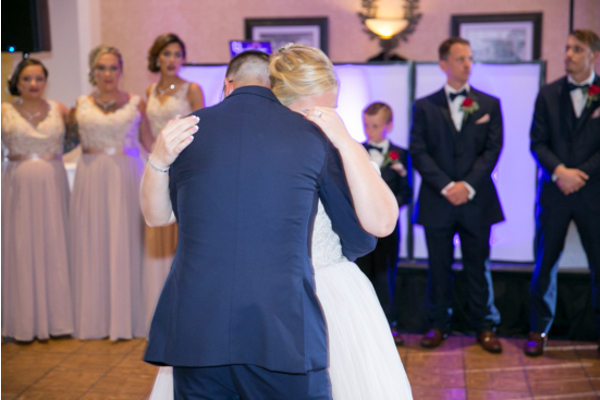 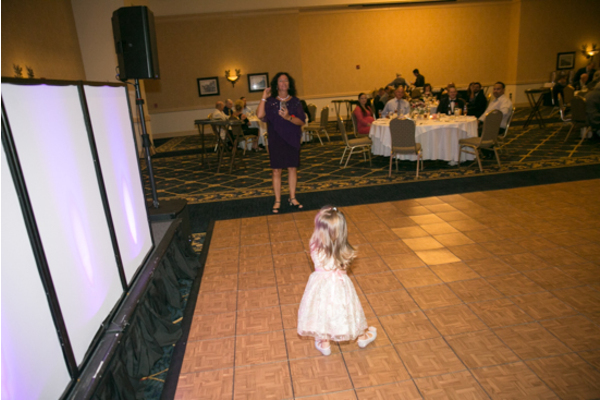 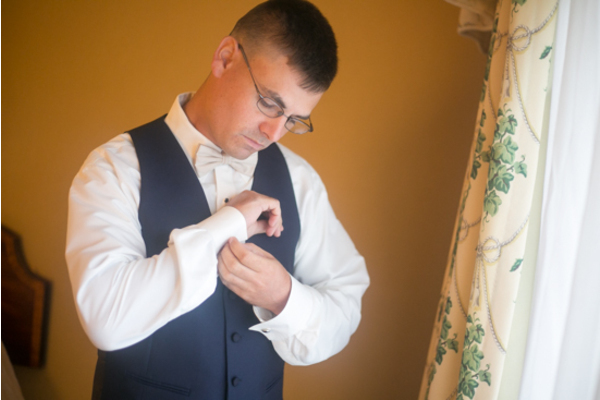 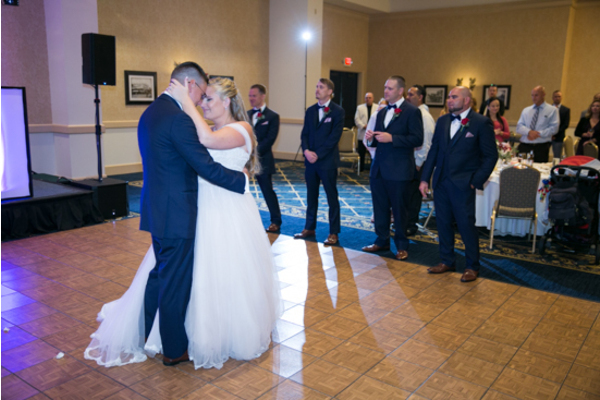 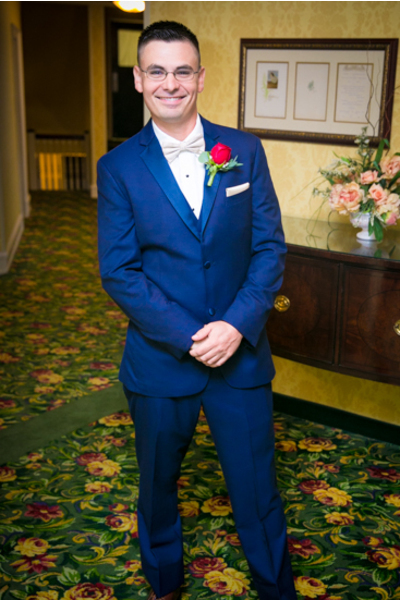 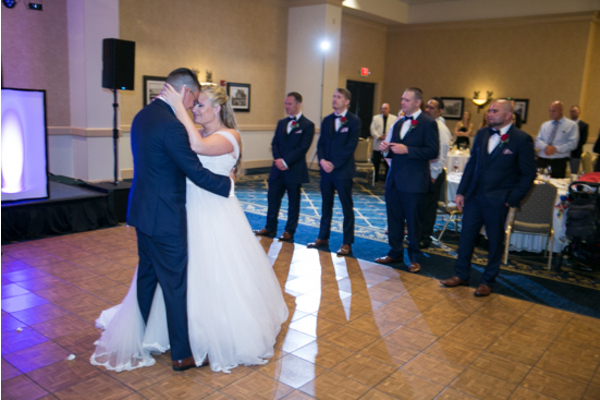 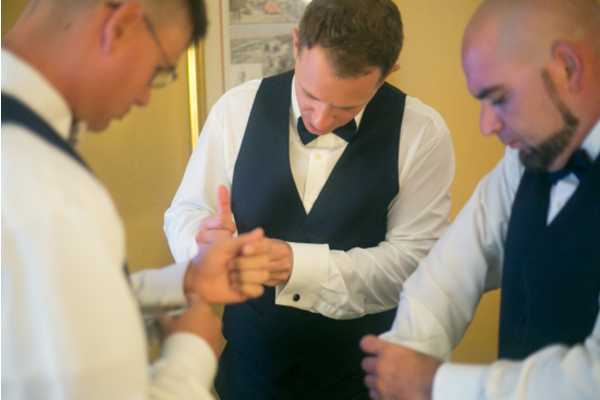 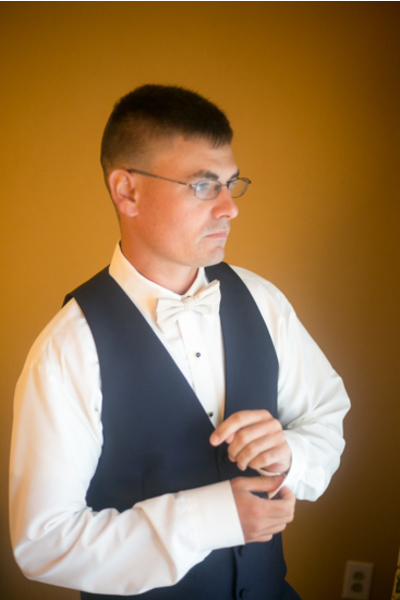 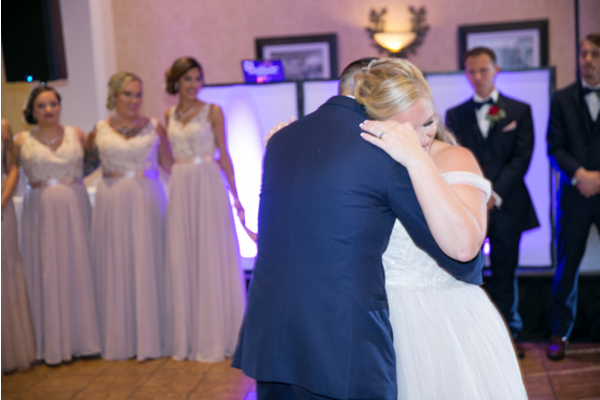 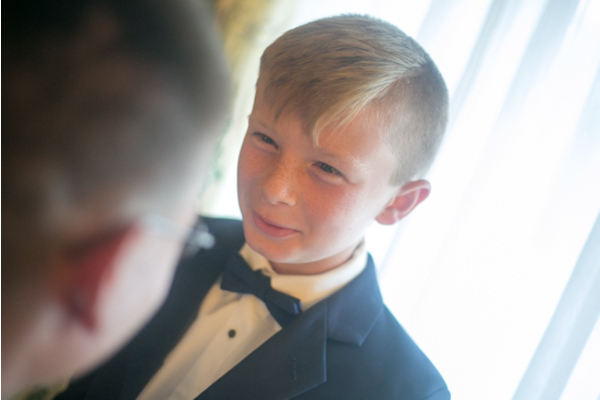 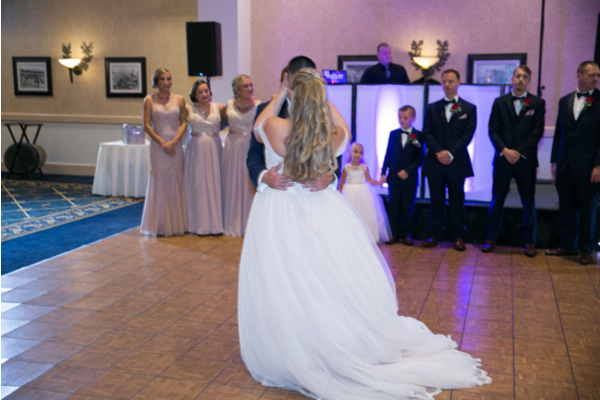 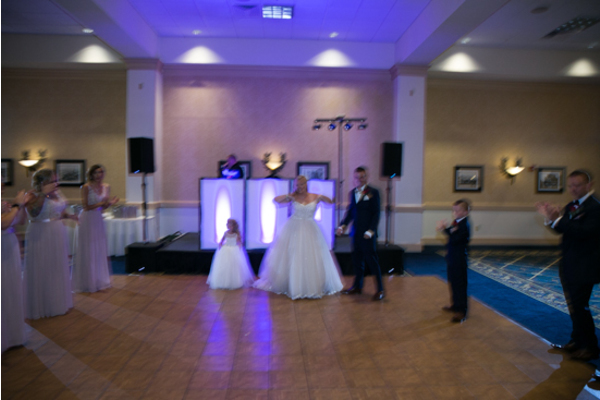 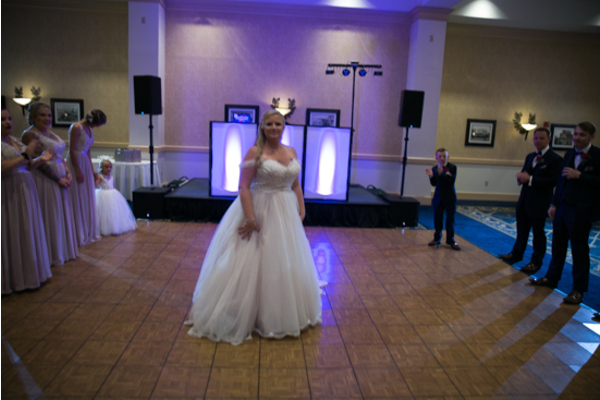 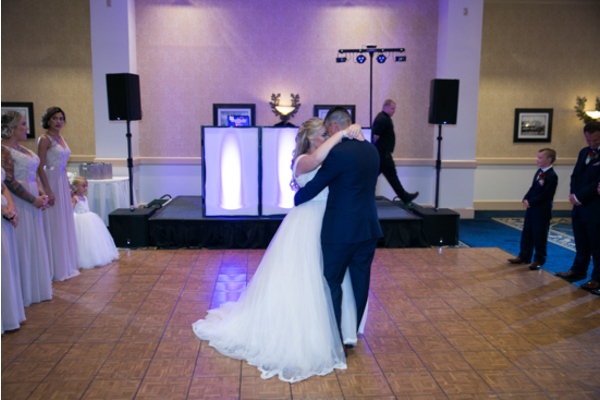 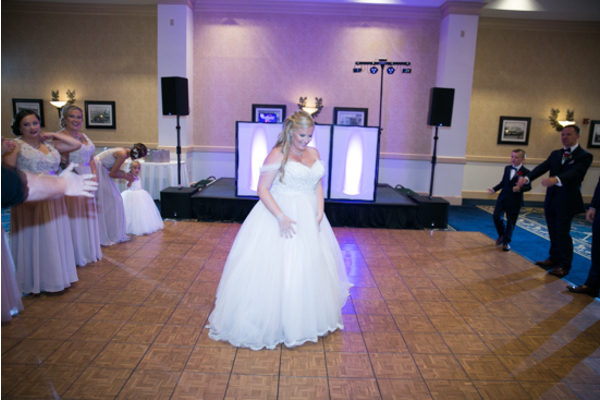 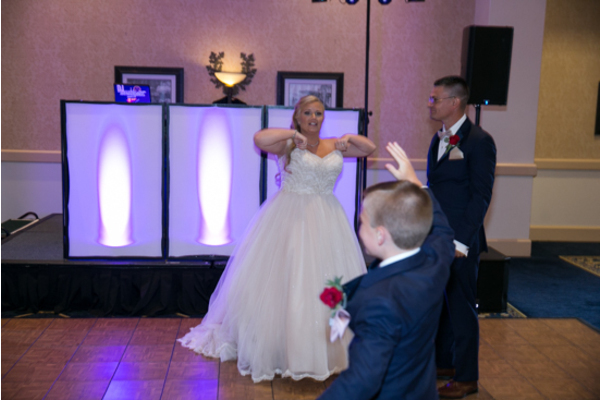 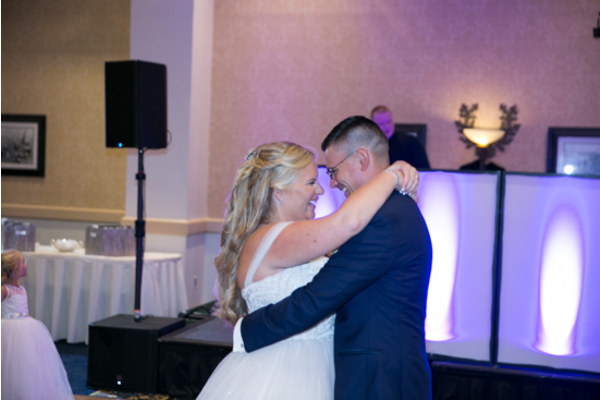 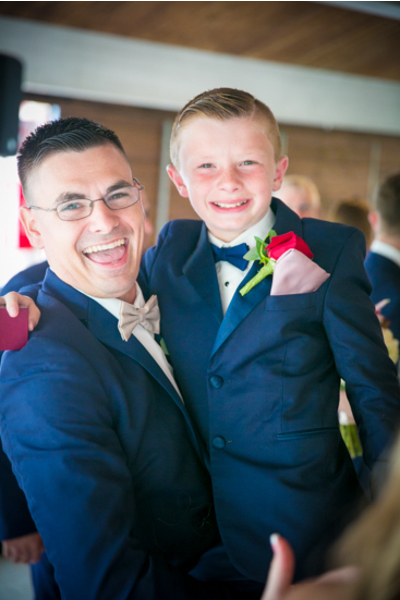 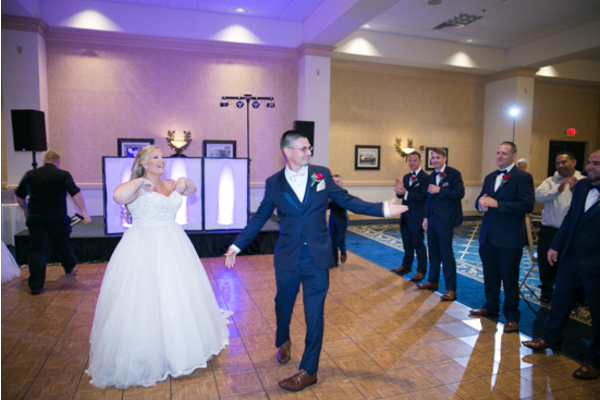 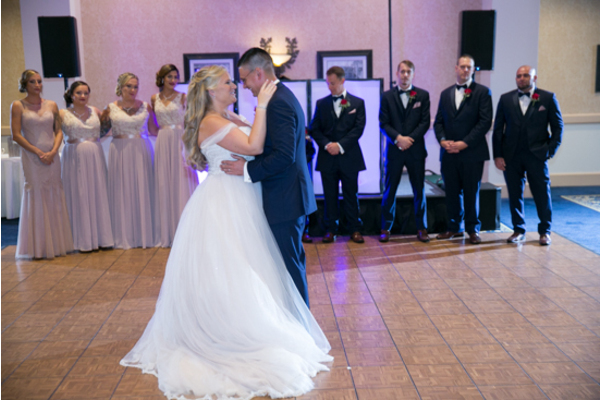 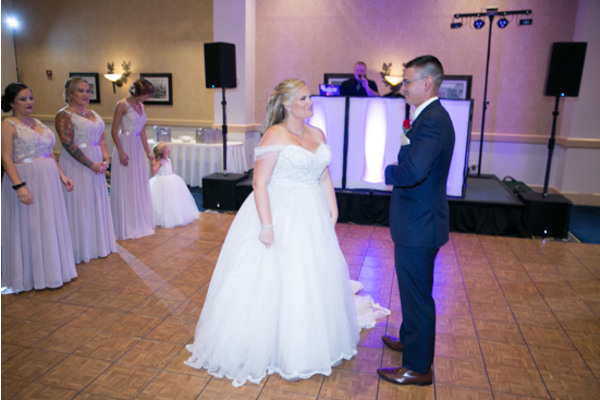 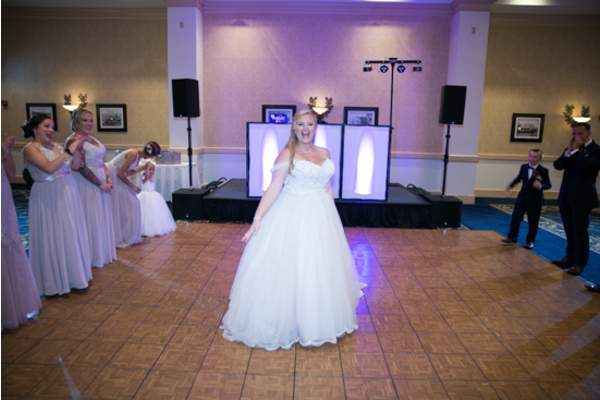 Our NJ Wedding DJ got the party started for Nicole and Glenn’s first dance and heartfelt speeches. 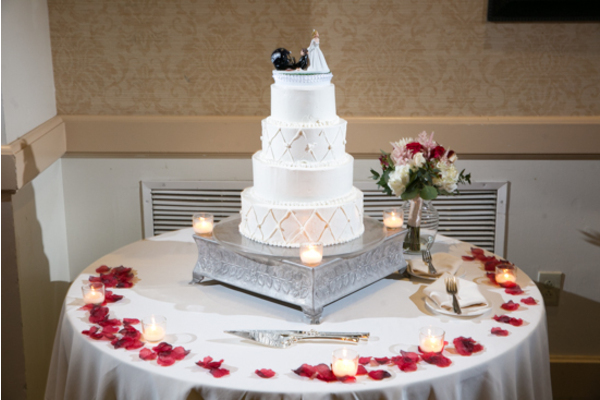 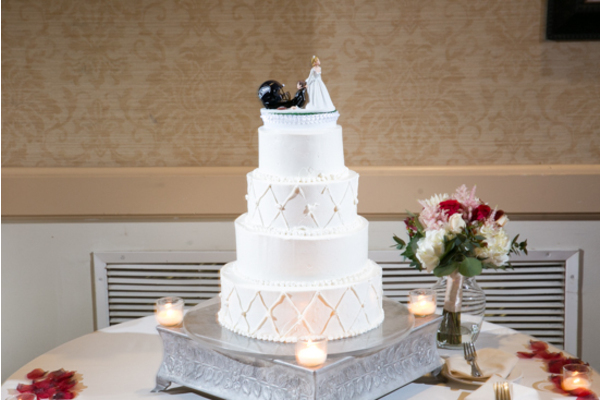 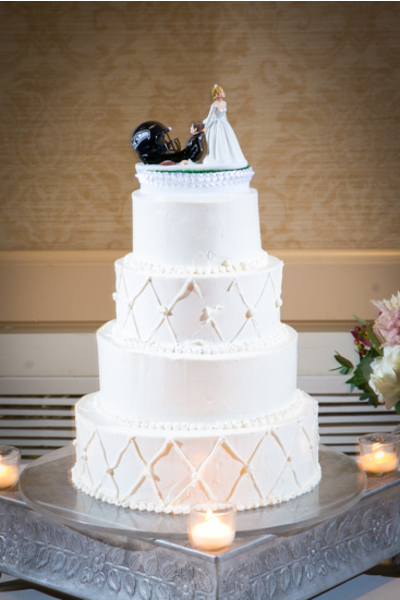 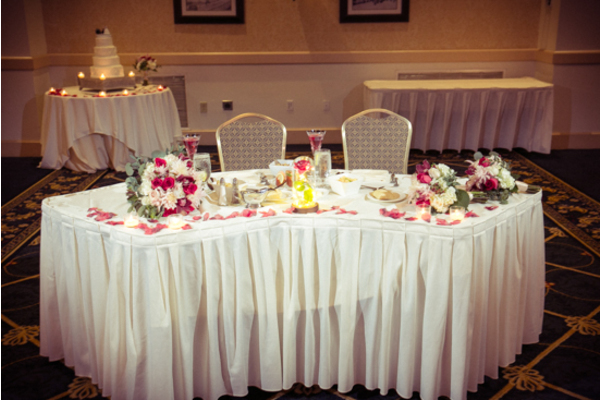 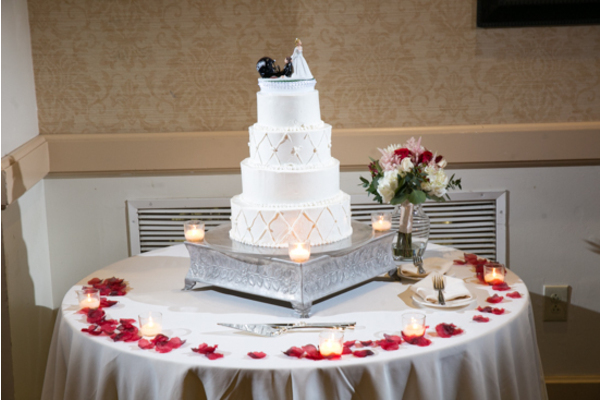 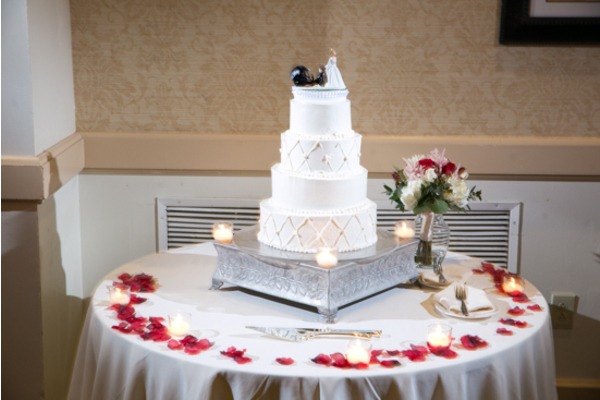 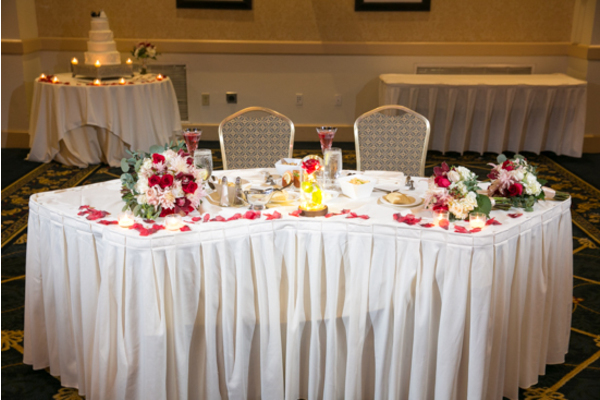 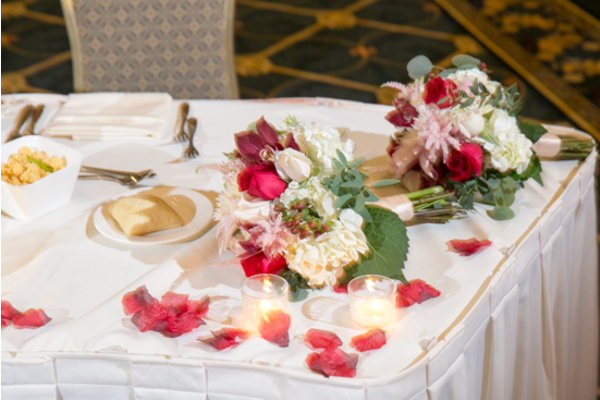 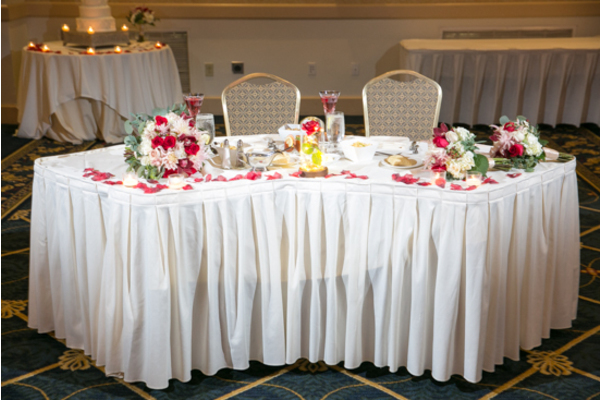 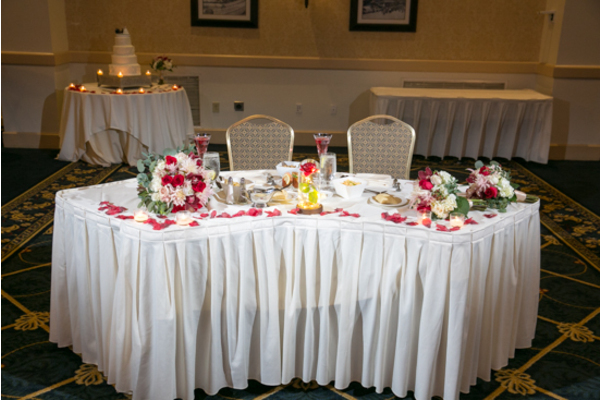 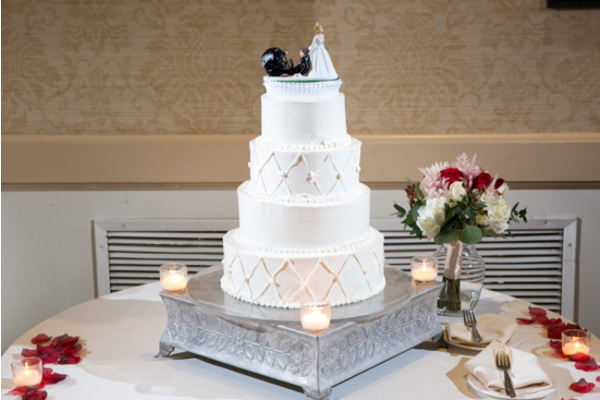 As the night began to wrap up, the couple cut their cake and tossed the bouquet. 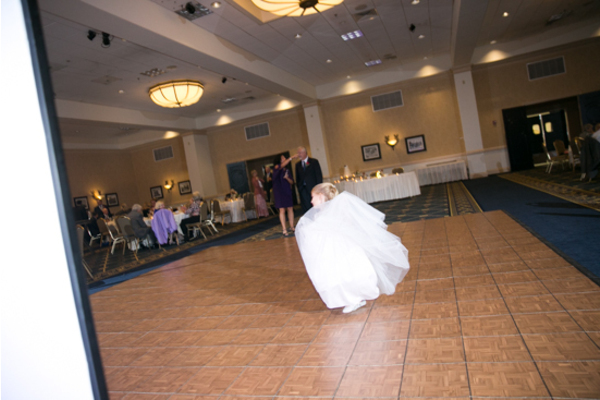 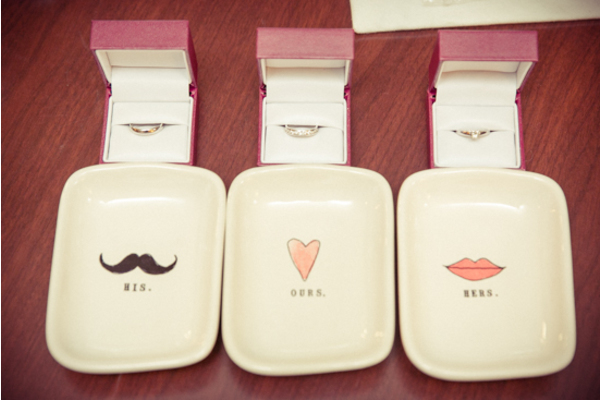 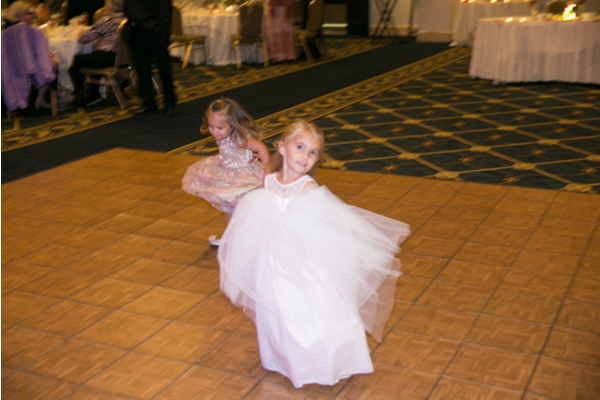 Lastly, they played a few wedding games!. 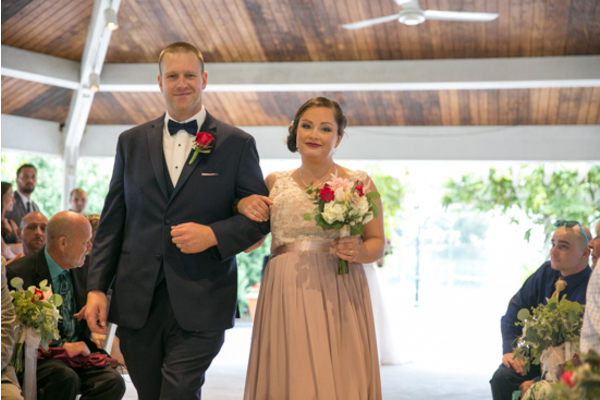 Congratulations, again to Nicole and Glenn! 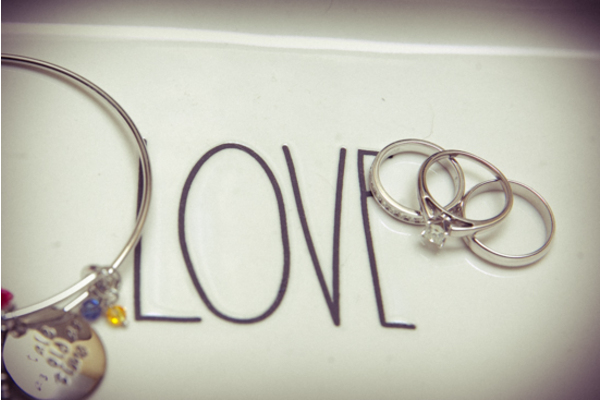 We wish you never-ending love and happiness together!